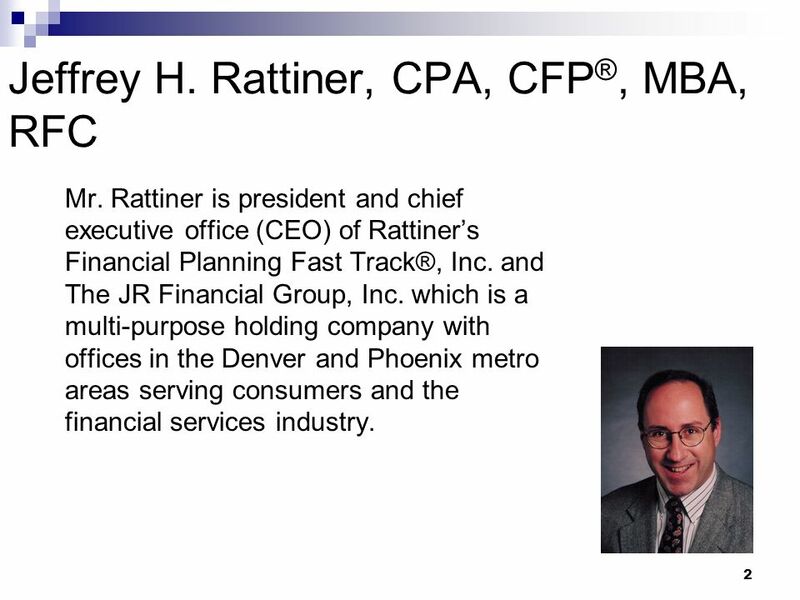 Mr. Rattiner is president and chief executive office (CEO) of Rattiner’s Financial Planning Fast Track®, Inc. and The JR Financial Group, Inc. which is a multi-purpose holding company with offices in the Denver and Phoenix metro areas serving consumers and the financial services industry. 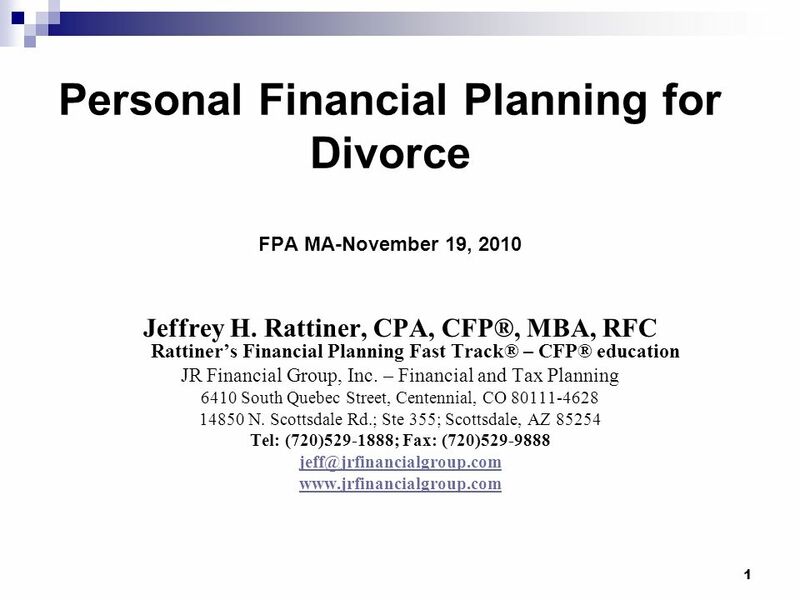 3 Training Rattiner runs the nationally acclaimed “Financial Planning Fast Track® which is a boot camp for financial advisors to take them through the education requirements mandated by the CFP Board of Standards within 7 months. 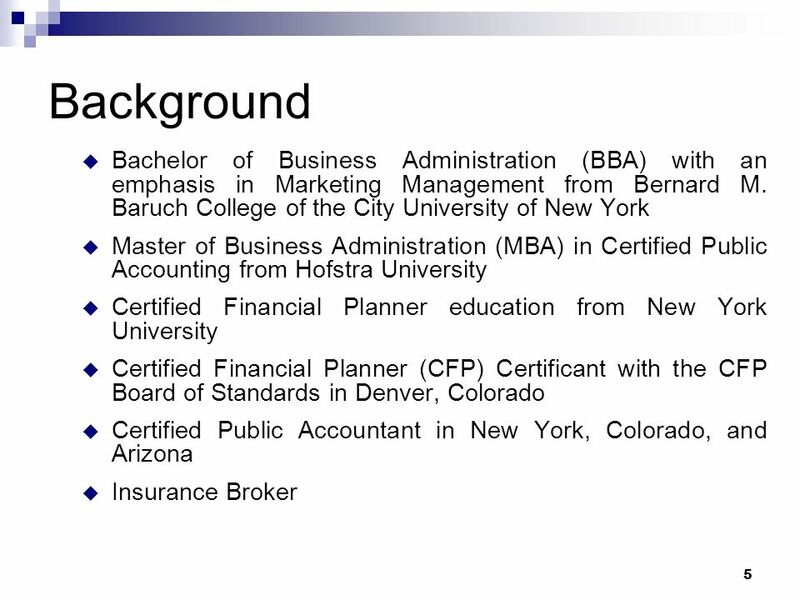 His 22+ years of preparation experience demonstrates his long-time commitment to help advisors successfully complete the CFP ® Certification Examination. 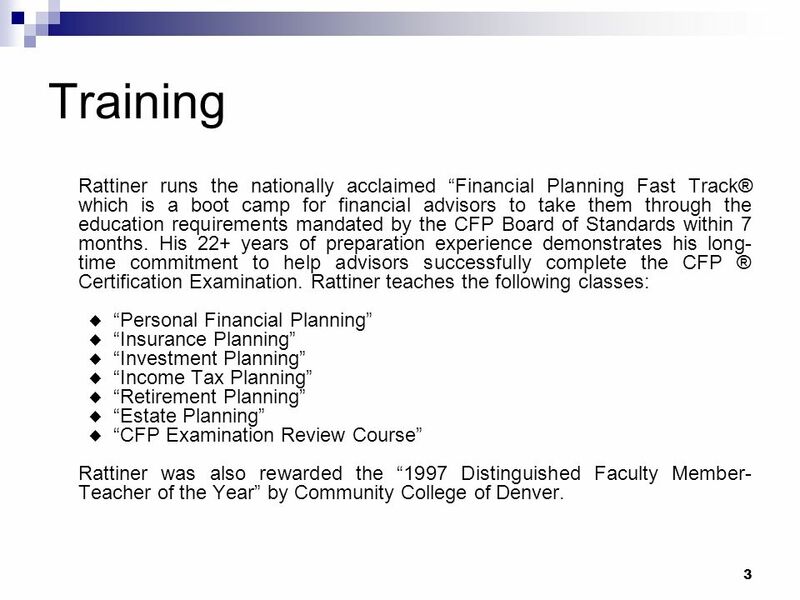 Rattiner teaches the following classes: “Personal Financial Planning” “Insurance Planning” “Investment Planning” “Income Tax Planning” “Retirement Planning” “Estate Planning” “CFP Examination Review Course” Rattiner was also rewarded the “1997 Distinguished Faculty Member-Teacher of the Year” by Community College of Denver. 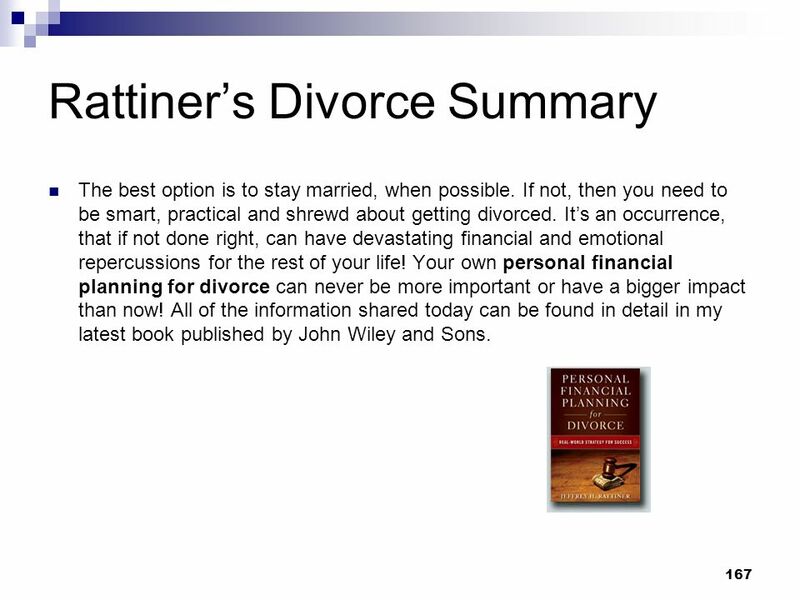 4 Writing Personal Financial Planning for Divorce: Real World Solutions – John Wiley & Sons “Rattiner’s Review for the CFP Certification Examination - Fast Track” – (3nd ed.) 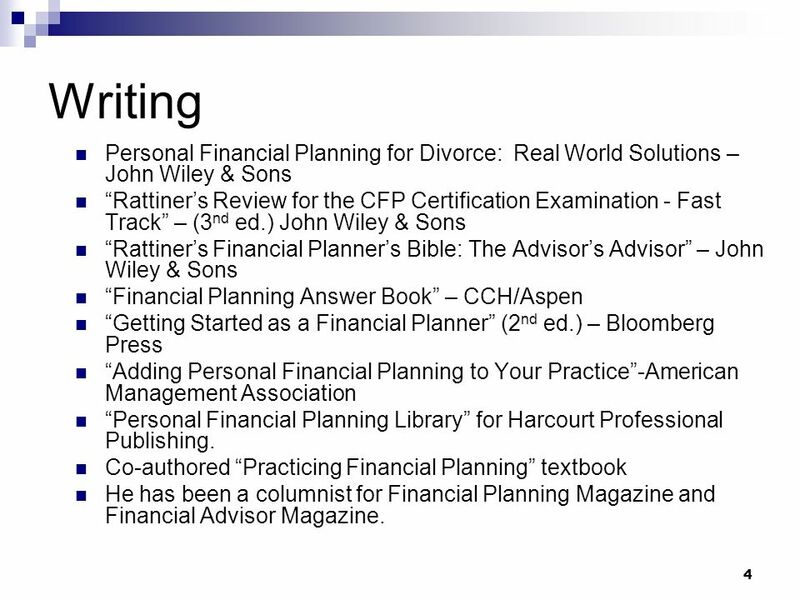 John Wiley & Sons “Rattiner’s Financial Planner’s Bible: The Advisor’s Advisor” – John Wiley & Sons “Financial Planning Answer Book” – CCH/Aspen “Getting Started as a Financial Planner” (2nd ed.) 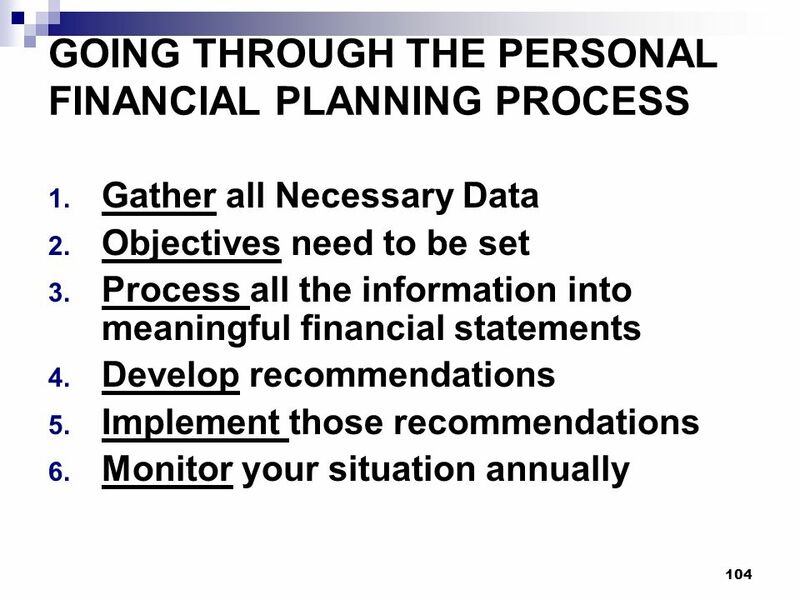 – Bloomberg Press “Adding Personal Financial Planning to Your Practice”-American Management Association “Personal Financial Planning Library” for Harcourt Professional Publishing. Co-authored “Practicing Financial Planning” textbook He has been a columnist for Financial Planning Magazine and Financial Advisor Magazine. 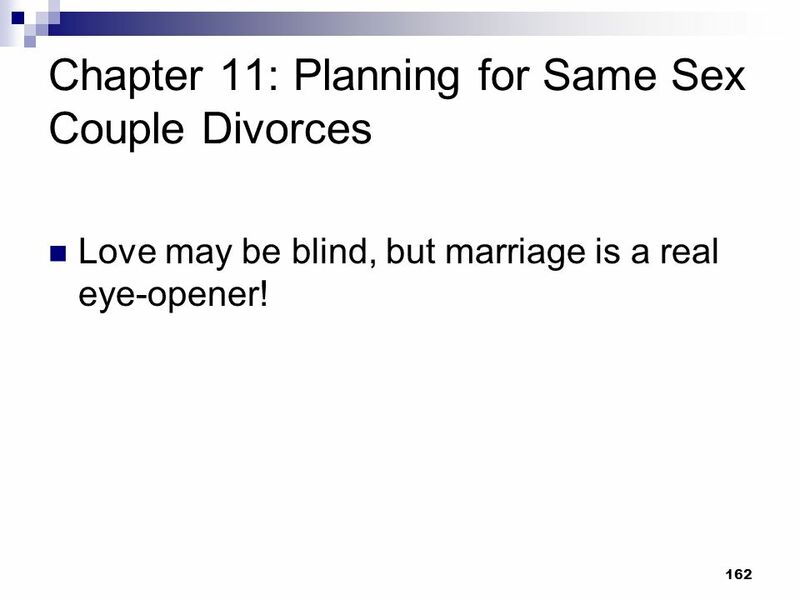 8 Chapter 1: What is Marriage? 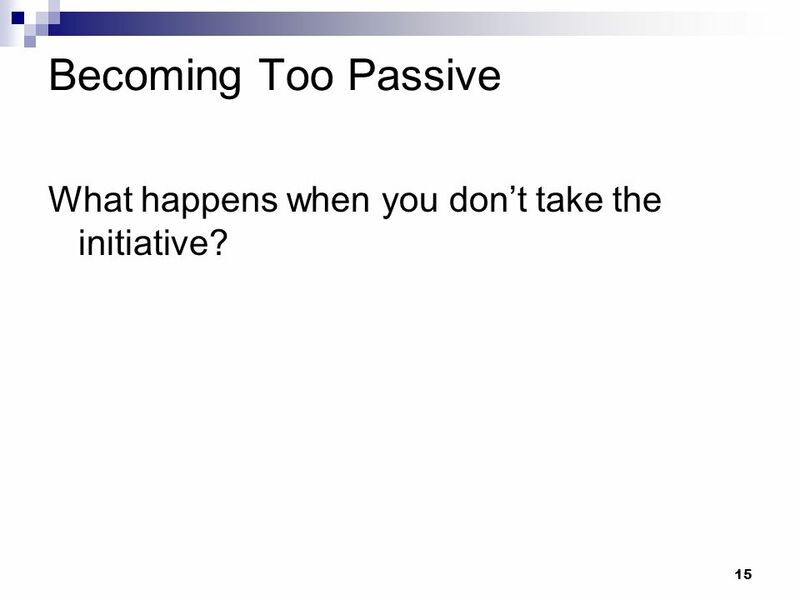 15 Becoming Too Passive What happens when you don’t take the initiative? 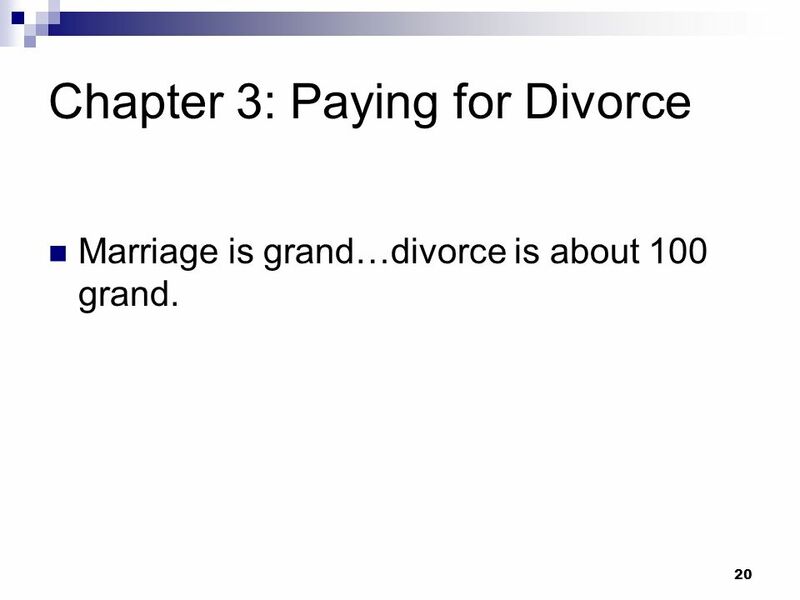 Marriage is grand…divorce is about 100 grand. 22 Costs Involved: What Should You Pay For & For How Long? 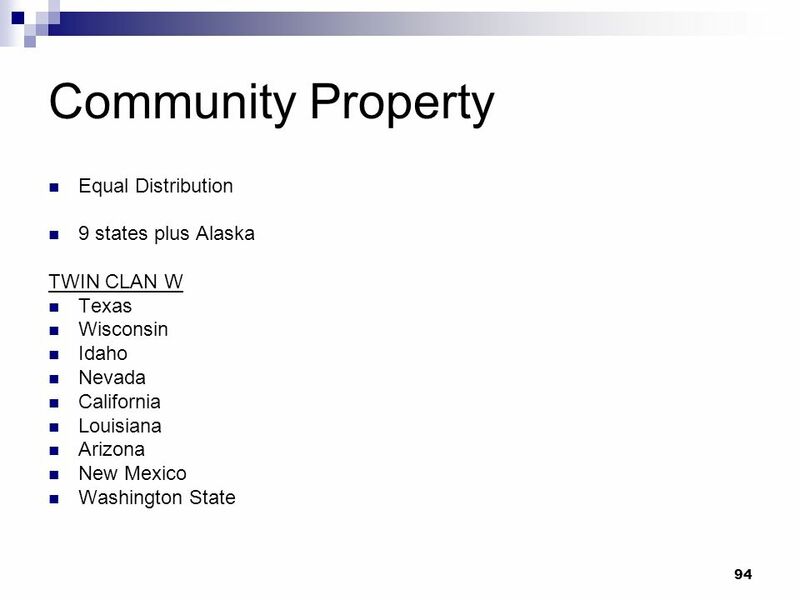 26 Separate Property Keep separate! 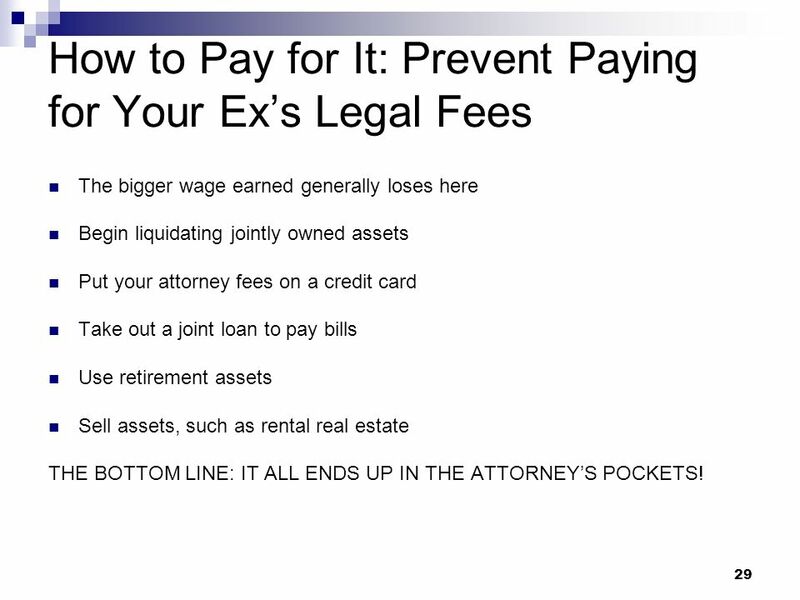 The bigger wage earned generally loses here Begin liquidating jointly owned assets Put your attorney fees on a credit card Take out a joint loan to pay bills Use retirement assets Sell assets, such as rental real estate THE BOTTOM LINE: IT ALL ENDS UP IN THE ATTORNEY’S POCKETS! 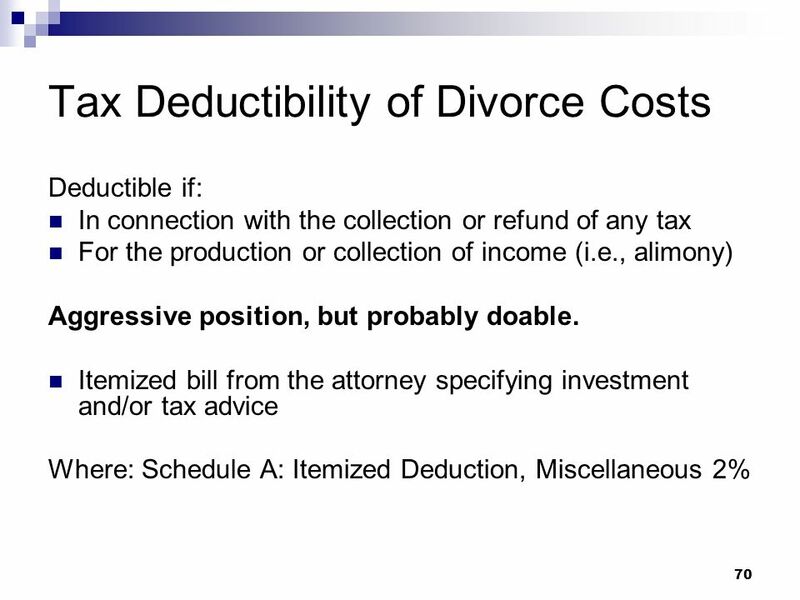 Many costs show up for the first time during the divorce process. Take an accounting of what each one represents before you act on it. 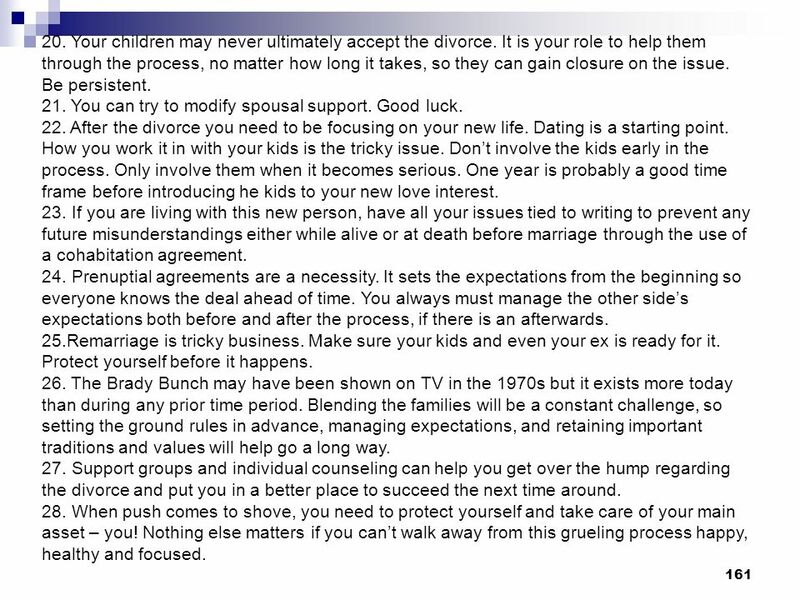 Try to shorten the divorce process, where possible. 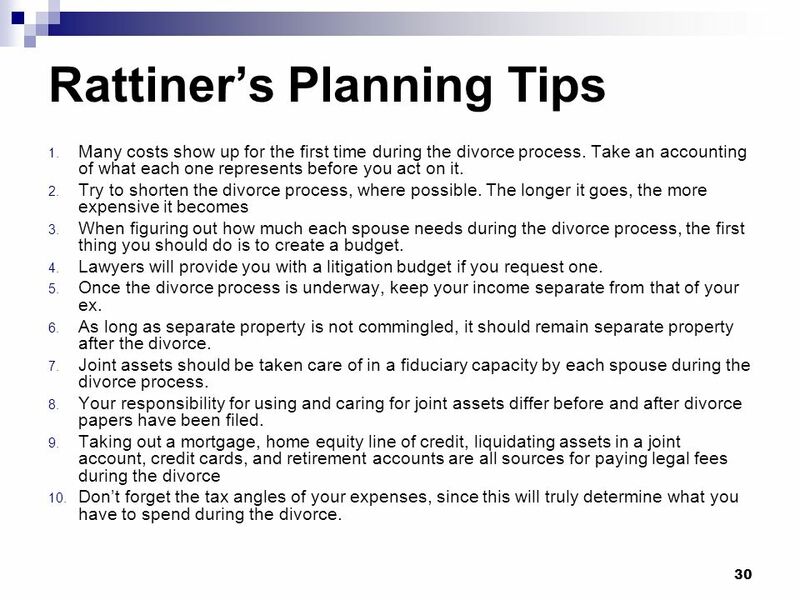 The longer it goes, the more expensive it becomes When figuring out how much each spouse needs during the divorce process, the first thing you should do is to create a budget. 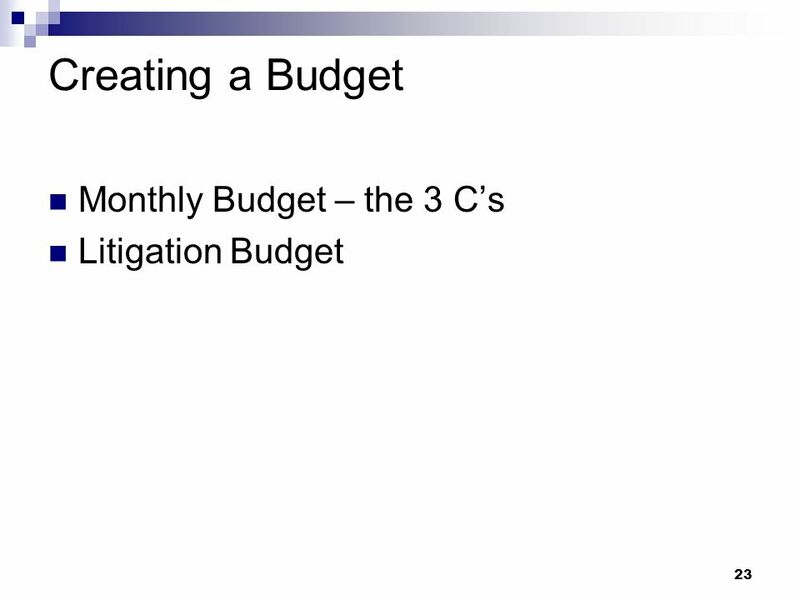 Lawyers will provide you with a litigation budget if you request one. 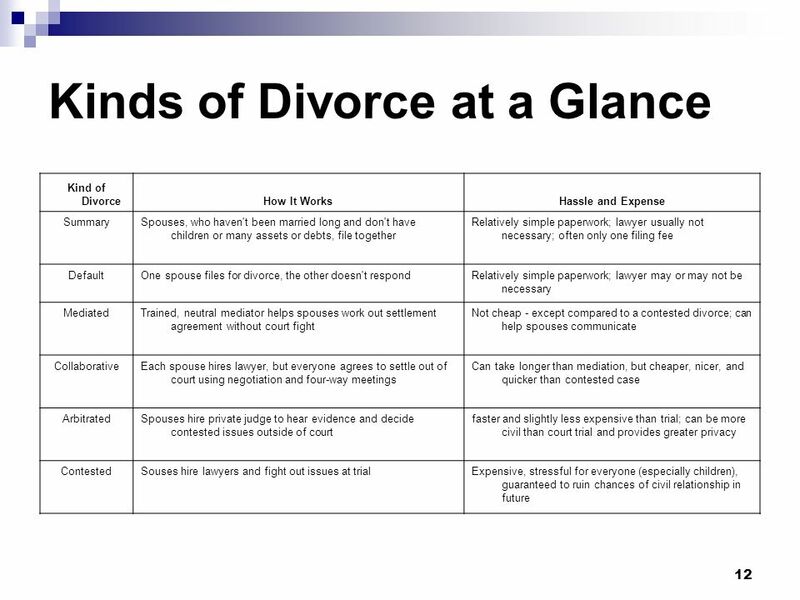 Once the divorce process is underway, keep your income separate from that of your ex. 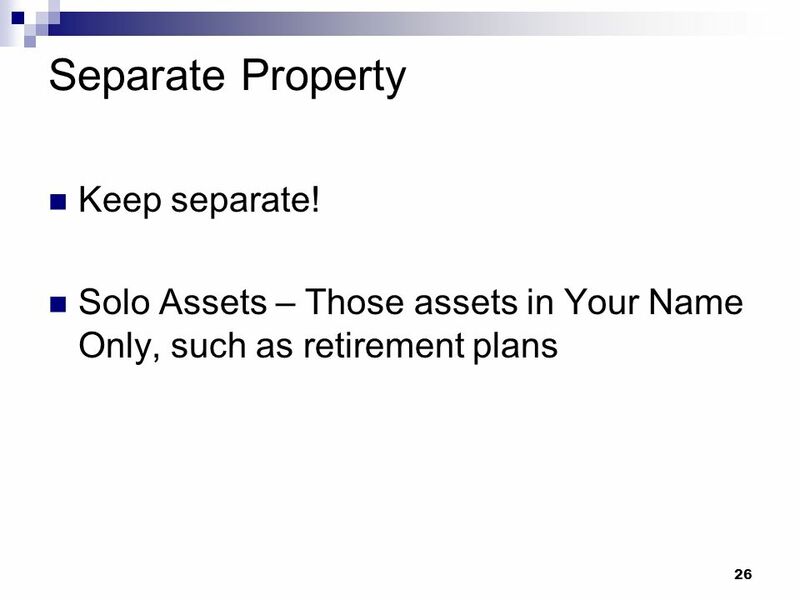 As long as separate property is not commingled, it should remain separate property after the divorce. 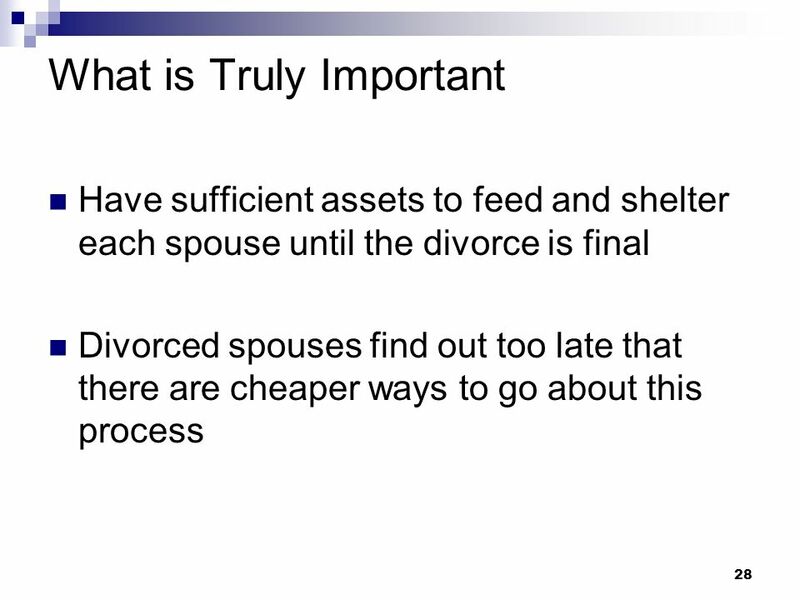 Joint assets should be taken care of in a fiduciary capacity by each spouse during the divorce process. Your responsibility for using and caring for joint assets differ before and after divorce papers have been filed. 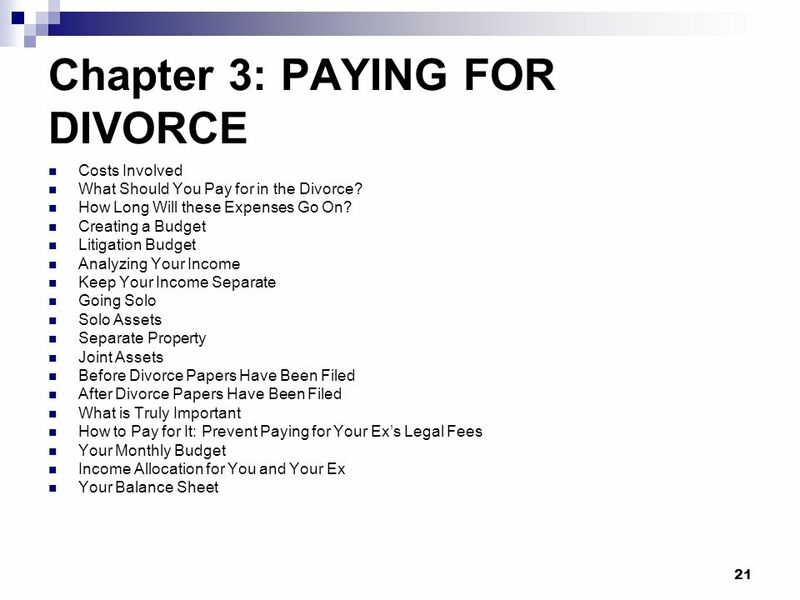 Taking out a mortgage, home equity line of credit, liquidating assets in a joint account, credit cards, and retirement accounts are all sources for paying legal fees during the divorce Don’t forget the tax angles of your expenses, since this will truly determine what you have to spend during the divorce. 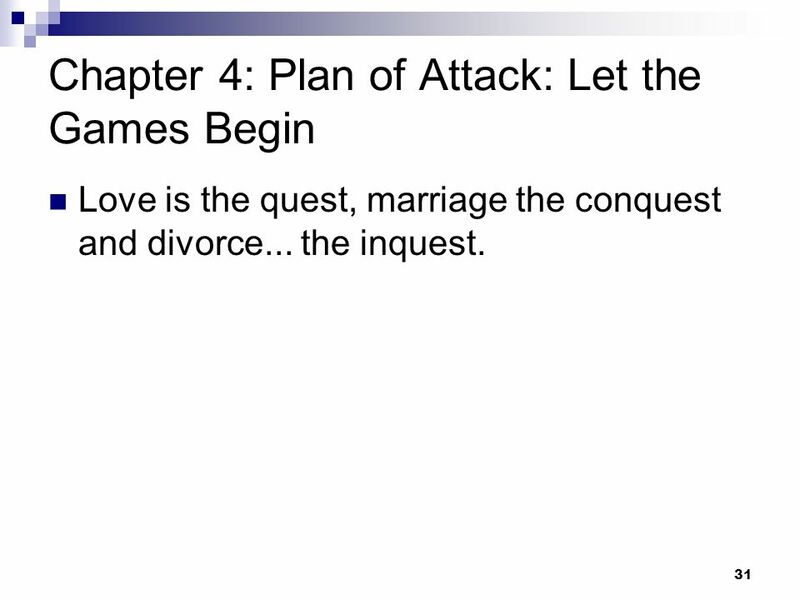 Love is the quest, marriage the conquest and divorce... the inquest. 33 Taking Your Ex Out I KNOW WHAT YOU’RE THINKING! 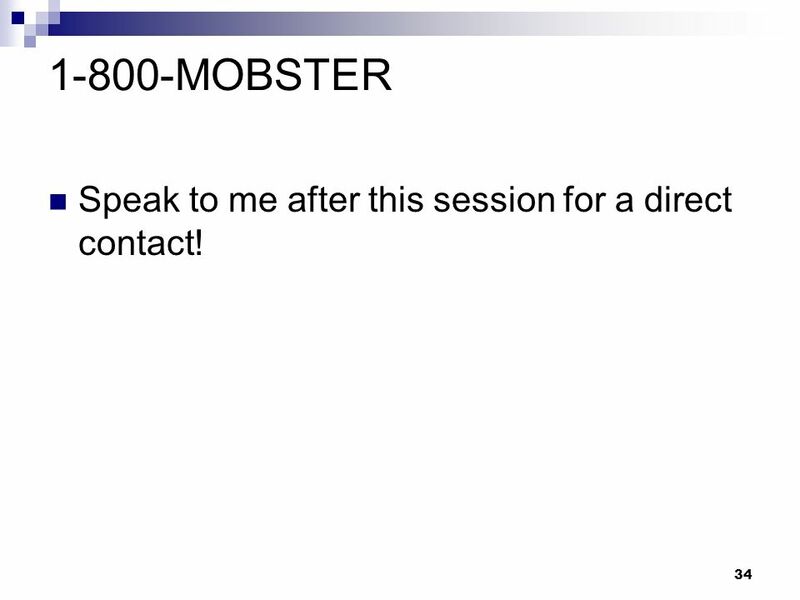 34 1-800-MOBSTER Speak to me after this session for a direct contact! 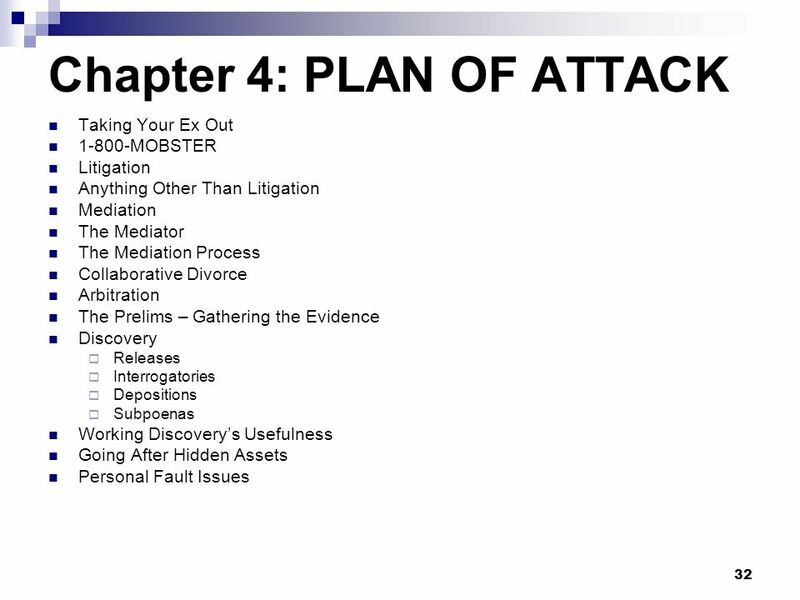 35 Litigation Avoid at all costs! What is your style of mediation? Do you have a specialty? Do you see couples separately and/or together? How do you charge and what are your fees? 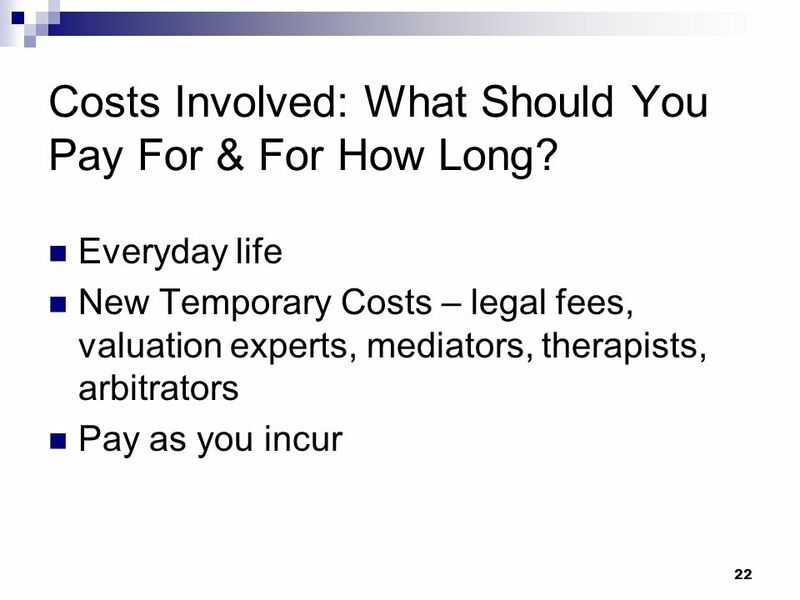 How many mediations have you performed? Is this your full time job? What kind of background or training have you had? Are you a judge? How do you work with spouses who each have their own attorney? 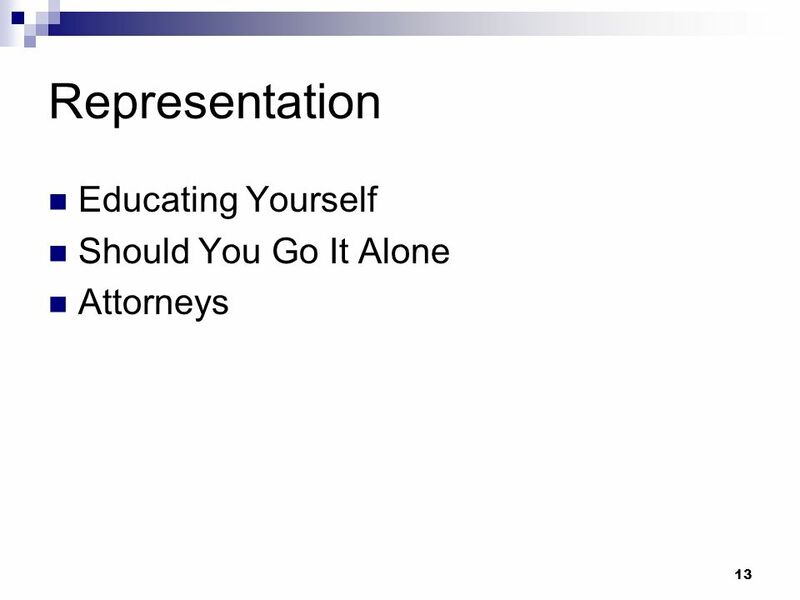 Are attorneys part of the process or do you refer legal issues to them directly? What do you do if you see the mediation process breaking down? 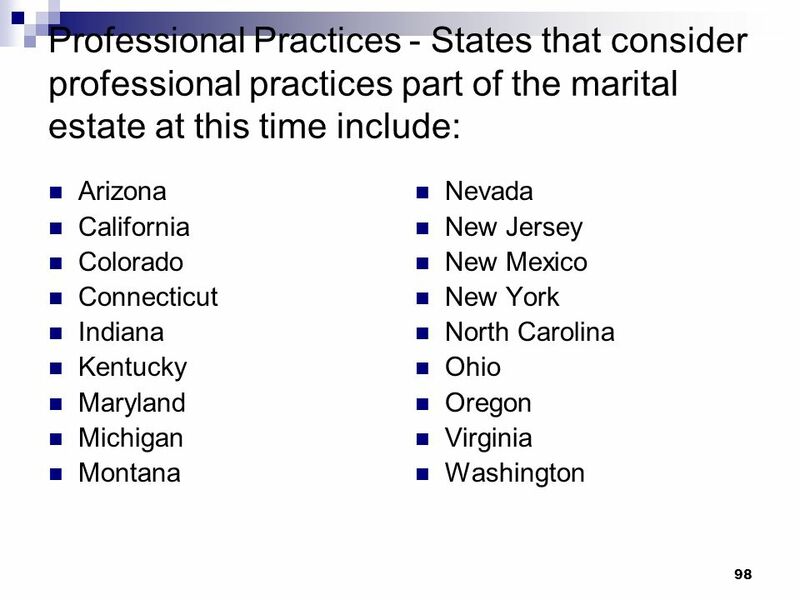 Do you work with and refer spouses to other professionals, such as CPAs, CFPs, attorneys, therapists, etc.? How is confidentiality handled? Are you willing to testify in court, if need be? It never pays to take your ex out. 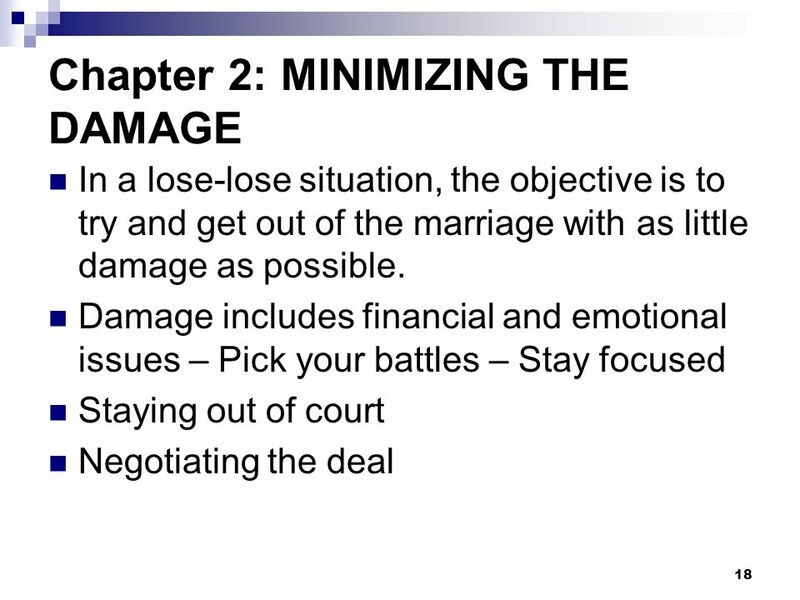 Be smart about the entire divorce process. Look at the big picture. 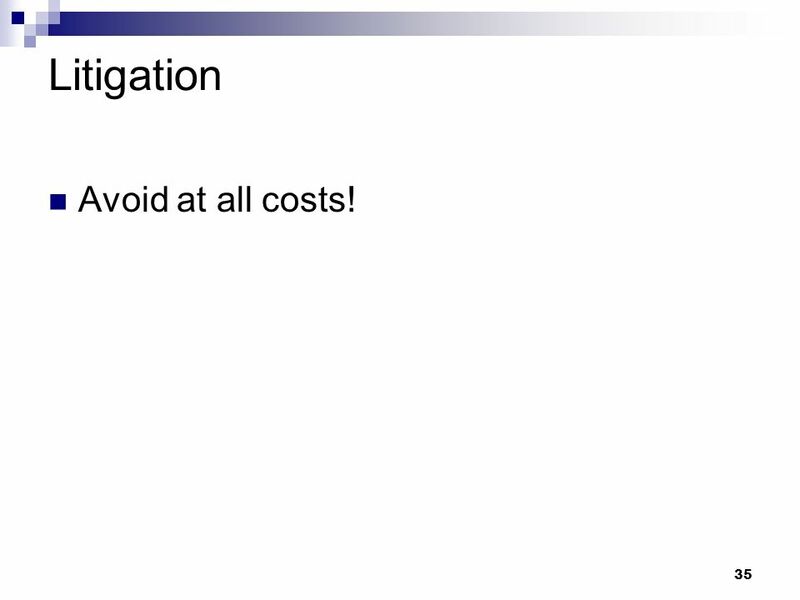 Avoid litigation at all cost. It is too expensive, too demanding and will not enable you to get the result you are trying to achieve. You can’t control the ultimate outcome. Mediation is a better bet if you and your ex can agree to it. Having an independent person be the referee allows for a more equitable settlement. 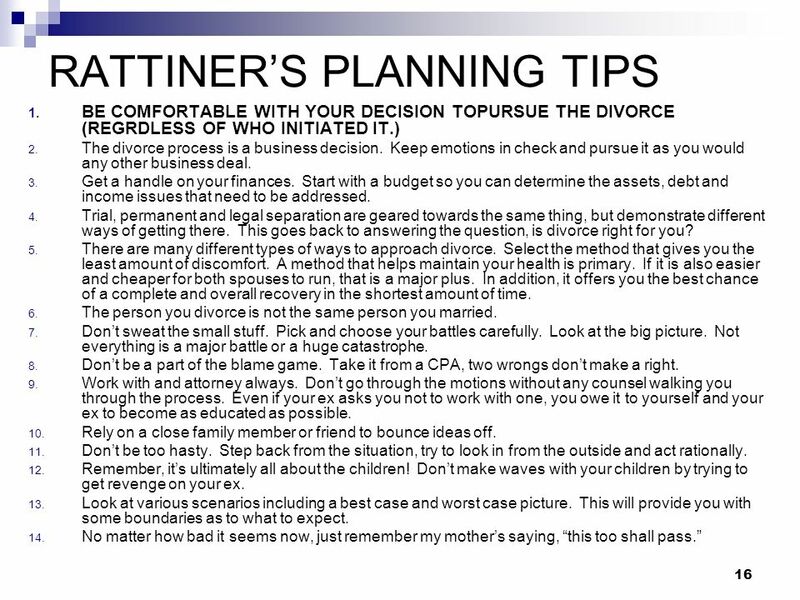 Remember, you’ll never be happy with the final outcome, but it will help minimize the damage and hopefully provide you with a settlement you both can live with. Hire a former judge as the mediator. That person has the experience necessary to understand the issues, close the gap and wrap up the case. You always want to employ a no nonsense approach to be implemented by a no nonsense judge. 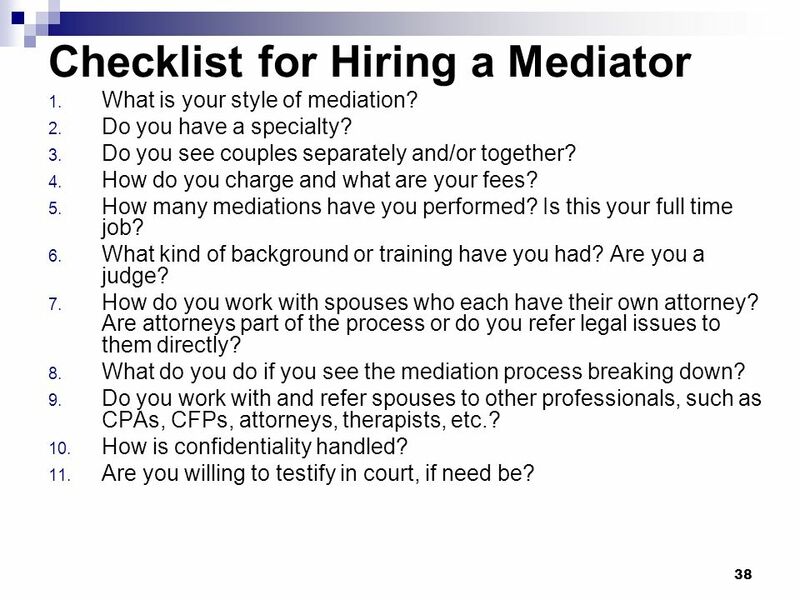 Make sure you understand the mediation process before moving forward. It puts both spouses on the same playing field looking for similarities between the parties rather than differences. 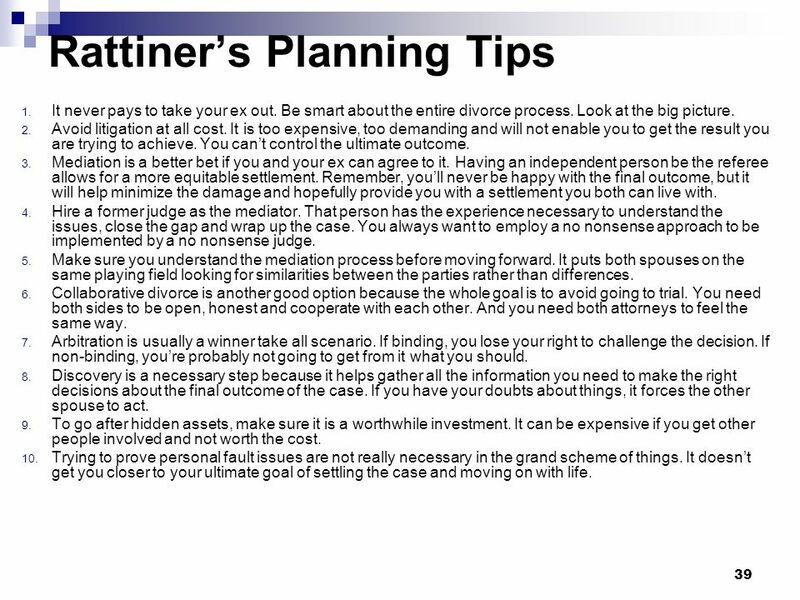 Collaborative divorce is another good option because the whole goal is to avoid going to trial. You need both sides to be open, honest and cooperate with each other. And you need both attorneys to feel the same way. 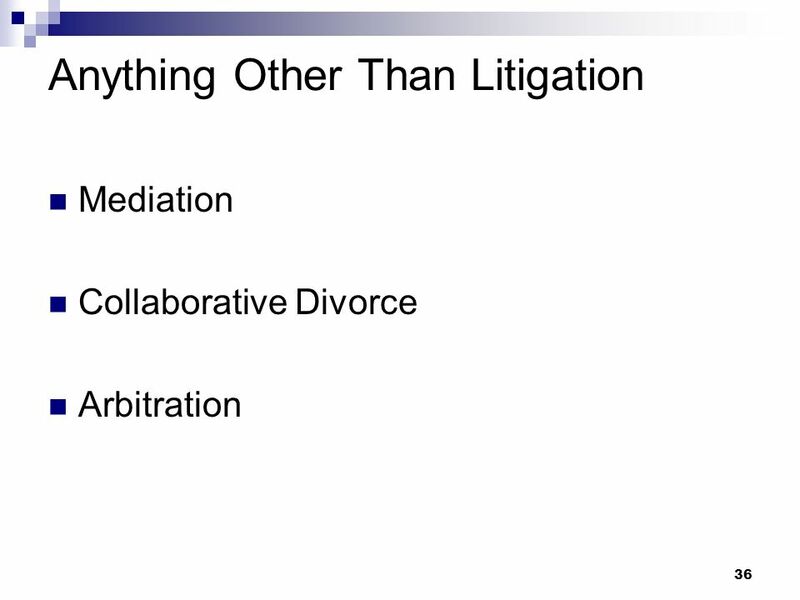 Arbitration is usually a winner take all scenario. 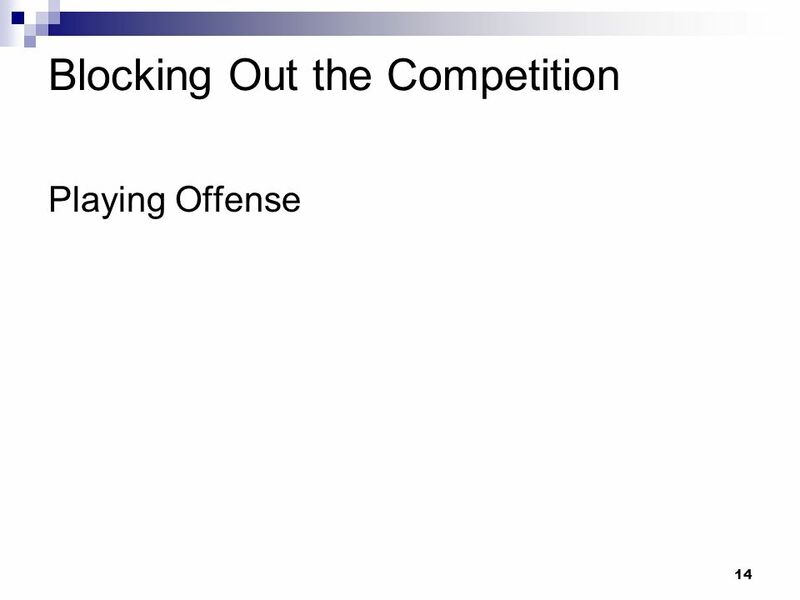 If binding, you lose your right to challenge the decision. If non-binding, you’re probably not going to get from it what you should. Discovery is a necessary step because it helps gather all the information you need to make the right decisions about the final outcome of the case. If you have your doubts about things, it forces the other spouse to act. 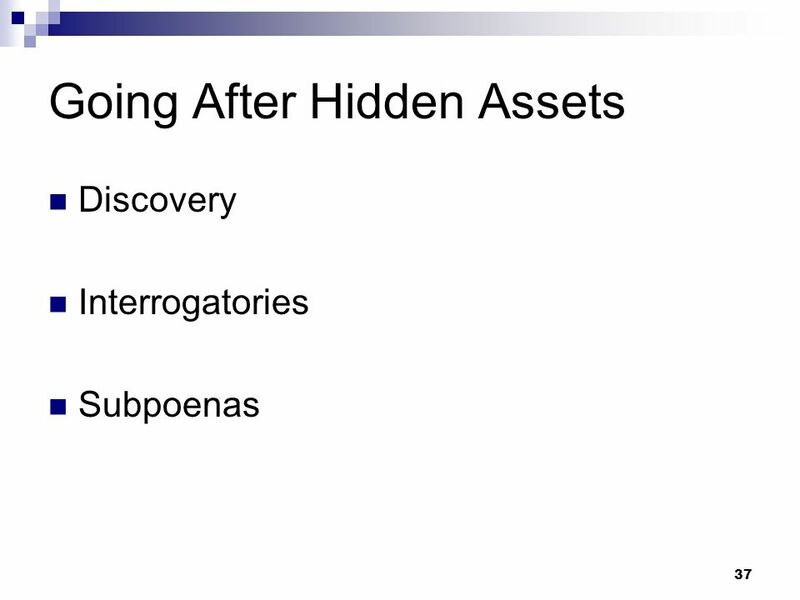 To go after hidden assets, make sure it is a worthwhile investment. It can be expensive if you get other people involved and not worth the cost. Trying to prove personal fault issues are not really necessary in the grand scheme of things. It doesn’t get you closer to your ultimate goal of settling the case and moving on with life. 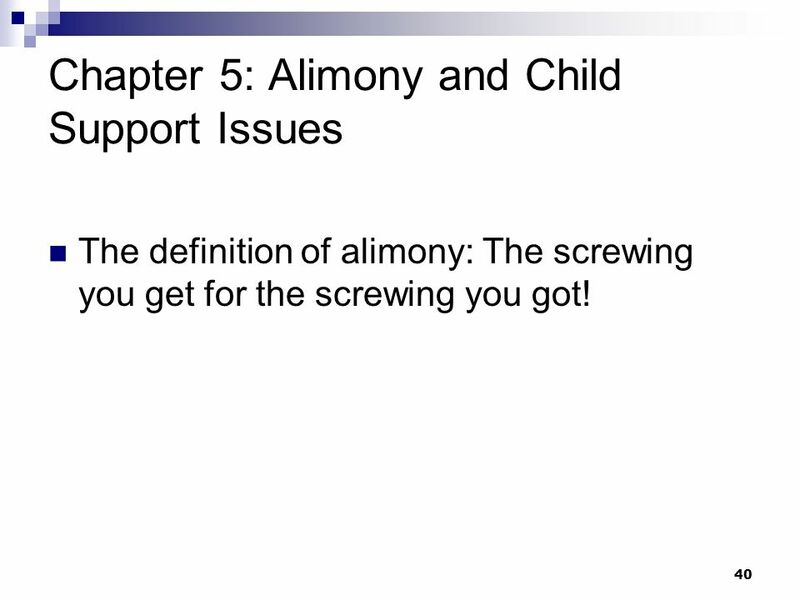 The definition of alimony: The screwing you get for the screwing you got! 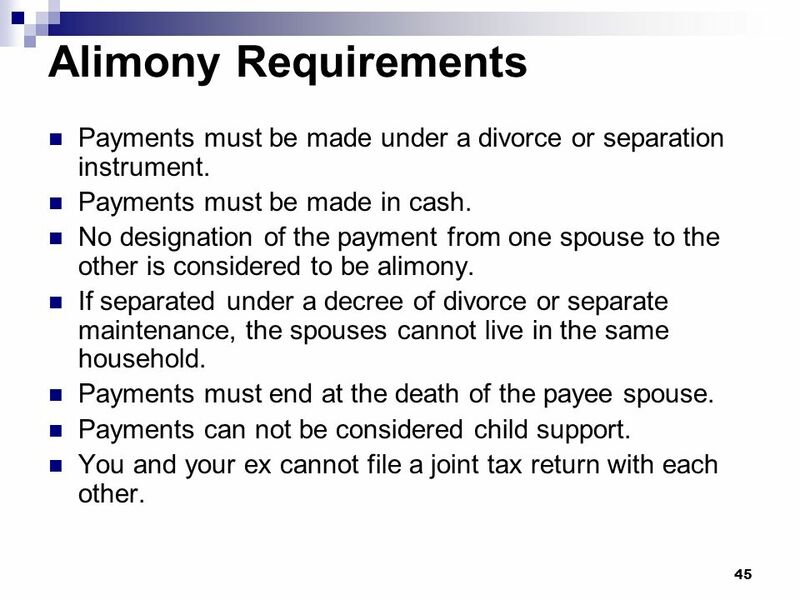 45 Alimony Requirements Payments must be made under a divorce or separation instrument. Payments must be made in cash. 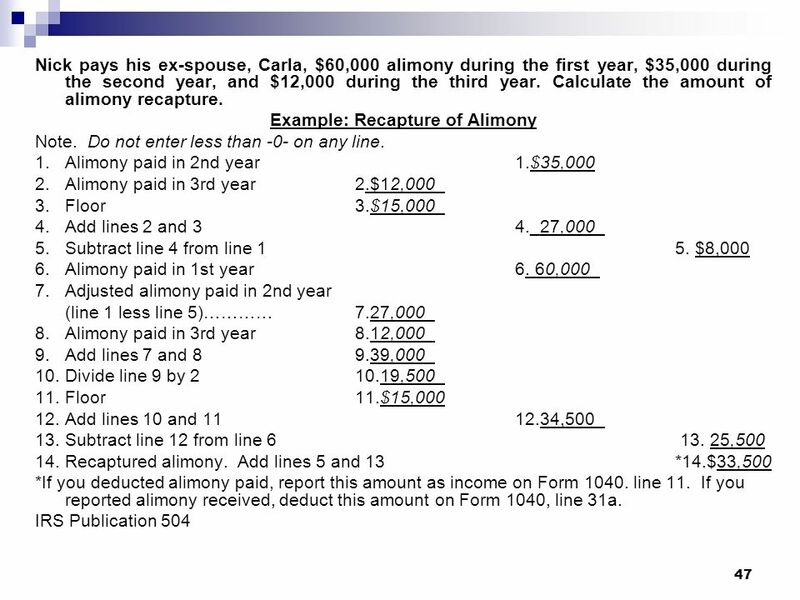 No designation of the payment from one spouse to the other is considered to be alimony. If separated under a decree of divorce or separate maintenance, the spouses cannot live in the same household. Payments must end at the death of the payee spouse. Payments can not be considered child support. 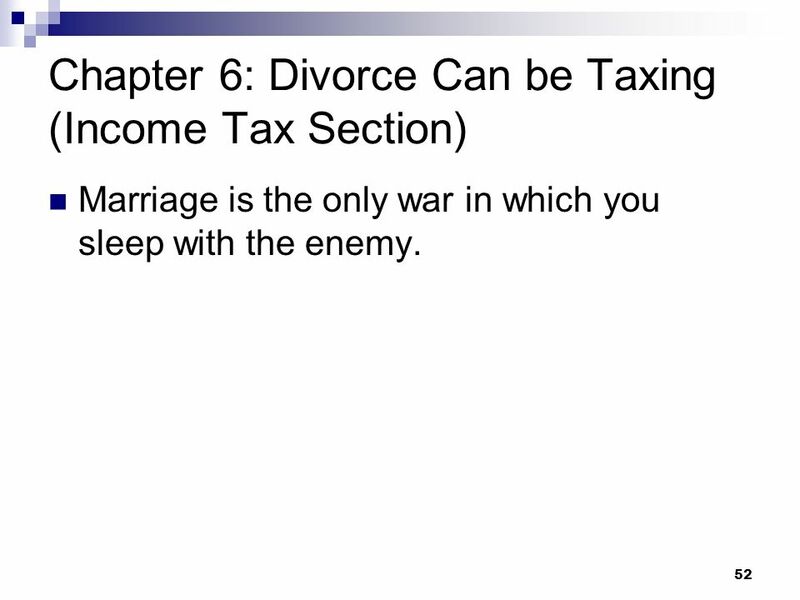 You and your ex cannot file a joint tax return with each other. 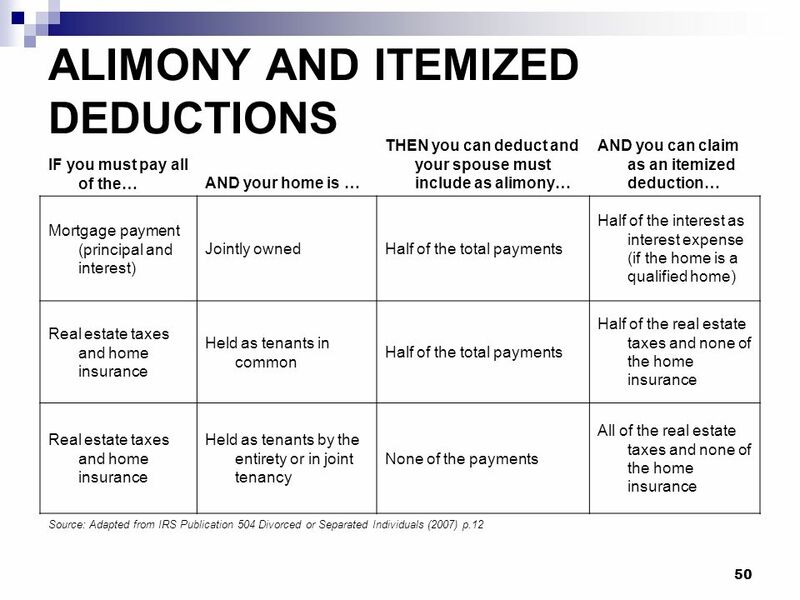 Alimony is deductible for the payor spouse and taxable to the payee spouse. 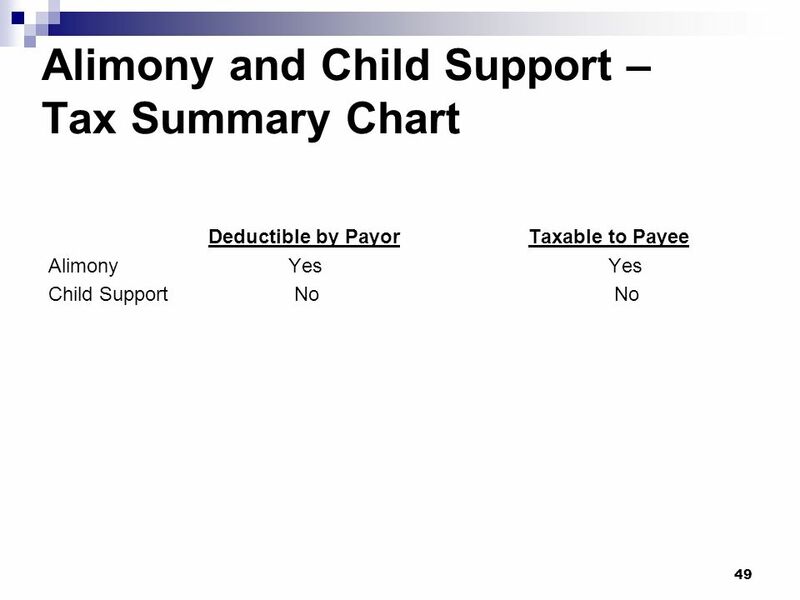 Child support is neither taxable nor deductible by either spouse. 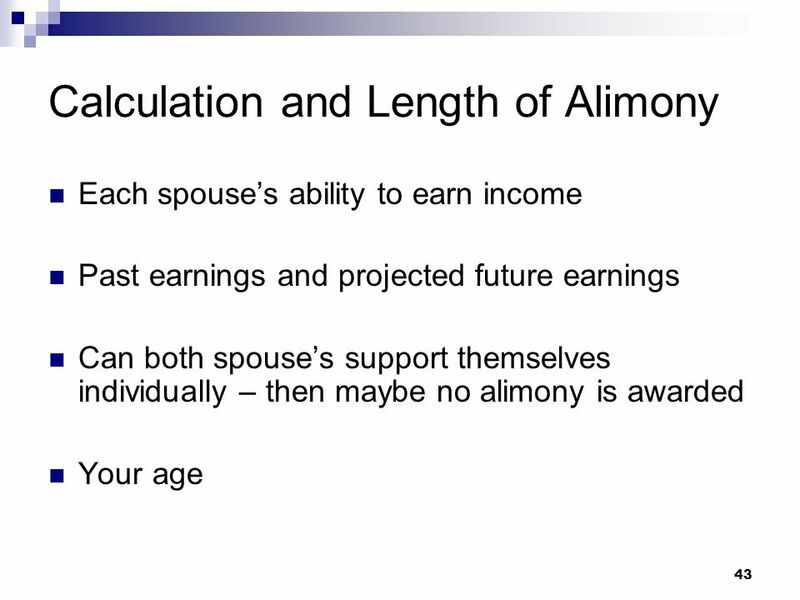 Alimony is generally not awarded for short term marriages which have durations of less than five years. 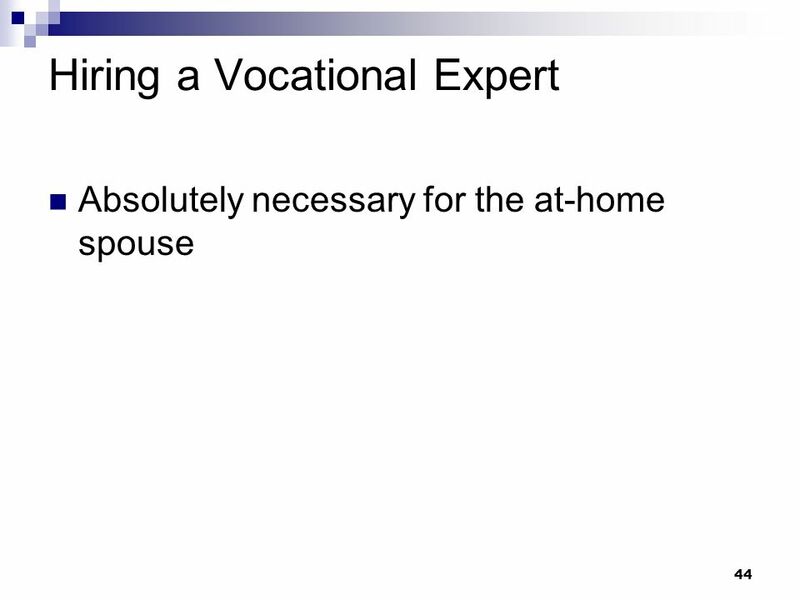 Make sure you call in a vocational expert to help assess the at home spouse’s ability to earn income after the divorce. 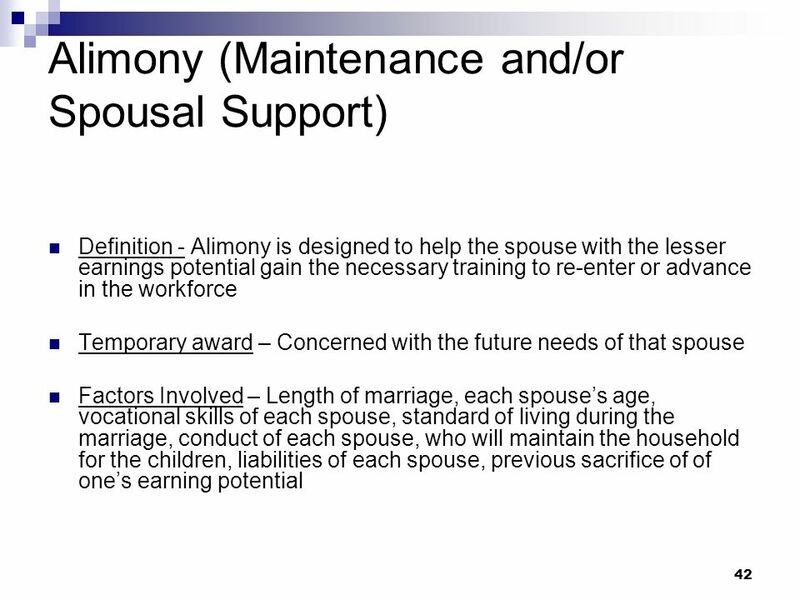 If spouses agree to a lump sum award of an alimony payment, it cannot be altered in the future. 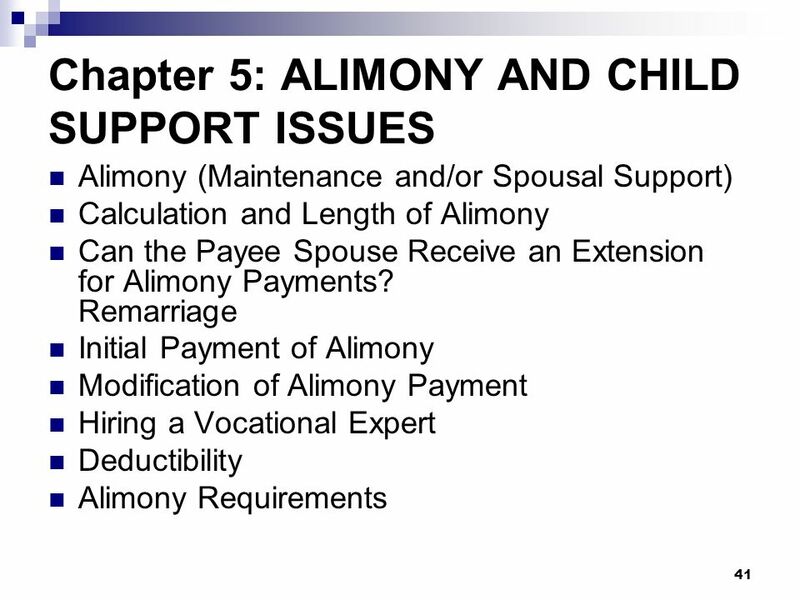 Regular monthly payments of alimony can be modified by the courts in the future. 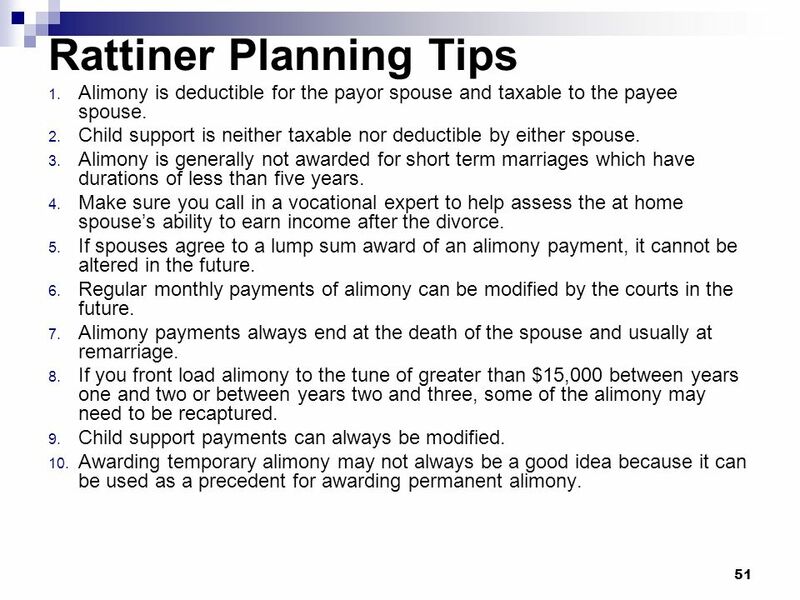 Alimony payments always end at the death of the spouse and usually at remarriage. 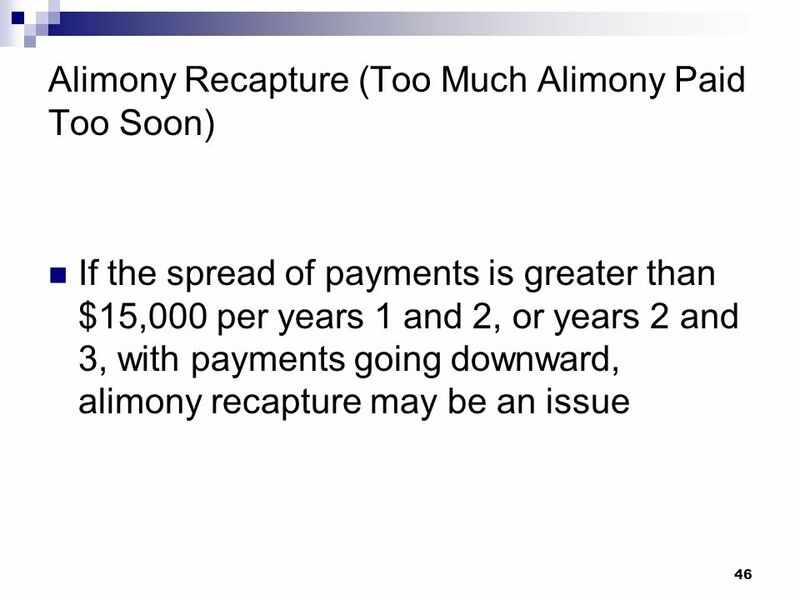 If you front load alimony to the tune of greater than $15,000 between years one and two or between years two and three, some of the alimony may need to be recaptured. Child support payments can always be modified. Awarding temporary alimony may not always be a good idea because it can be used as a precedent for awarding permanent alimony. 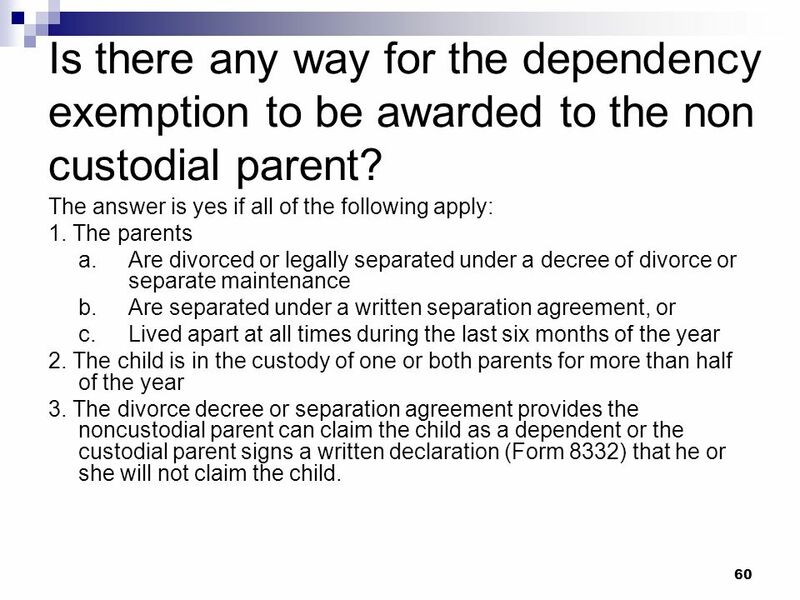 60 Is there any way for the dependency exemption to be awarded to the non custodial parent? The answer is yes if all of the following apply: 1. The parents a. 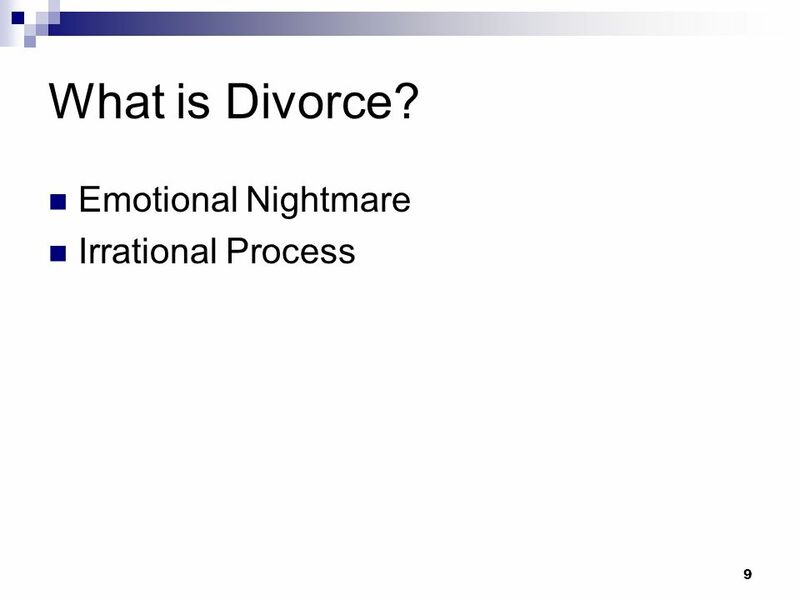 Are divorced or legally separated under a decree of divorce or separate maintenance b. Are separated under a written separation agreement, or c. Lived apart at all times during the last six months of the year 2. The child is in the custody of one or both parents for more than half of the year 3. 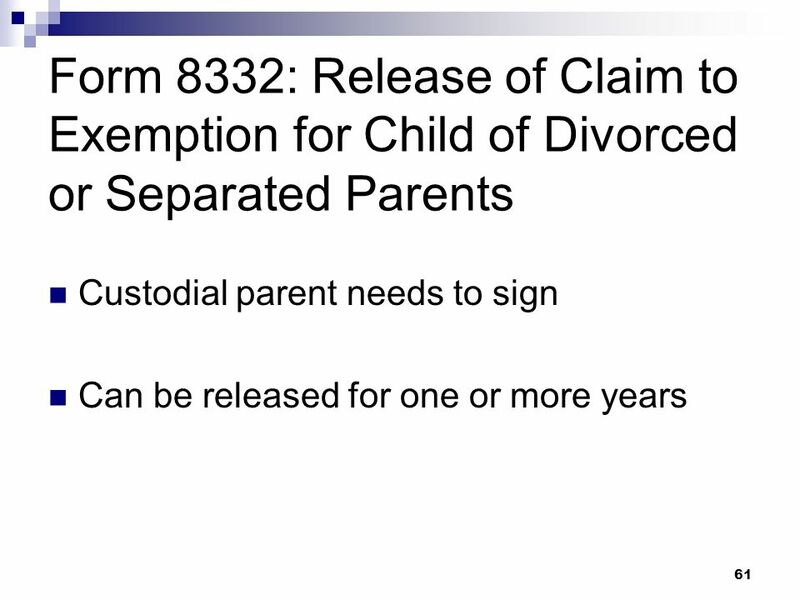 The divorce decree or separation agreement provides the noncustodial parent can claim the child as a dependent or the custodial parent signs a written declaration (Form 8332) that he or she will not claim the child. 63 Co-Owning the House NOOOOOOOOOOOOO! 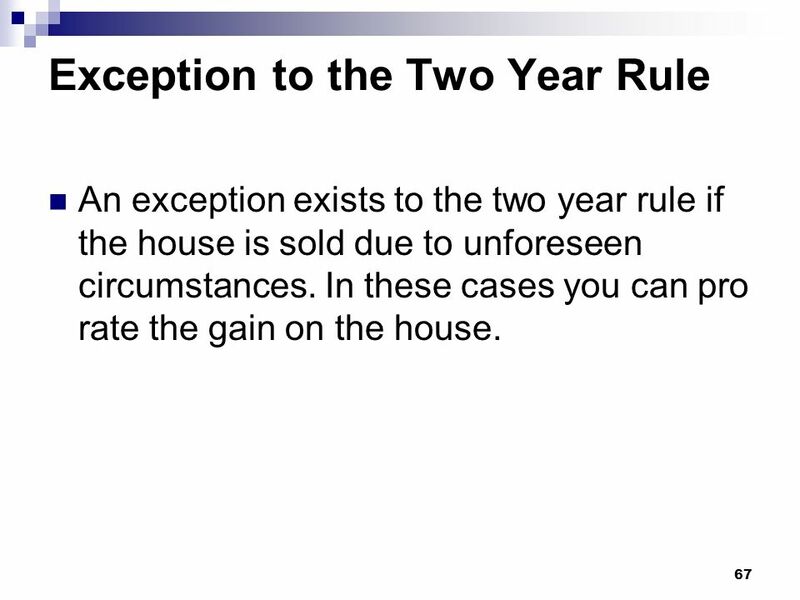 An exception exists to the two year rule if the house is sold due to unforeseen circumstances. In these cases you can pro rate the gain on the house. John and Jane Smith purchased a house for $300,000. Six months later they were legally divorced. Jane, who is now single, and is the sole owner of the house, decides to sell the house for $400,000 after the sixth month. How much of the gain would be taxable to Jane? 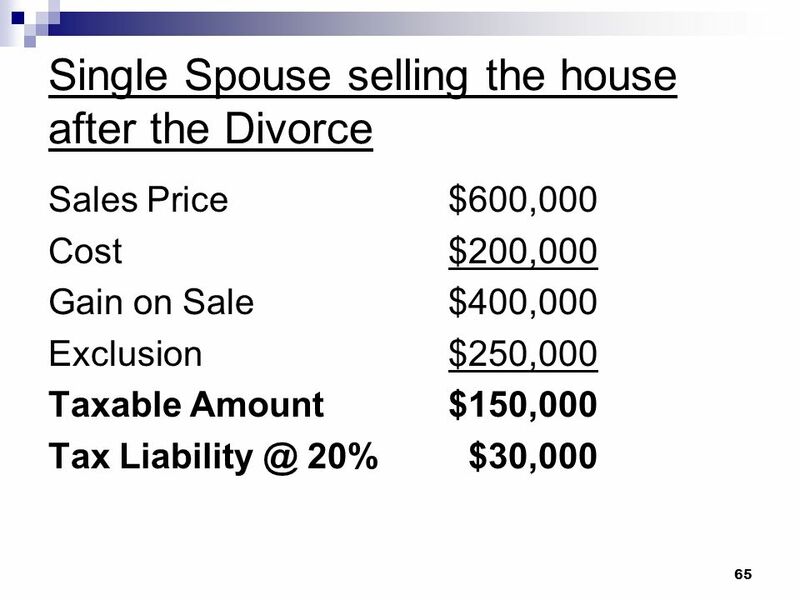 Step 1: Sales Price $400,000 Cost	$300,000 Profit	$100,000 Step 2: $250,000 single exclusion x 6/24 = $62,500 can be excluded from the sale of the house Step 3: Excluded Gain $62,500 Taxable Gain	$37,500 Note1: The 6/24 represents living in the house for 6 months out of 24 months (2 year requirement). 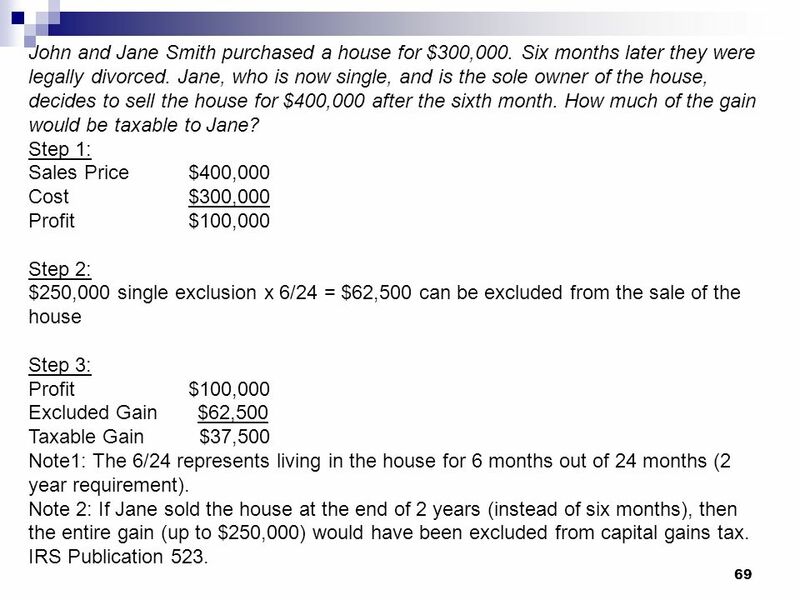 Note 2: If Jane sold the house at the end of 2 years (instead of six months), then the entire gain (up to $250,000) would have been excluded from capital gains tax. 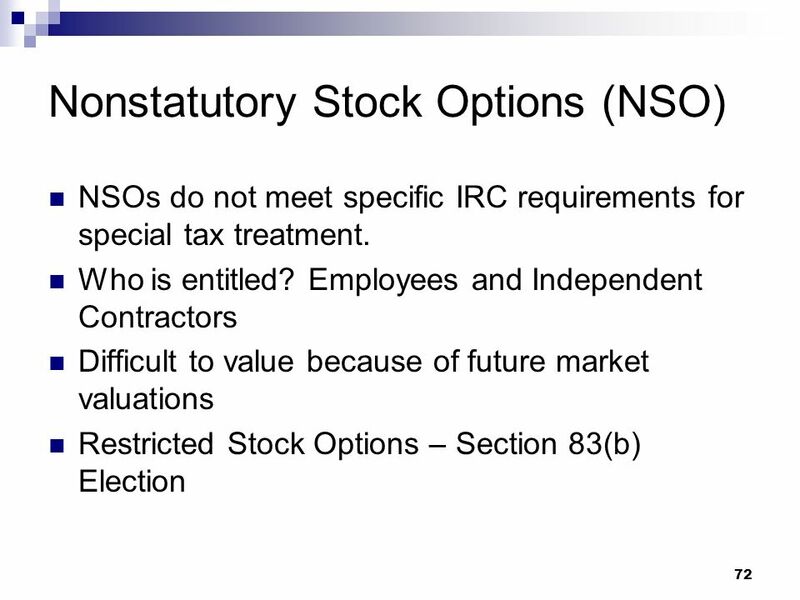 IRS Publication 523. 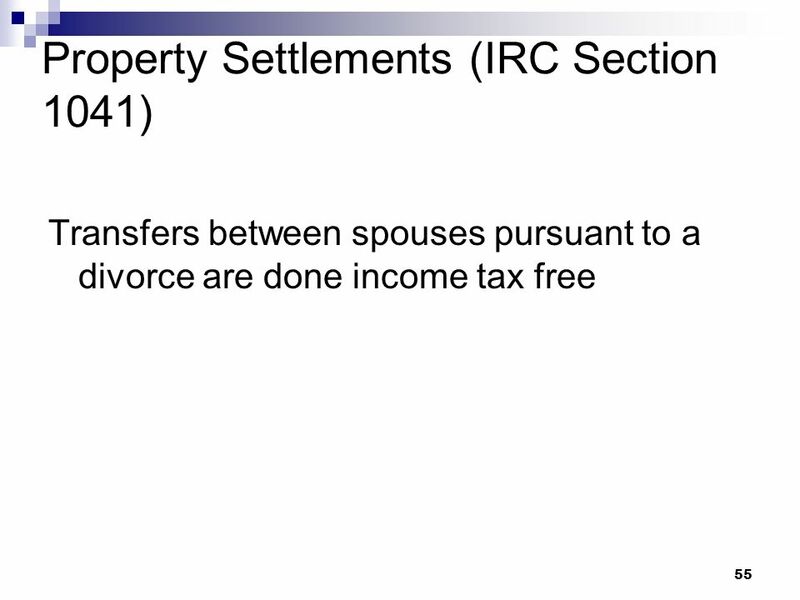 A transfer of property between spouses pursuant to a divorce does not create a taxable event for either spouse. 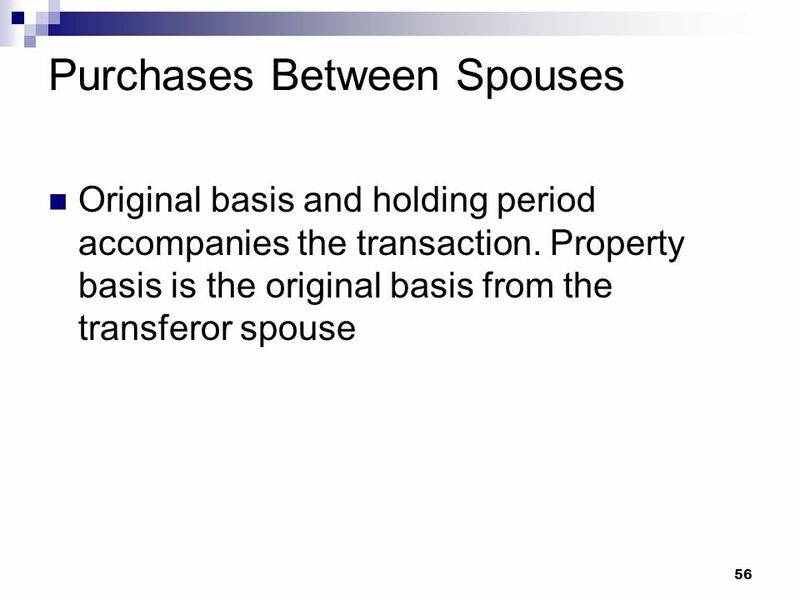 The recipient spouse keeps the same tax basis for property transferred from the transferor spouse. 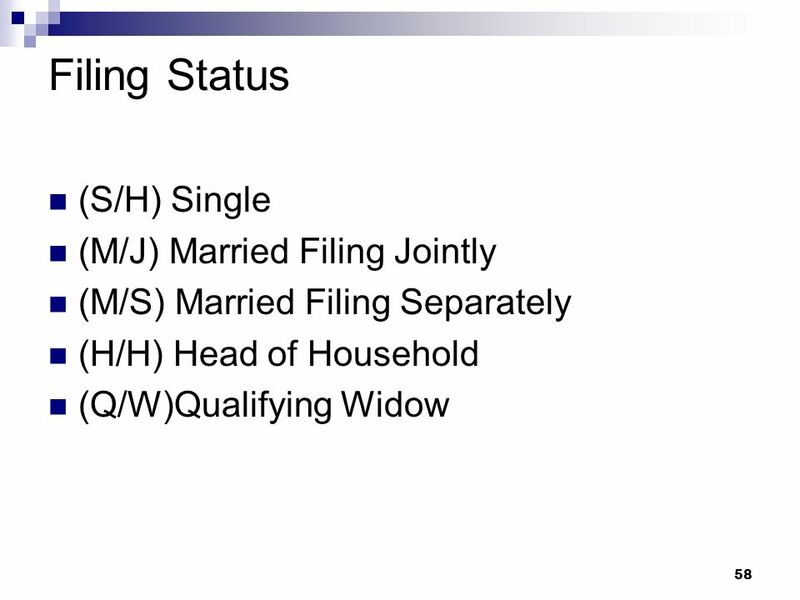 Filing status is determined as of the last day of the calendar year (December 31st) Filing married filing separate keeps the liability issue separate between the spouses. 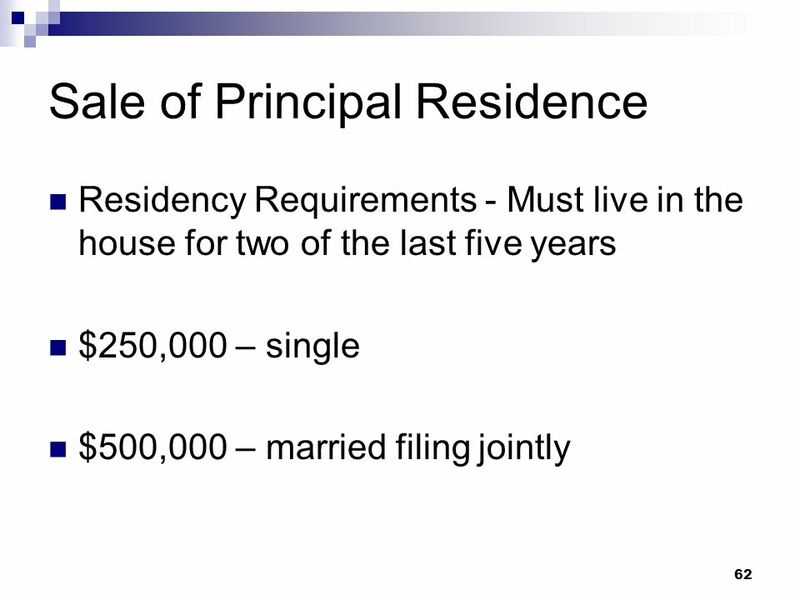 Head of household should be used as a filing status for a divorced spouse who maintains a household for dependent children. 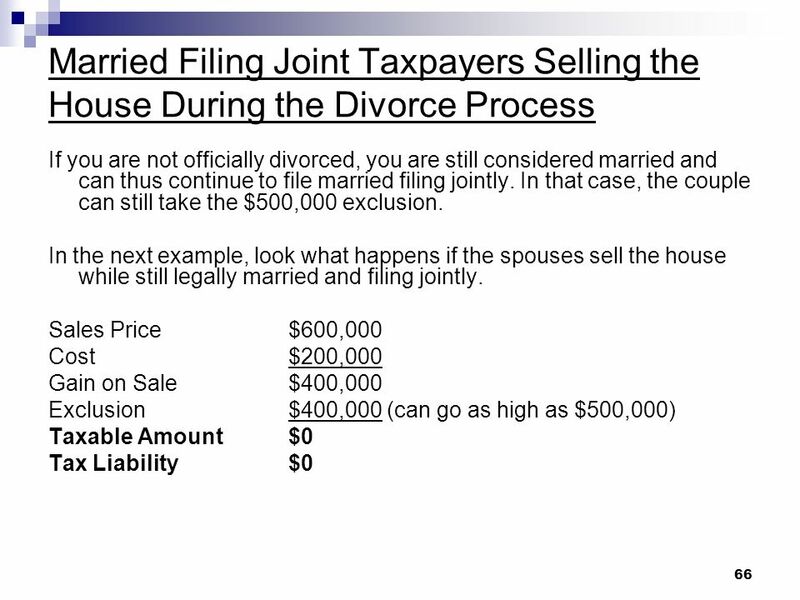 If you are planning on selling your house as the recipient spouse, you may want to do it during the divorce process in order to take advantage of the $500,000 exclusion. 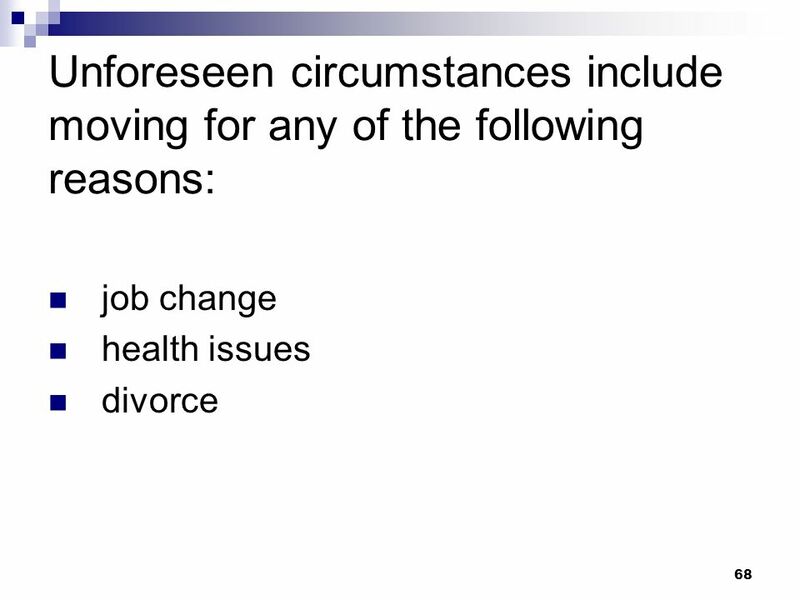 Divorce qualifies as unforeseen circumstance. 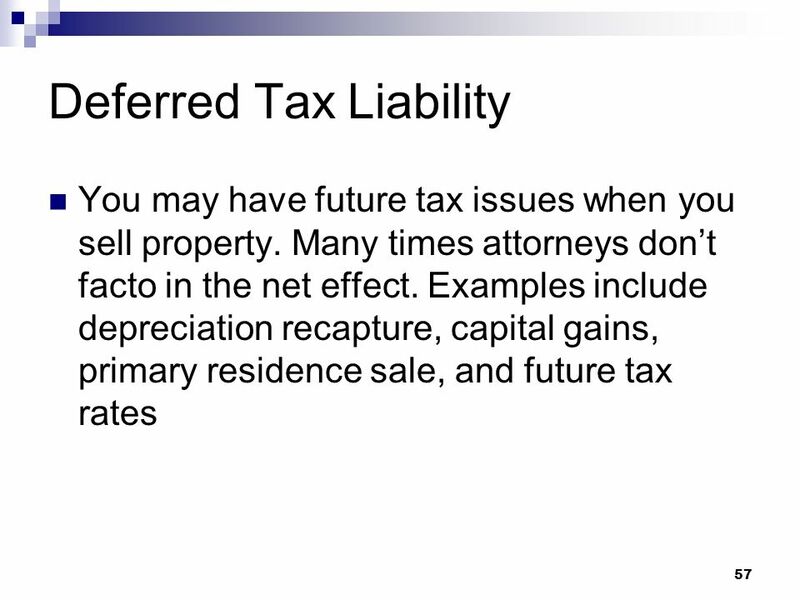 That means if you sell the house within a two year period, you may be able to exclude part of the capital gain. You don’t have to worry about the capital gain exclusion from a home sale where you transfer the sale to the other spouse as part of the divorce. 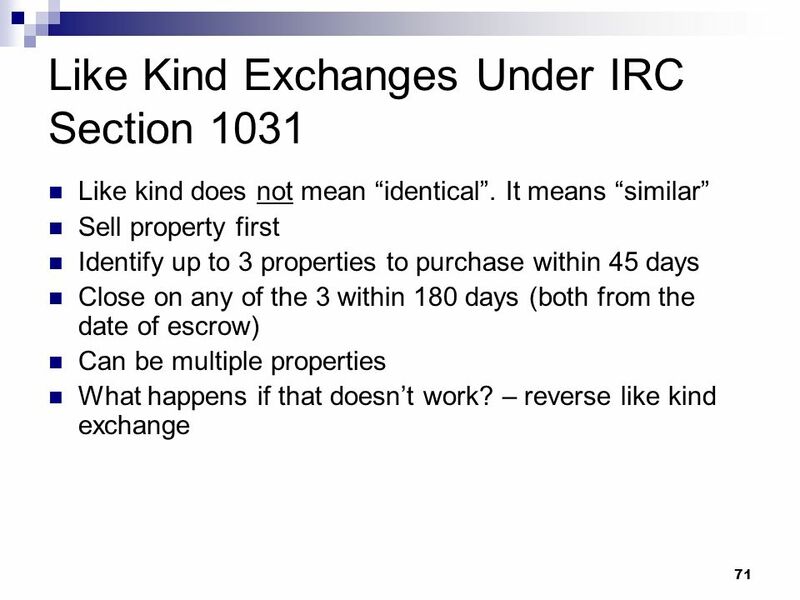 If you retain a rental property from the divorce and wish to exchange it for another more expense property, you can do it under IRC Section 1031 and defer the capital gain. 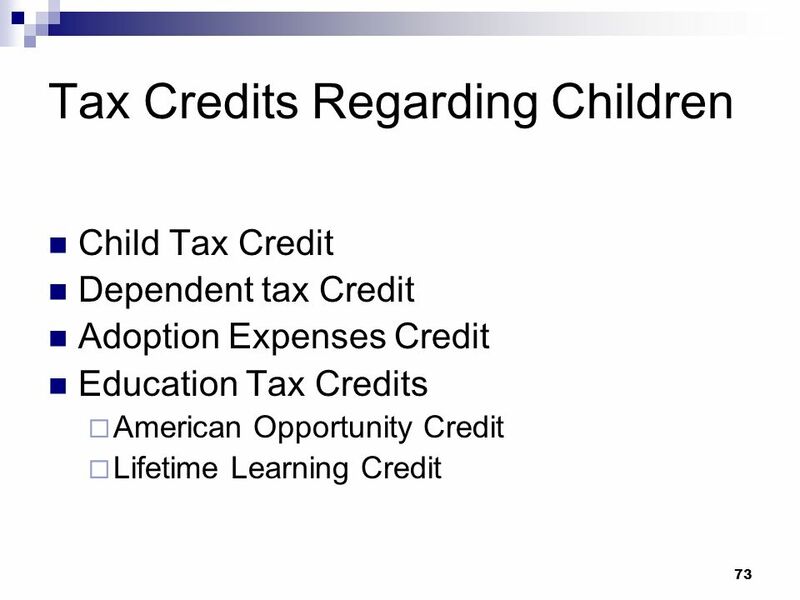 If you claim a child under the age of 17 as your dependent, you may qualify for the $1,000 per year child tax credit. 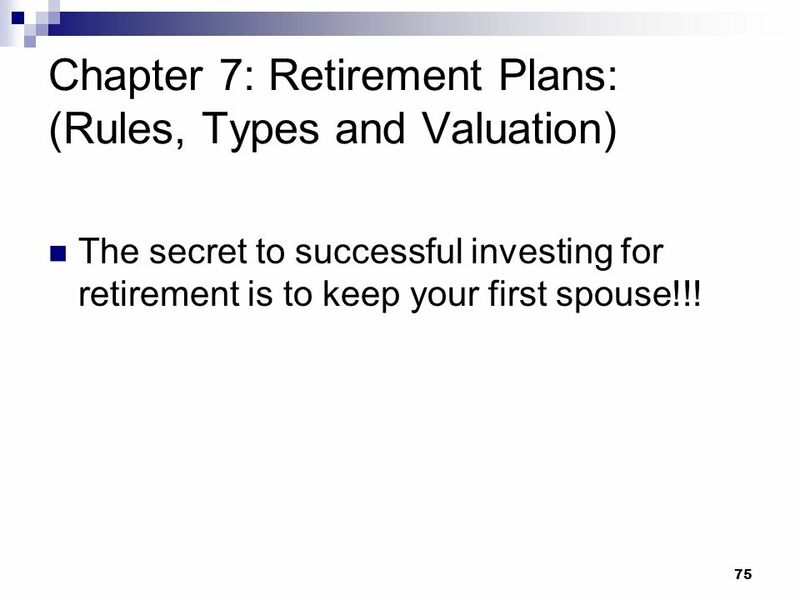 The secret to successful investing for retirement is to keep your first spouse!!! 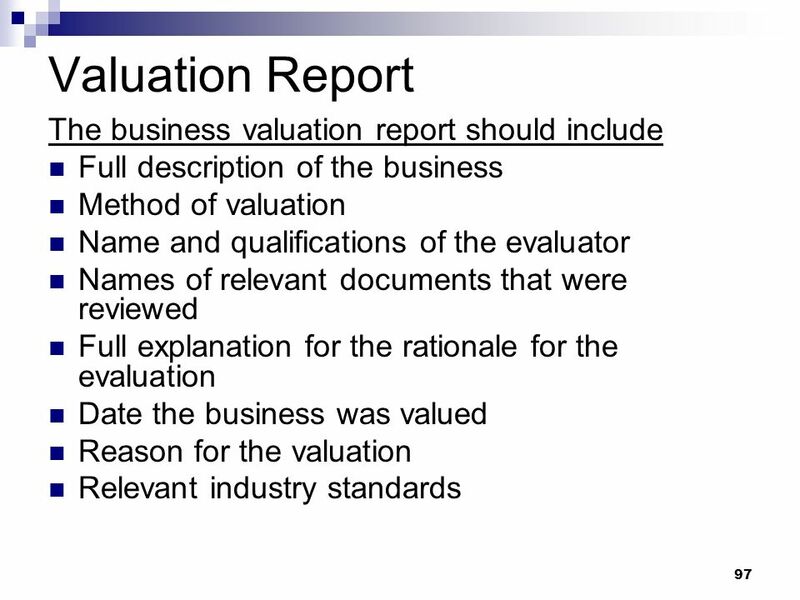 Valuation issues are always tricky and seldom accurate! And they certainly don’t measure what will happen in the future (i.e. 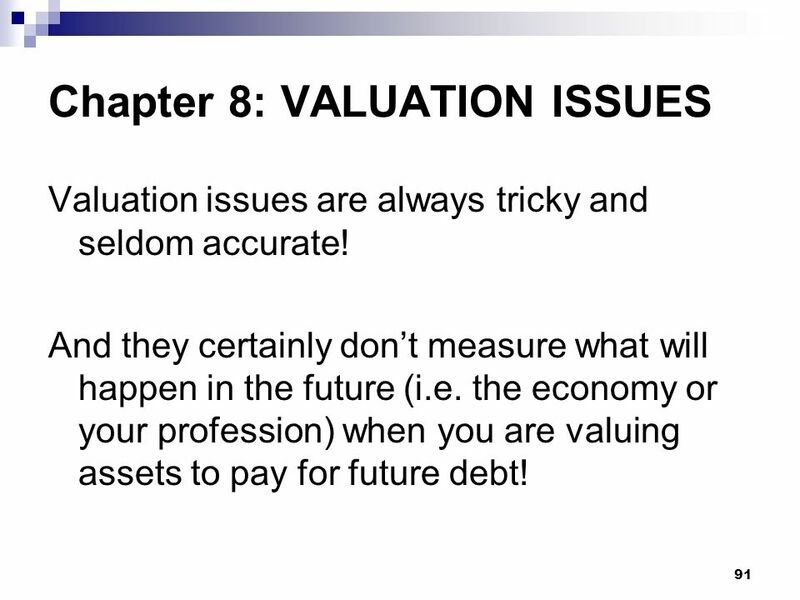 the economy or your profession) when you are valuing assets to pay for future debt! 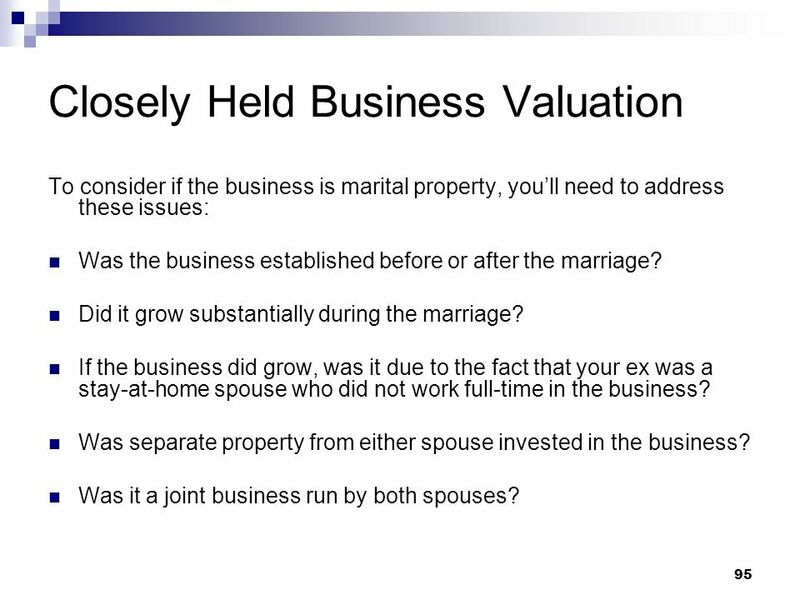 To consider if the business is marital property, you’ll need to address these issues: Was the business established before or after the marriage? Did it grow substantially during the marriage? If the business did grow, was it due to the fact that your ex was a stay-at-home spouse who did not work full-time in the business? 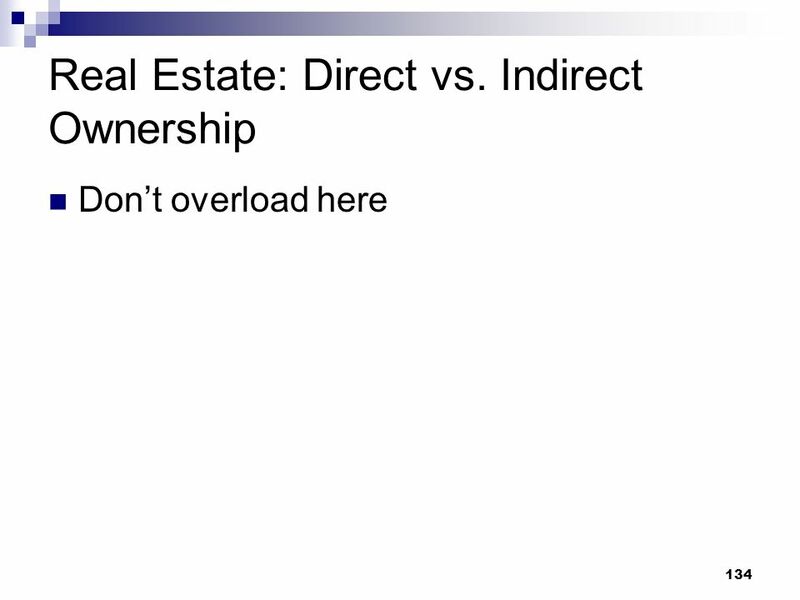 Was separate property from either spouse invested in the business? Was it a joint business run by both spouses? 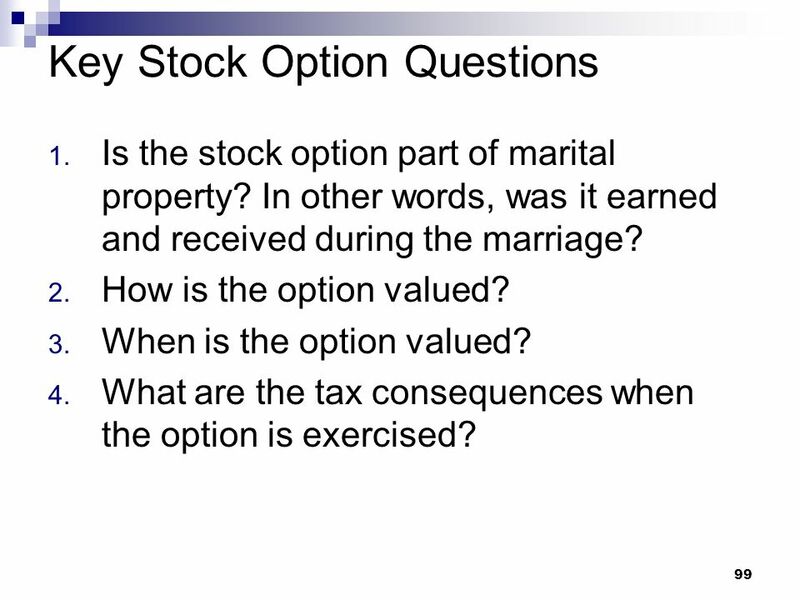 Is the stock option part of marital property? In other words, was it earned and received during the marriage? 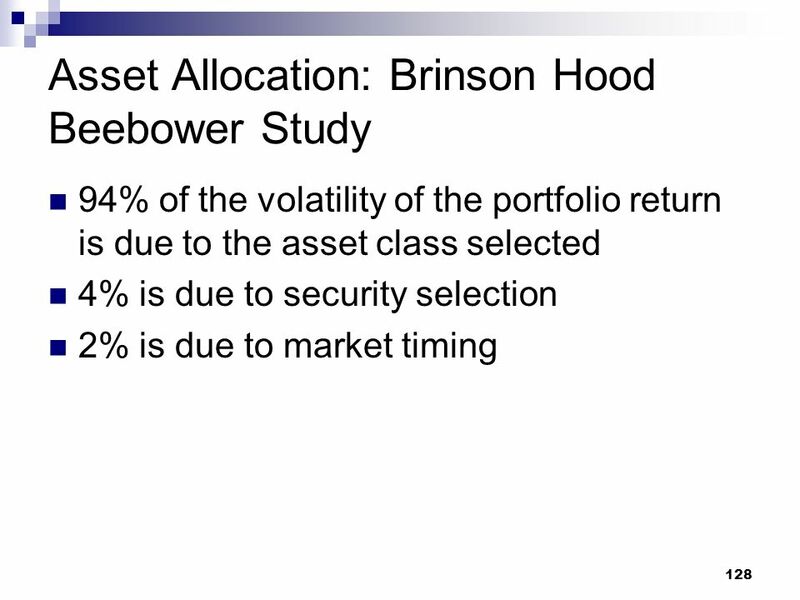 How is the option valued? 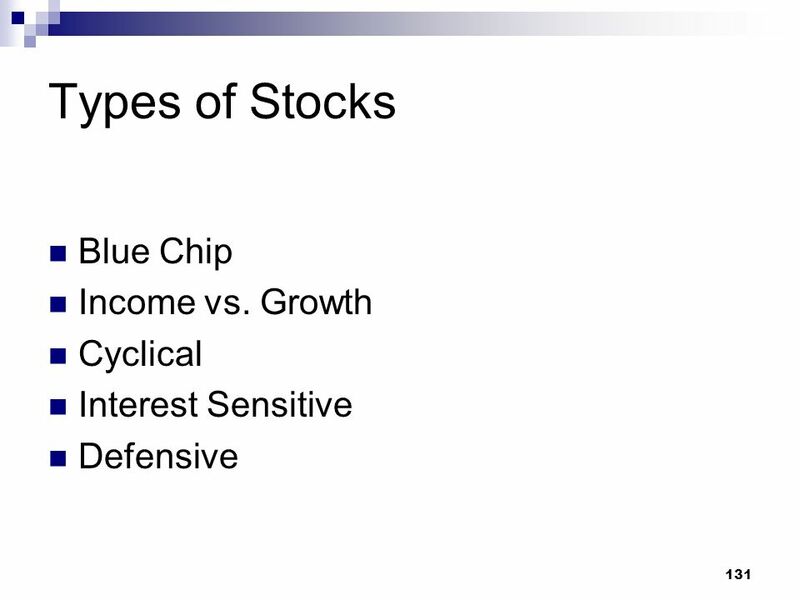 When is the option valued? 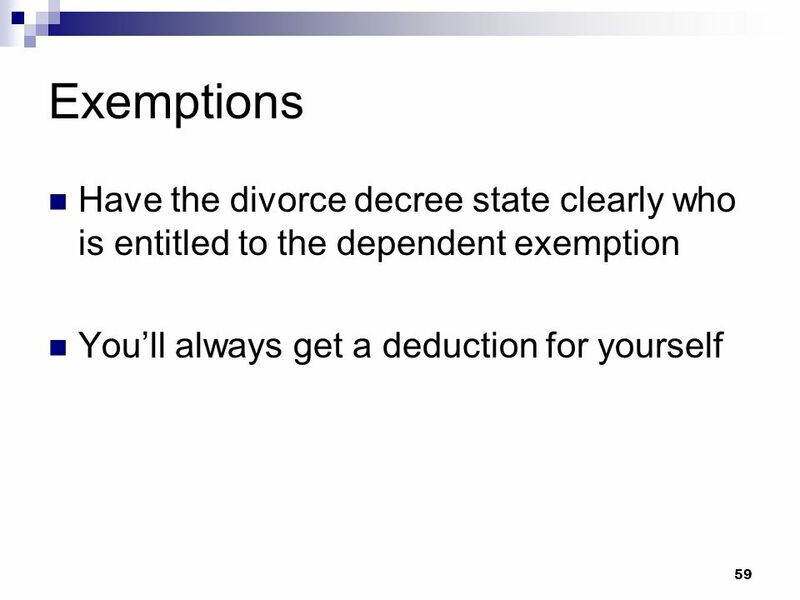 What are the tax consequences when the option is exercised? Americans divorce so much we are called the land of the free, and we get married so often that we are called home of the brave. You are ready for Stage 2 of Your Life. You will need to re-examine all the prior aspects of your life and then start anew. 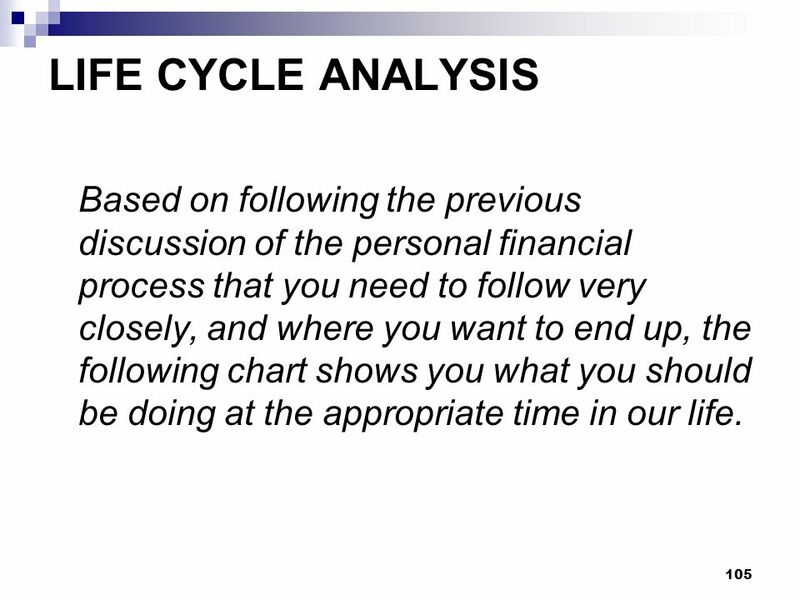 105 LIFE CYCLE ANALYSIS Based on following the previous discussion of the personal financial process that you need to follow very closely, and where you want to end up, the following chart shows you what you should be doing at the appropriate time in our life. 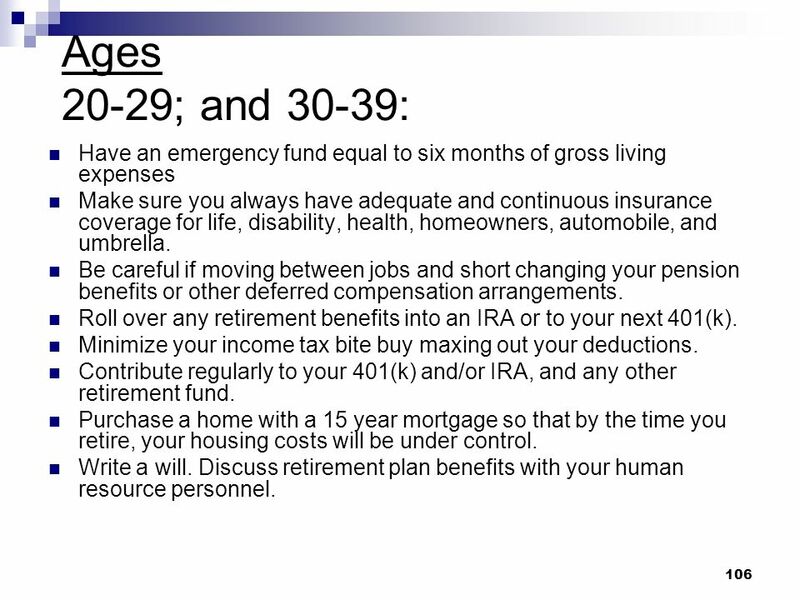 106 Ages ; and 30-39: Have an emergency fund equal to six months of gross living expenses Make sure you always have adequate and continuous insurance coverage for life, disability, health, homeowners, automobile, and umbrella. 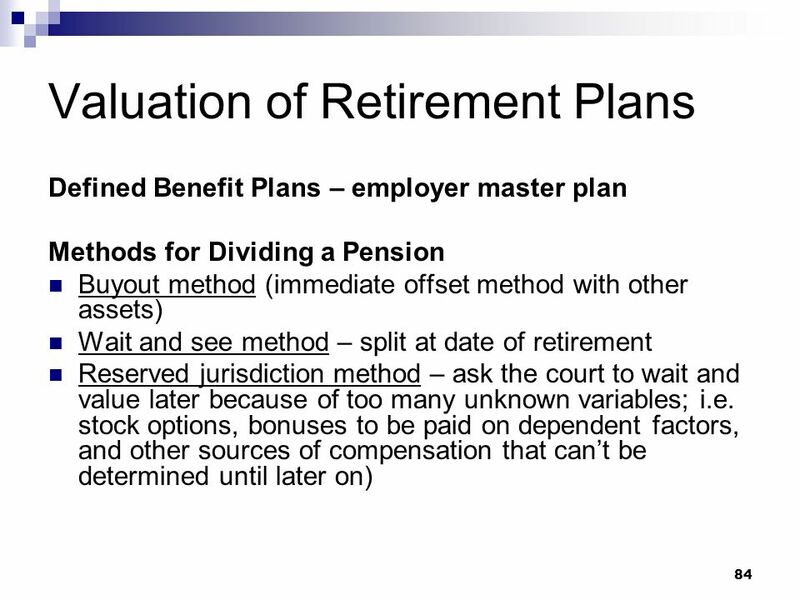 Be careful if moving between jobs and short changing your pension benefits or other deferred compensation arrangements. 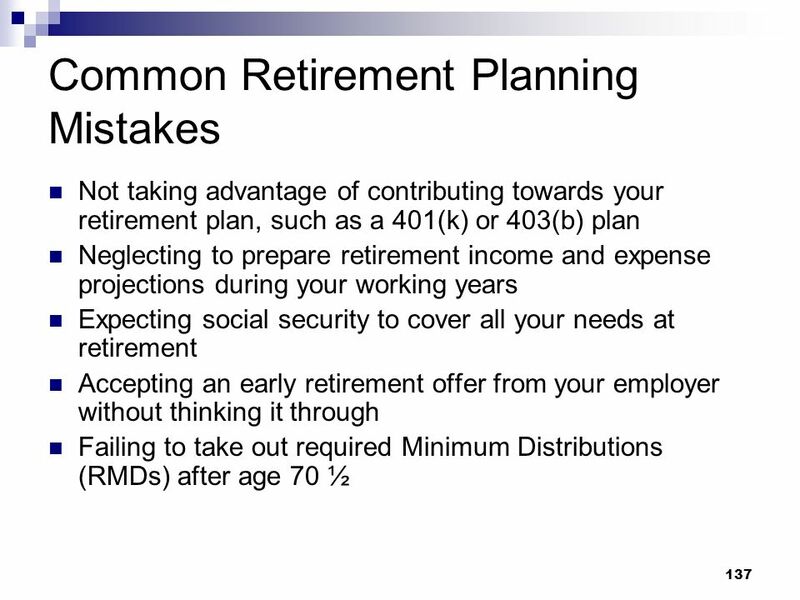 Roll over any retirement benefits into an IRA or to your next 401(k). Minimize your income tax bite buy maxing out your deductions. Contribute regularly to your 401(k) and/or IRA, and any other retirement fund. Purchase a home with a 15 year mortgage so that by the time you retire, your housing costs will be under control. Write a will. 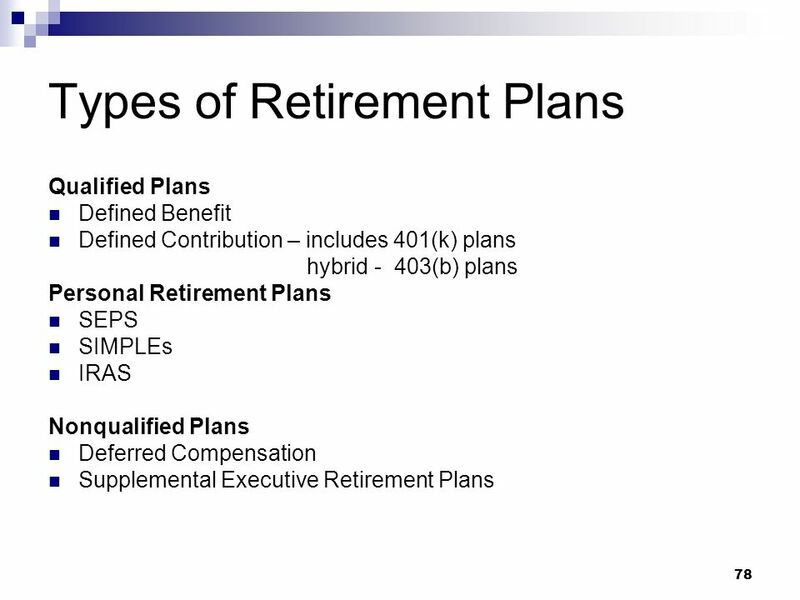 Discuss retirement plan benefits with your human resource personnel. 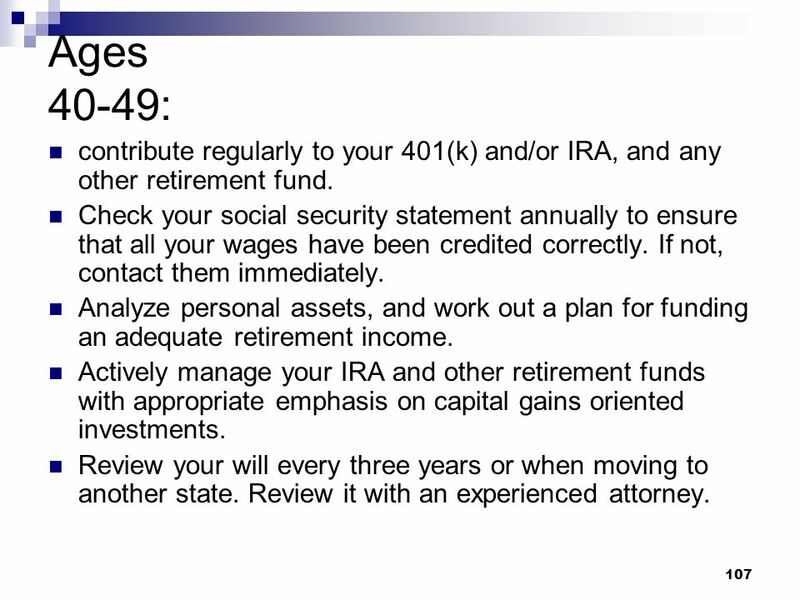 107 Ages 40-49: contribute regularly to your 401(k) and/or IRA, and any other retirement fund. Check your social security statement annually to ensure that all your wages have been credited correctly. If not, contact them immediately. 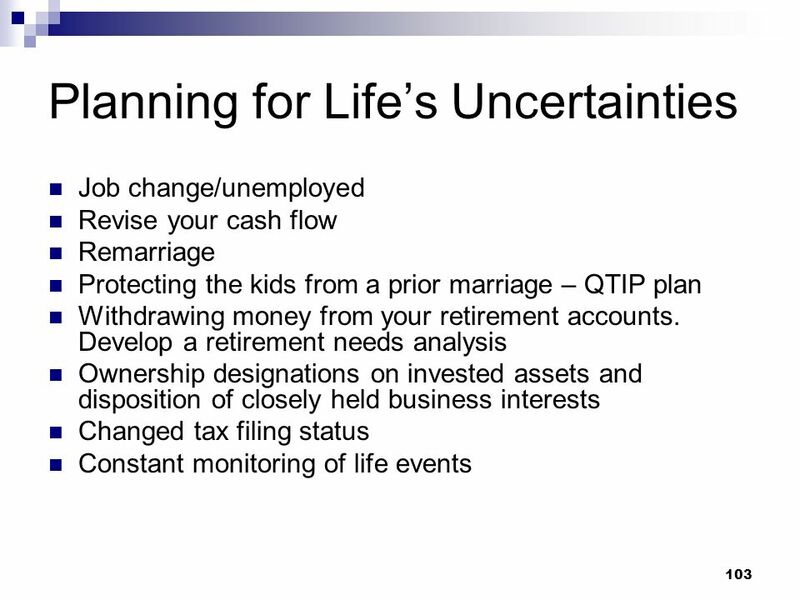 Analyze personal assets, and work out a plan for funding an adequate retirement income. 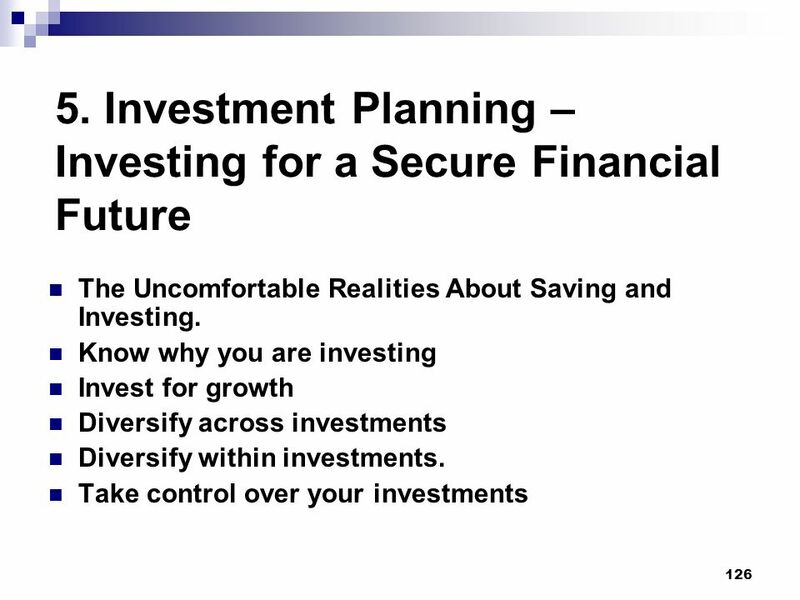 Actively manage your IRA and other retirement funds with appropriate emphasis on capital gains oriented investments. 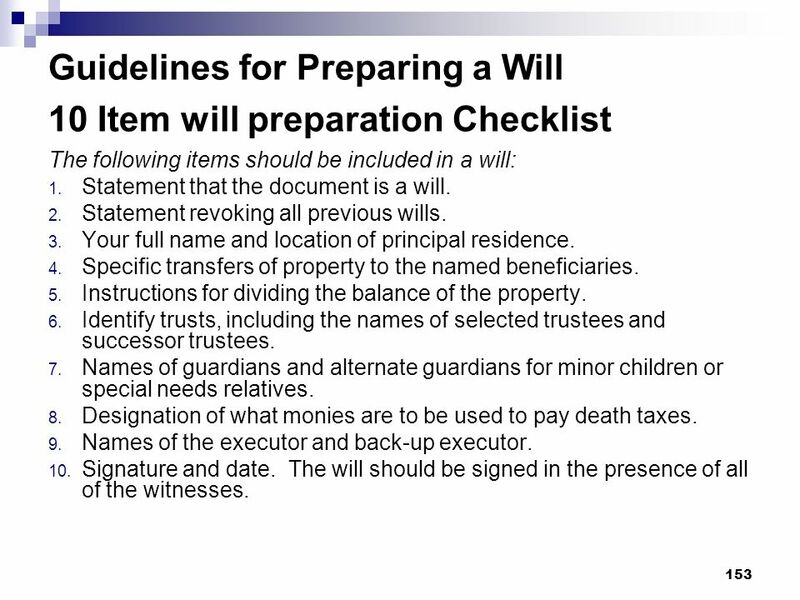 Review your will every three years or when moving to another state. Review it with an experienced attorney. 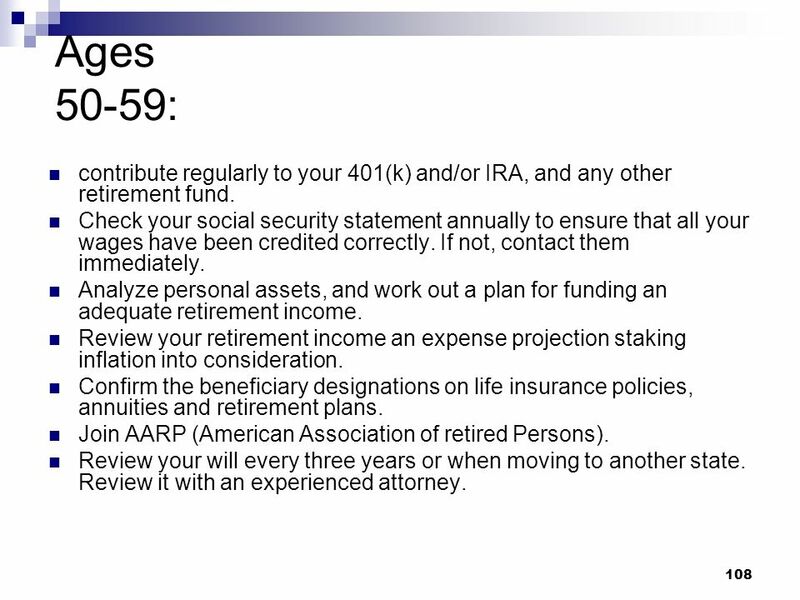 108 Ages 50-59: contribute regularly to your 401(k) and/or IRA, and any other retirement fund. Check your social security statement annually to ensure that all your wages have been credited correctly. If not, contact them immediately. 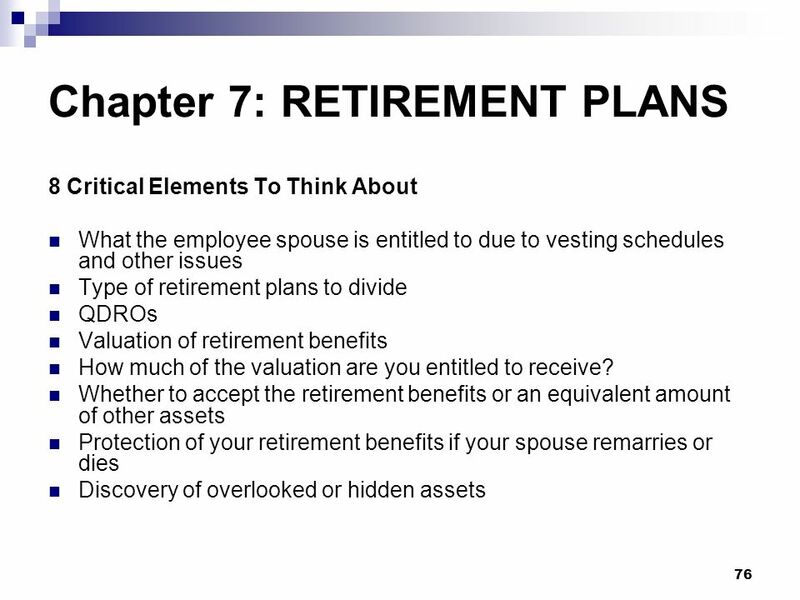 Analyze personal assets, and work out a plan for funding an adequate retirement income. 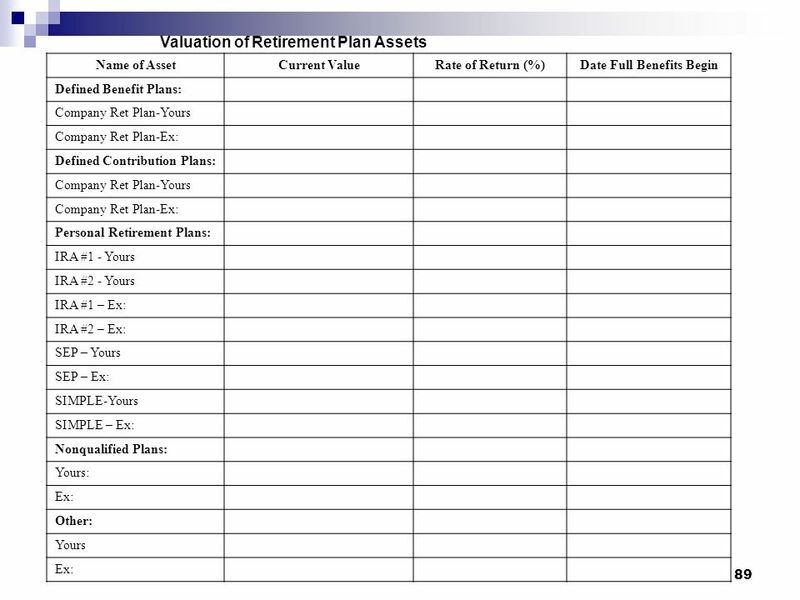 Review your retirement income an expense projection staking inflation into consideration. Confirm the beneficiary designations on life insurance policies, annuities and retirement plans. Join AARP (American Association of retired Persons). Review your will every three years or when moving to another state. Review it with an experienced attorney. 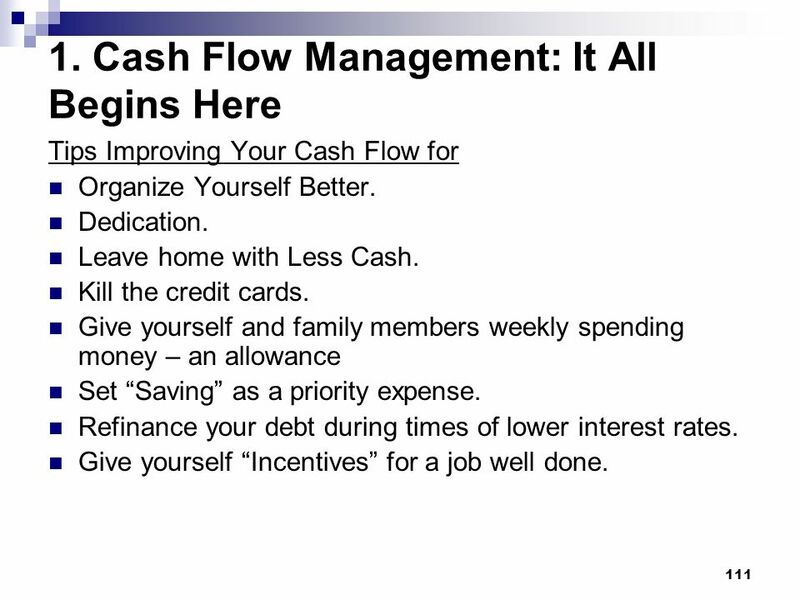 Tips Improving Your Cash Flow for Organize Yourself Better. Dedication. Leave home with Less Cash. Kill the credit cards. Give yourself and family members weekly spending money – an allowance Set “Saving” as a priority expense. Refinance your debt during times of lower interest rates. Give yourself “Incentives” for a job well done. Design a budget form that is suitable to you. Forecast your income. Summarize past expenses. Estimate future expenses. 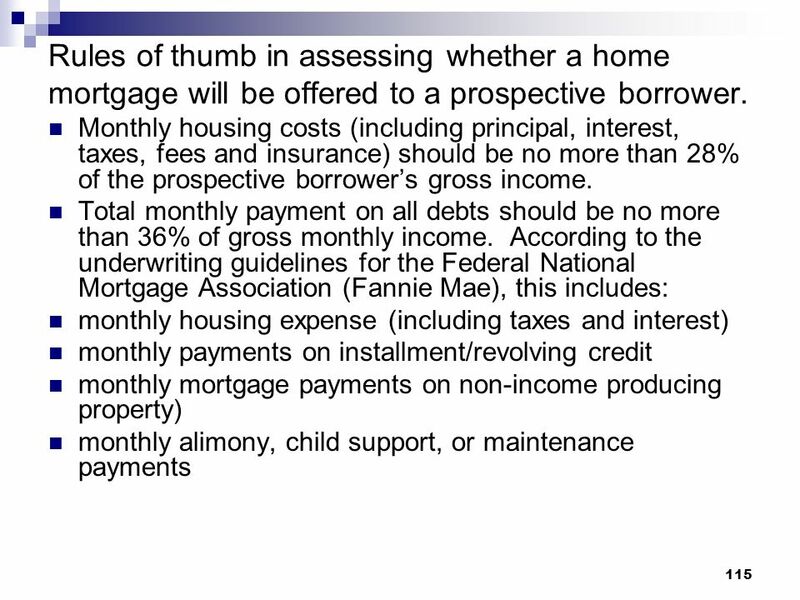 115 Rules of thumb in assessing whether a home mortgage will be offered to a prospective borrower. 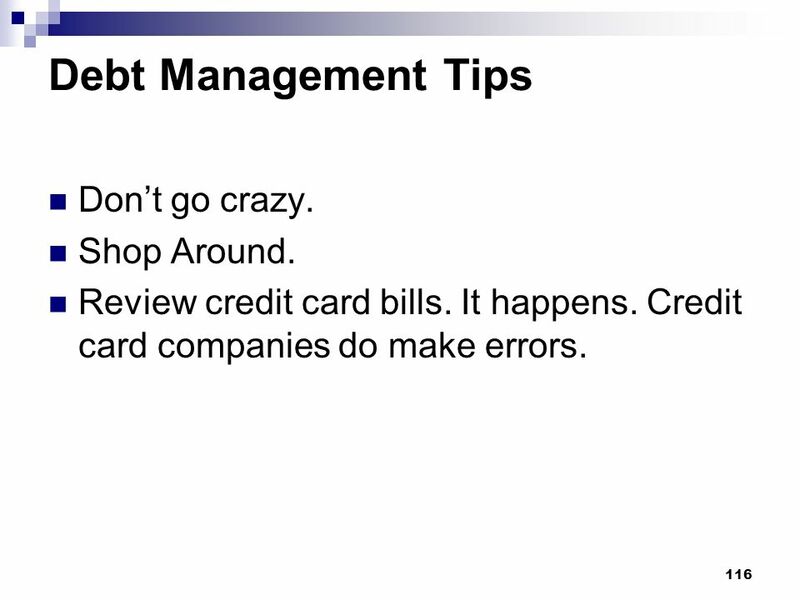 116 Debt Management Tips Don’t go crazy. Shop Around. Review credit card bills. It happens. Credit card companies do make errors. 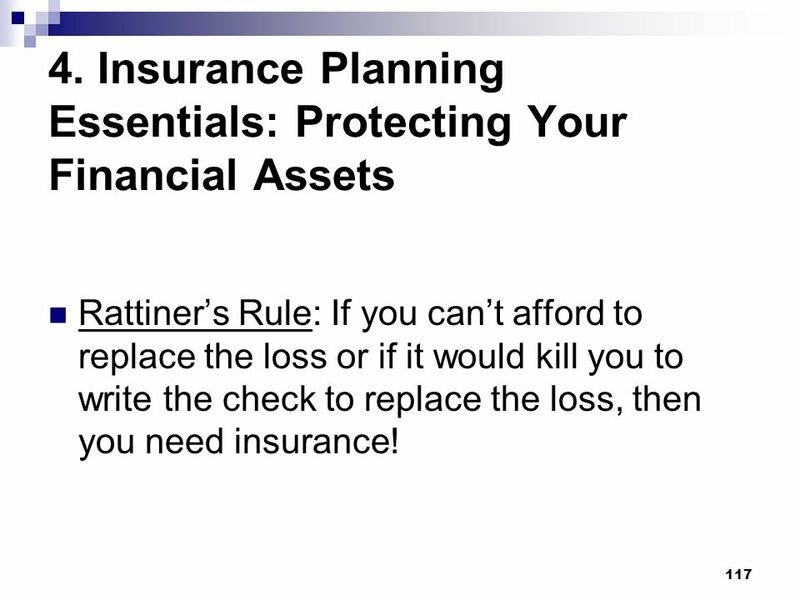 Rattiner’s Rule: If you can’t afford to replace the loss or if it would kill you to write the check to replace the loss, then you need insurance! 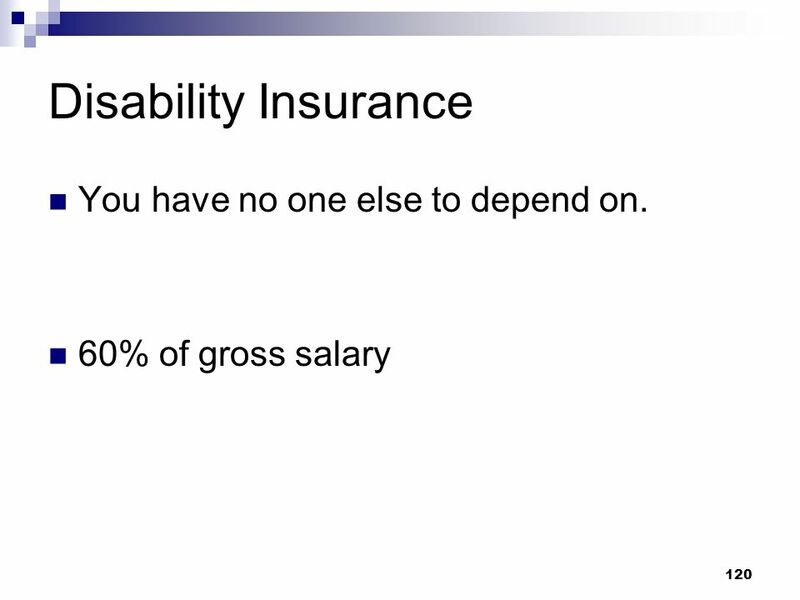 120 Disability Insurance You have no one else to depend on. 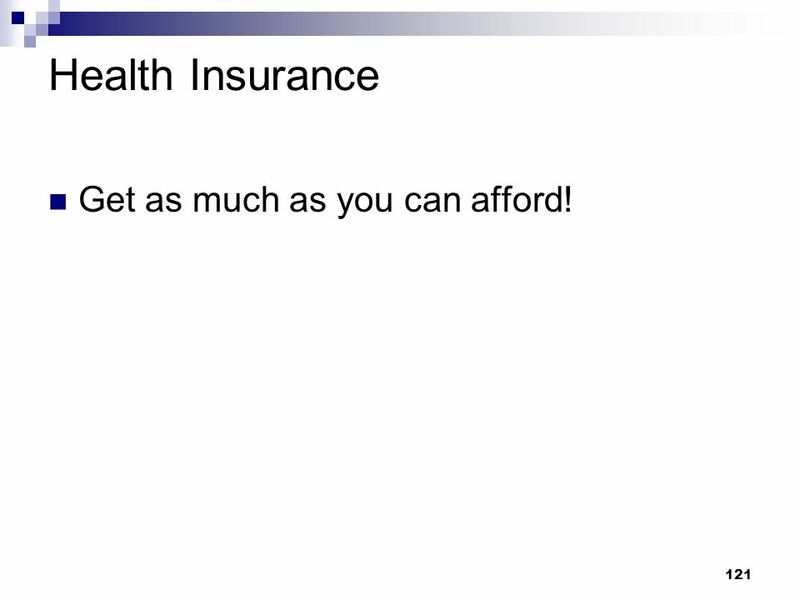 121 Health Insurance Get as much as you can afford! 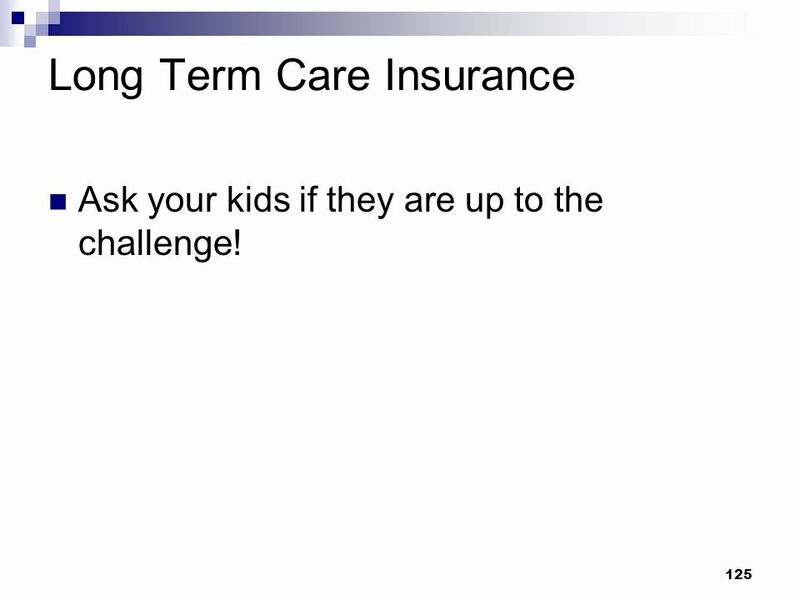 Ask your kids if they are up to the challenge! 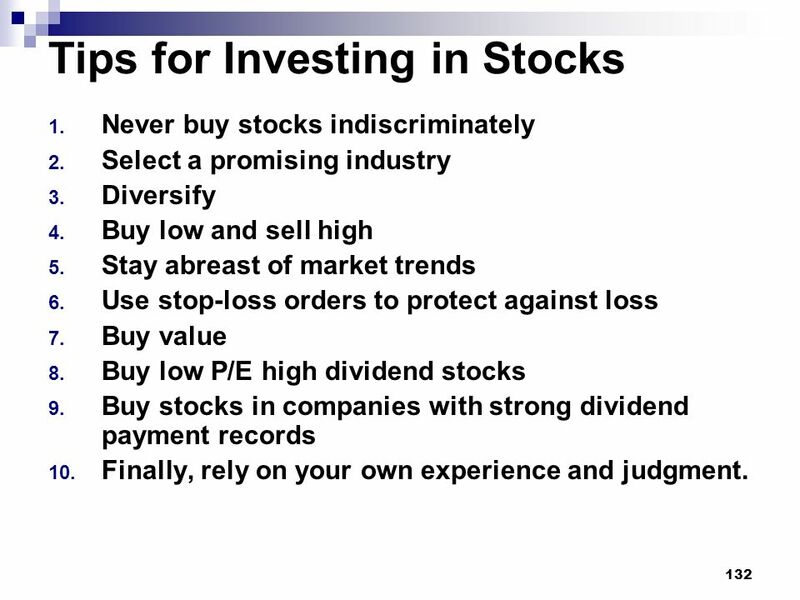 Never buy stocks indiscriminately Select a promising industry Diversify Buy low and sell high Stay abreast of market trends Use stop-loss orders to protect against loss Buy value Buy low P/E high dividend stocks Buy stocks in companies with strong dividend payment records Finally, rely on your own experience and judgment. 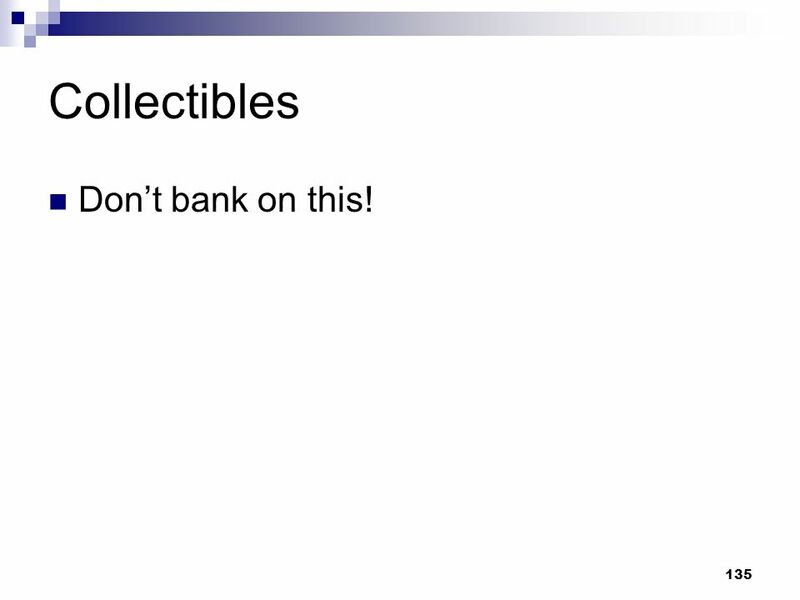 135 Collectibles Don’t bank on this! Running Out of Money is Your Biggest Challenge Retirement Needs Analysis – The 3 Step Process Step 1: What will be your shortfall at retirement? 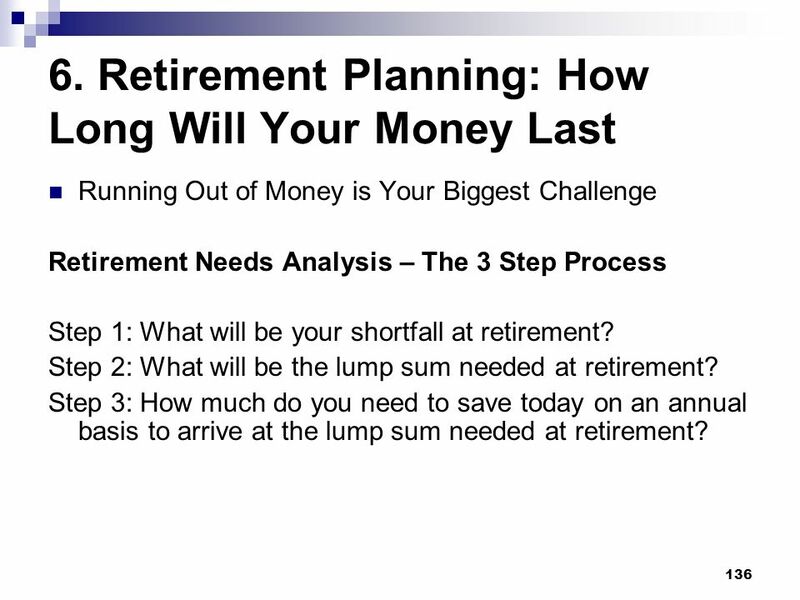 Step 2: What will be the lump sum needed at retirement? Step 3: How much do you need to save today on an annual basis to arrive at the lump sum needed at retirement? 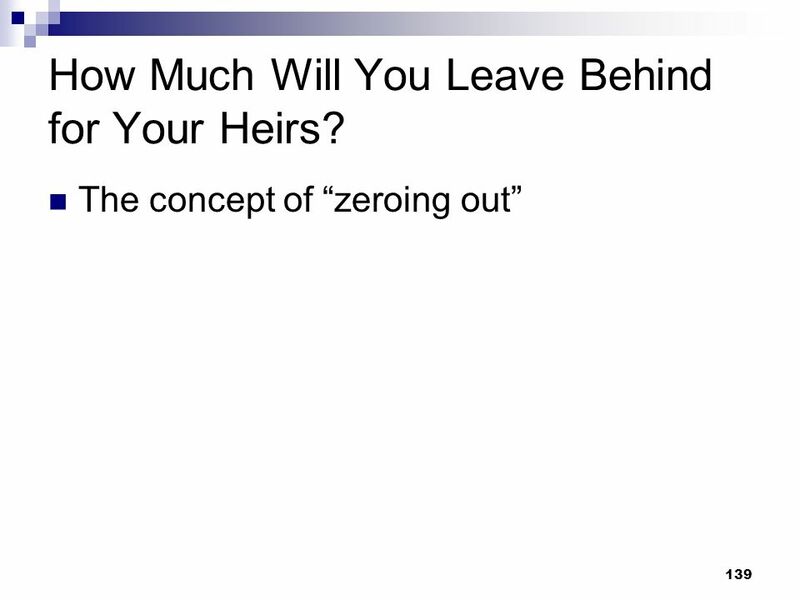 139 How Much Will You Leave Behind for Your Heirs? a)	Identify qualification triggers for benefit eligibility. 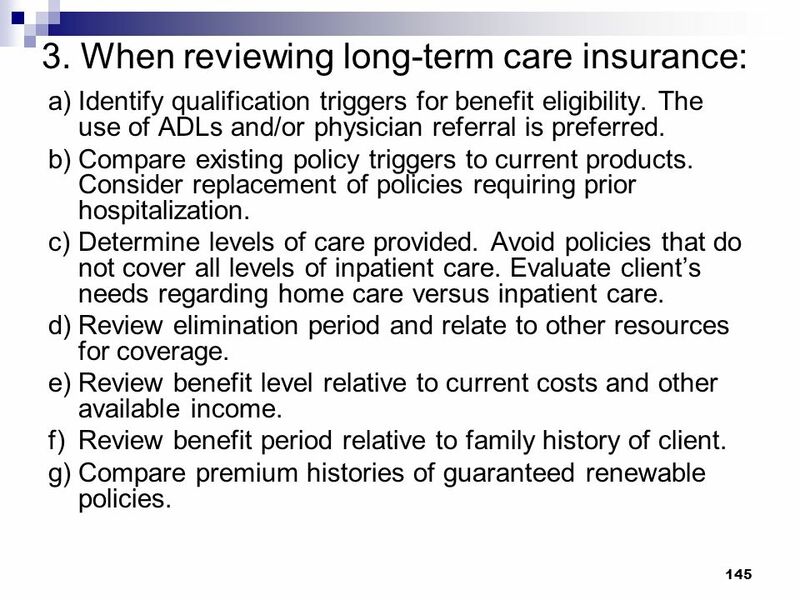 The use of ADLs and/or physician referral is preferred. 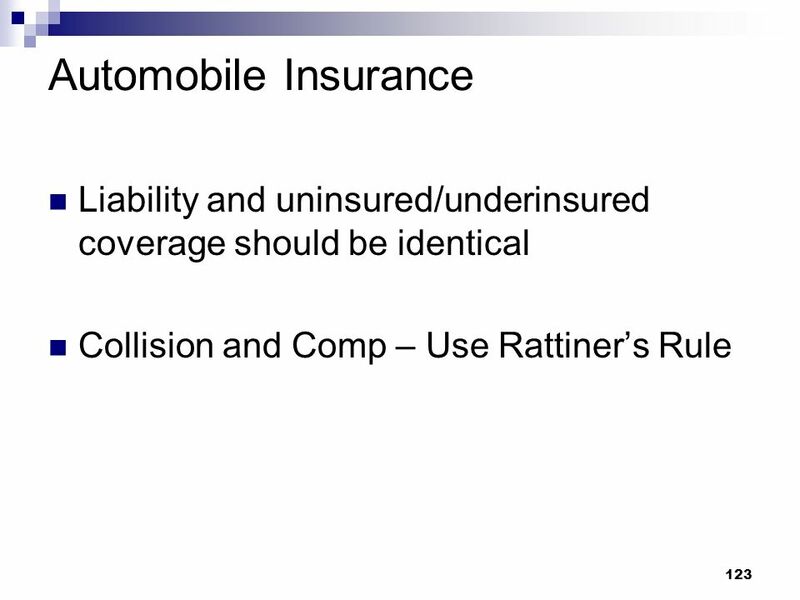 b)	Compare existing policy triggers to current products. 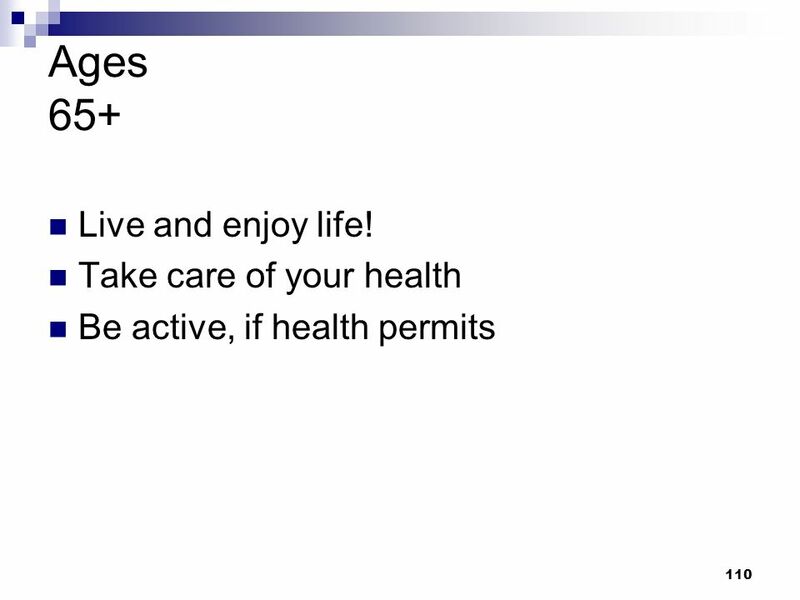 Consider replacement of policies requiring prior hospitalization. c)	Determine levels of care provided. Avoid policies that do not cover all levels of inpatient care. Evaluate client’s needs regarding home care versus inpatient care. 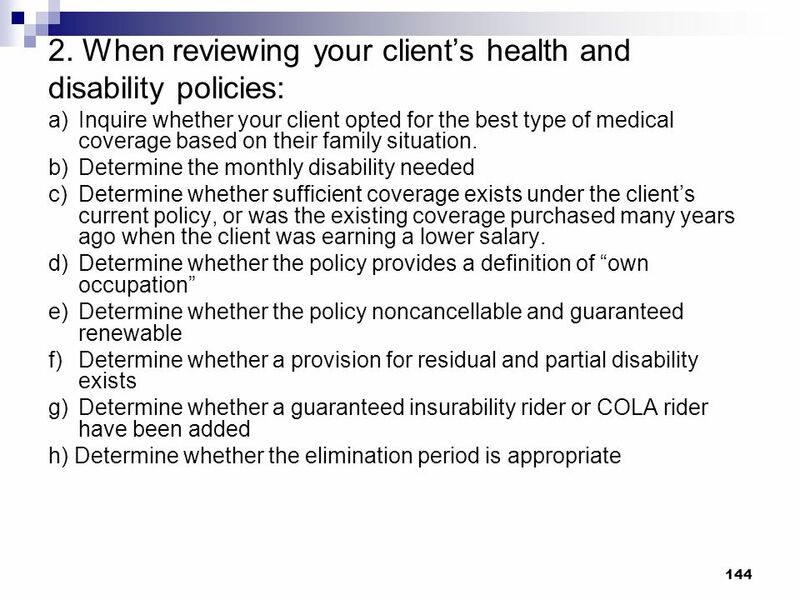 d)	Review elimination period and relate to other resources for coverage. 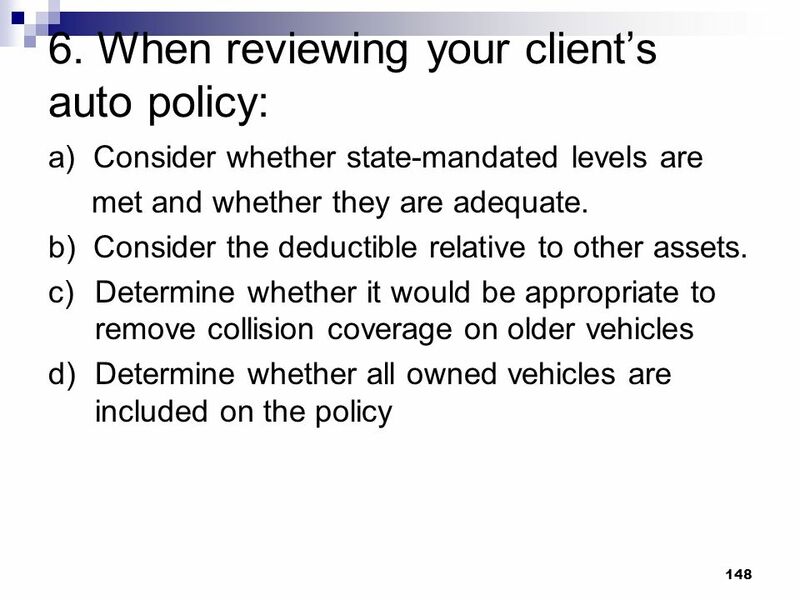 e)	Review benefit level relative to current costs and other available income. f)	Review benefit period relative to family history of client. g)	Compare premium histories of guaranteed renewable policies. 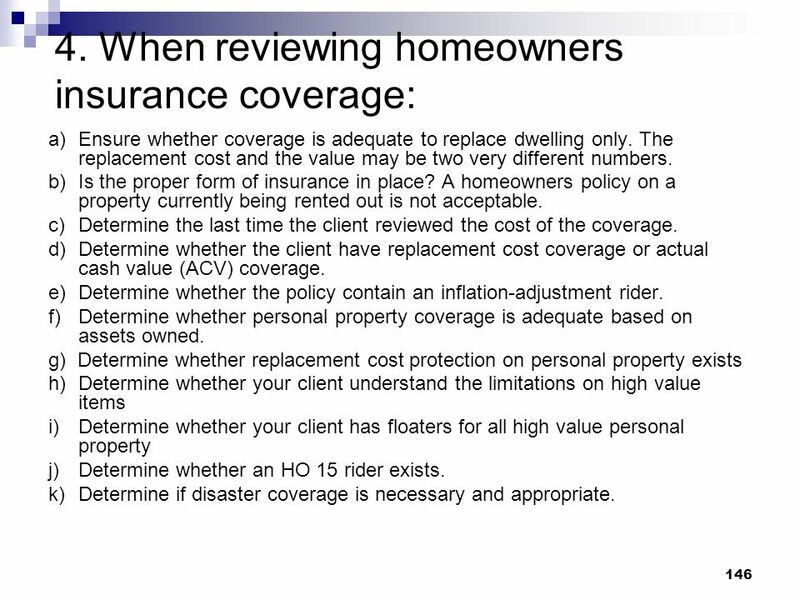 a)	Ensure whether coverage is adequate to replace dwelling only. The replacement cost and the value may be two very different numbers. 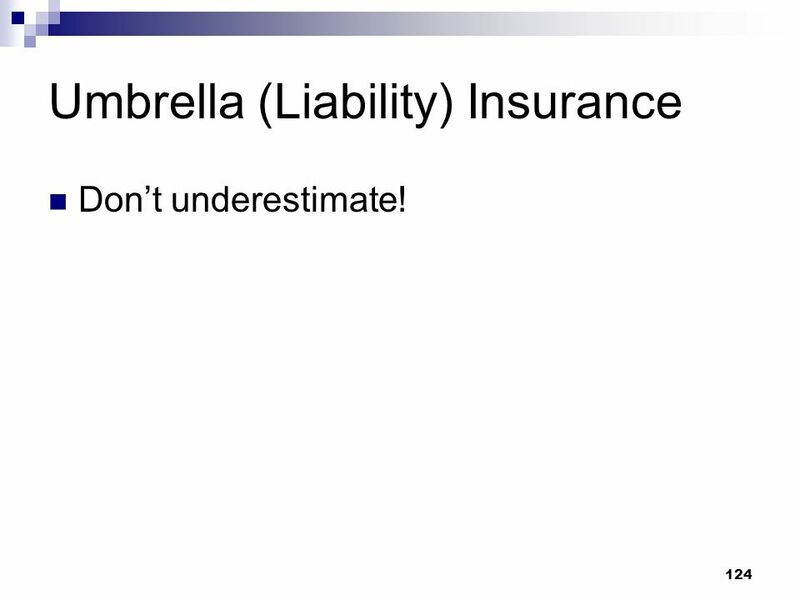 b)	Is the proper form of insurance in place? A homeowners policy on a property currently being rented out is not acceptable. 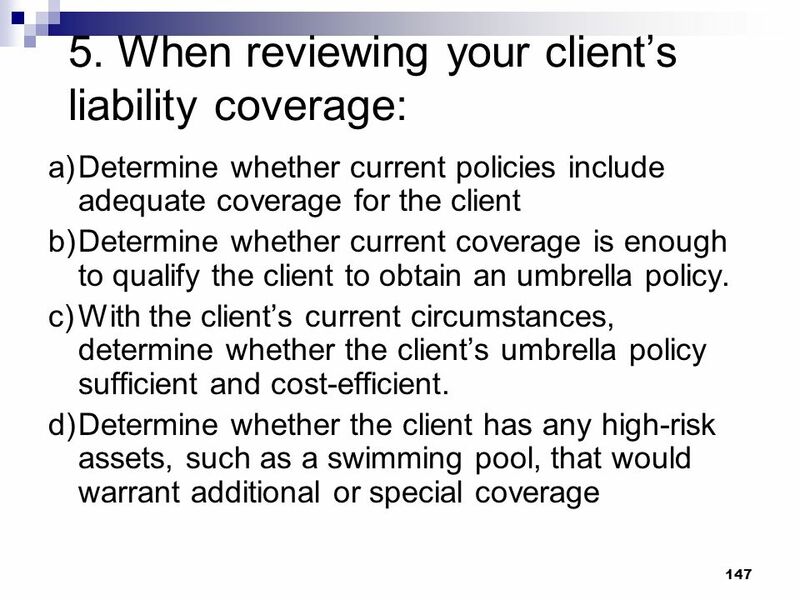 c)	Determine the last time the client reviewed the cost of the coverage. 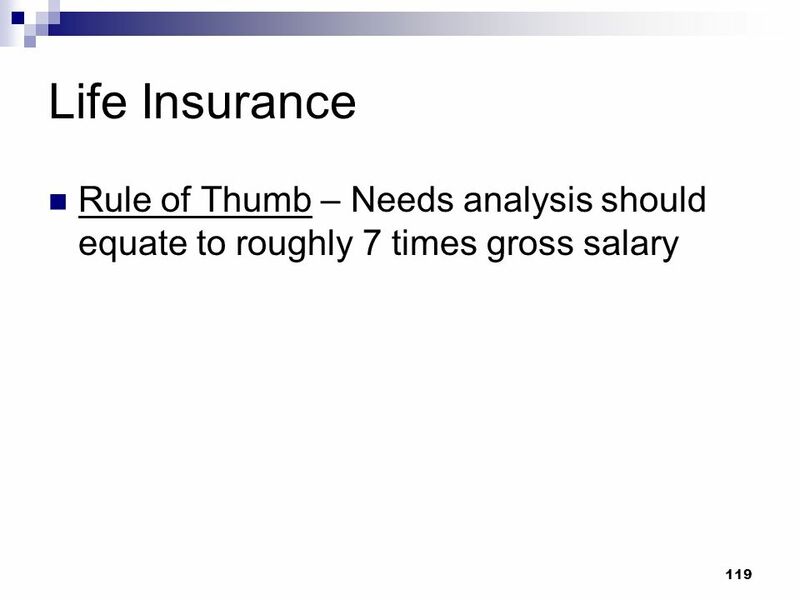 d)	Determine whether the client have replacement cost coverage or actual cash value (ACV) coverage. e)	Determine whether the policy contain an inflation-adjustment rider. 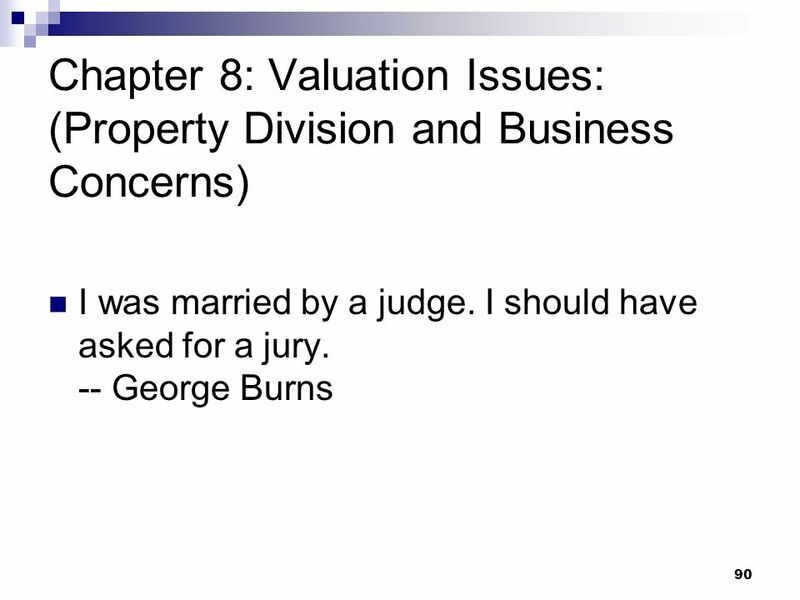 f)	Determine whether personal property coverage is adequate based on assets owned. 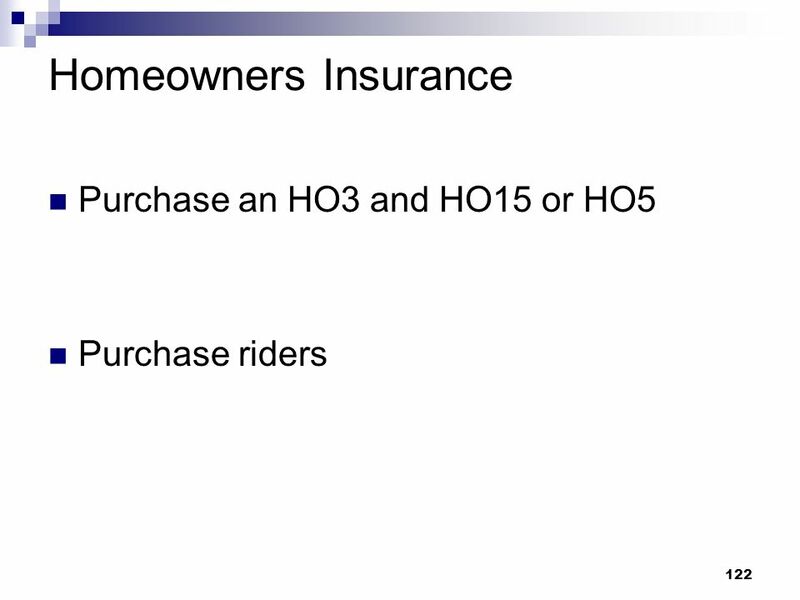 g) Determine whether replacement cost protection on personal property exists h)	Determine whether your client understand the limitations on high value items i)	Determine whether your client has floaters for all high value personal property j)	Determine whether an HO 15 rider exists. 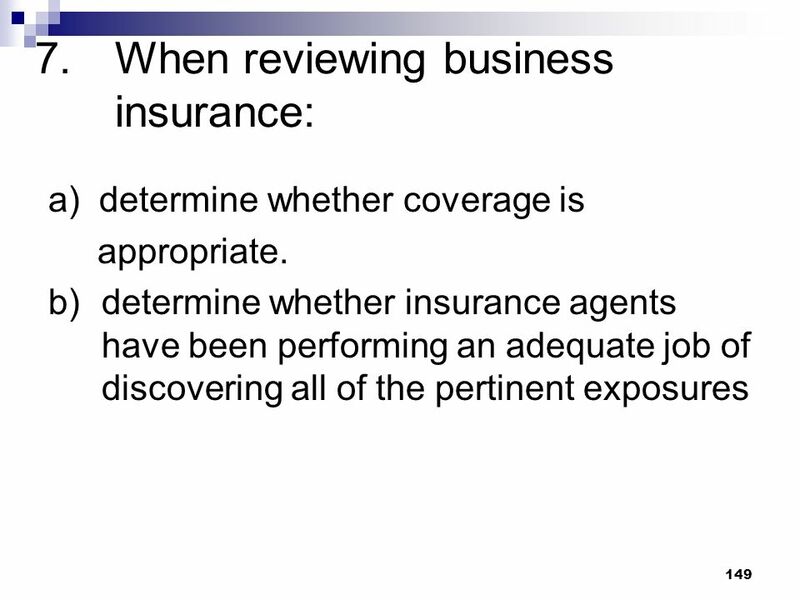 k)	Determine if disaster coverage is necessary and appropriate. 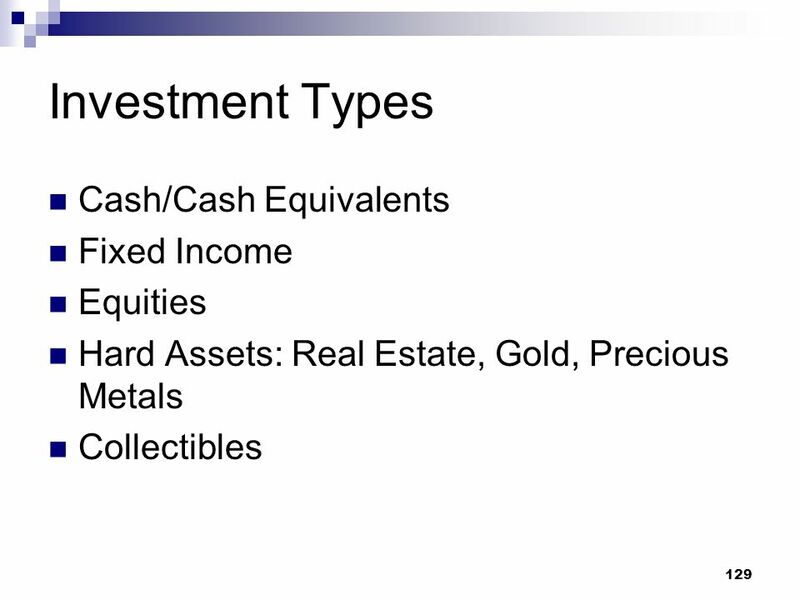 Determine how your investment are allocated, in total, amount the three investment categories: stock, fixed income and cash. 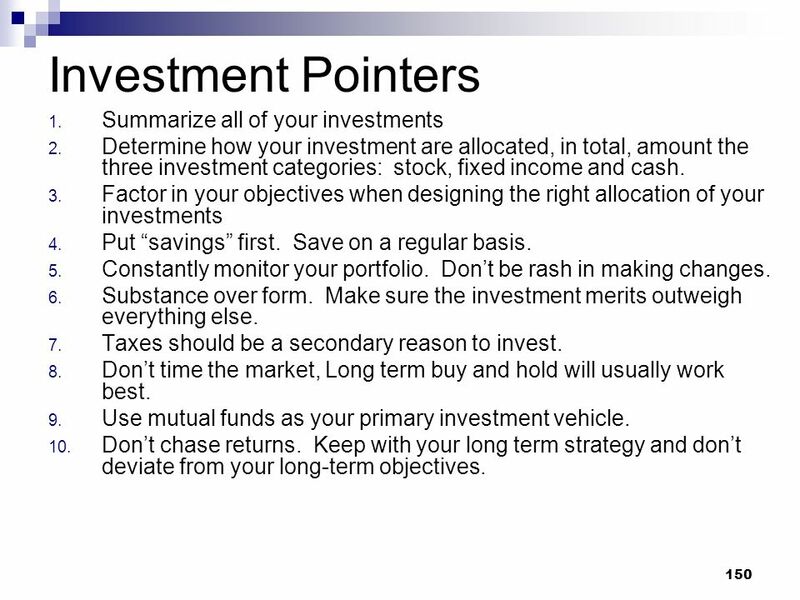 Factor in your objectives when designing the right allocation of your investments Put “savings” first. Save on a regular basis. Constantly monitor your portfolio. Don’t be rash in making changes. Substance over form. 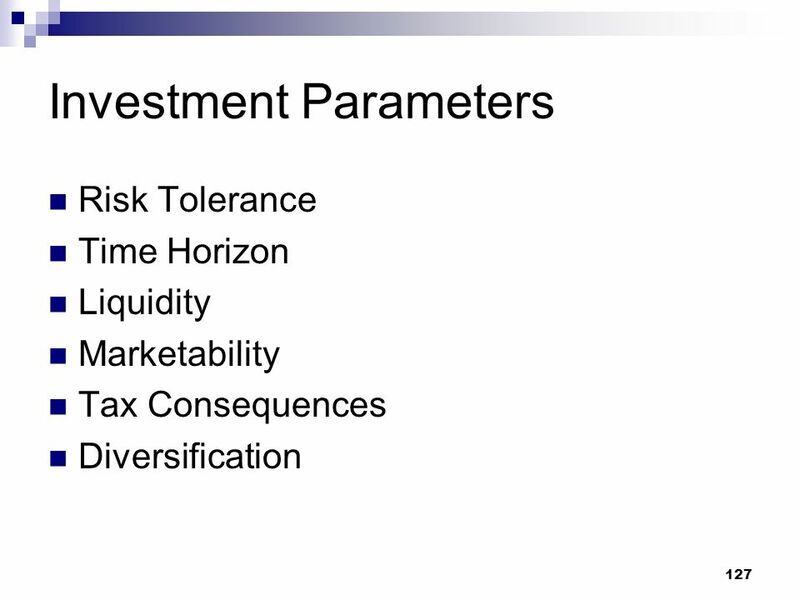 Make sure the investment merits outweigh everything else. Taxes should be a secondary reason to invest. Don’t time the market, Long term buy and hold will usually work best. 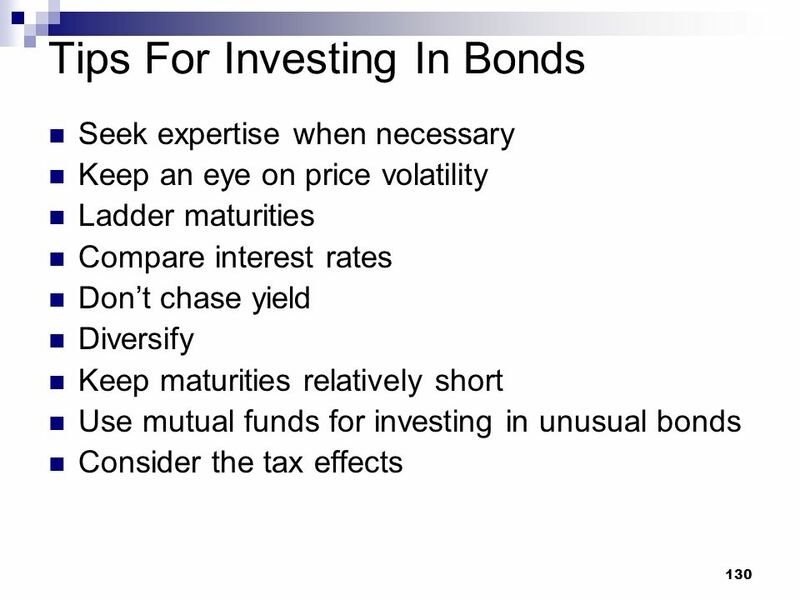 Use mutual funds as your primary investment vehicle. Don’t chase returns. 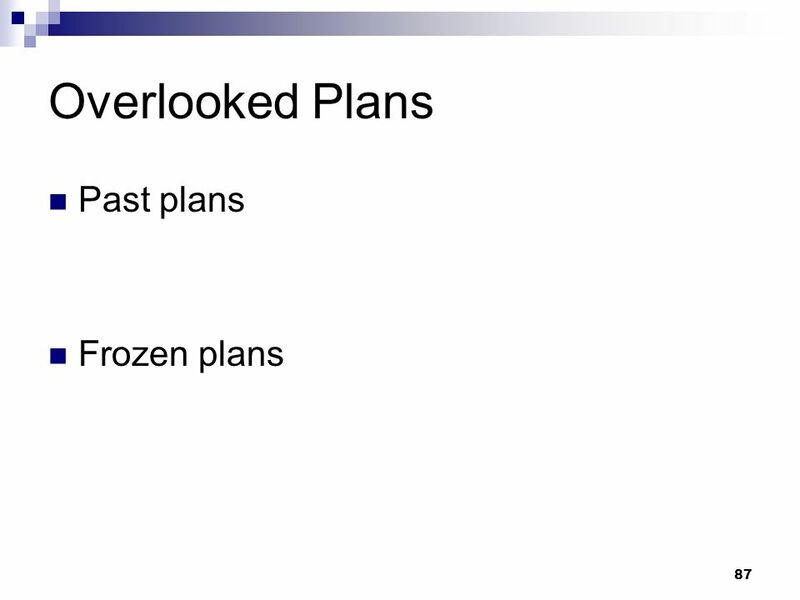 Keep with your long term strategy and don’t deviate from your long-term objectives. 151 Retirement Pointers 1. 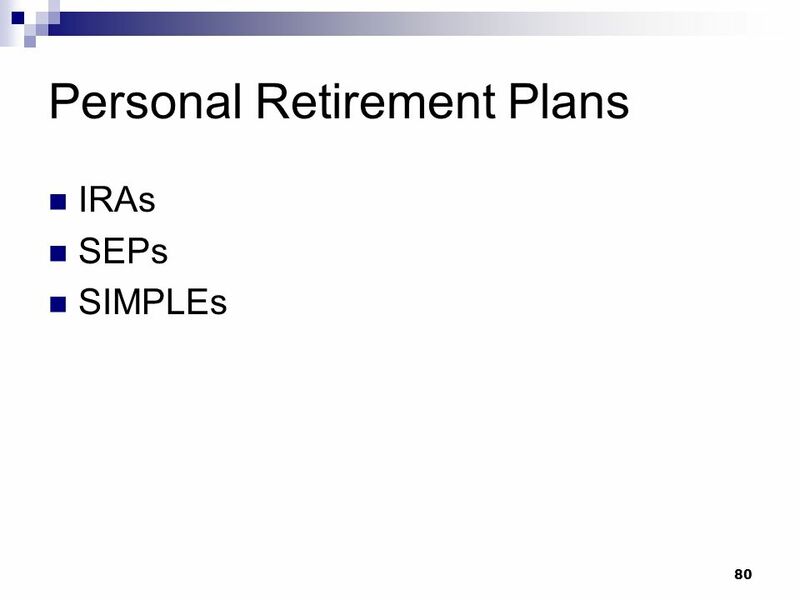 If the client’s savings program will not result in a sufficient amount to fund his or her retirement lifestyle, there are basically four courses of action: a)	save more, b)	earn more (a higher investment return on the retirement savings fund), c)	retire later, or d)	retire in a more modest lifestyle. Wherever possible, the client should be saving through a tax-deferred vehicle such as a qualified plan, or personal retirement plan, such as an IRA, SEP or SIMPLE. 3. 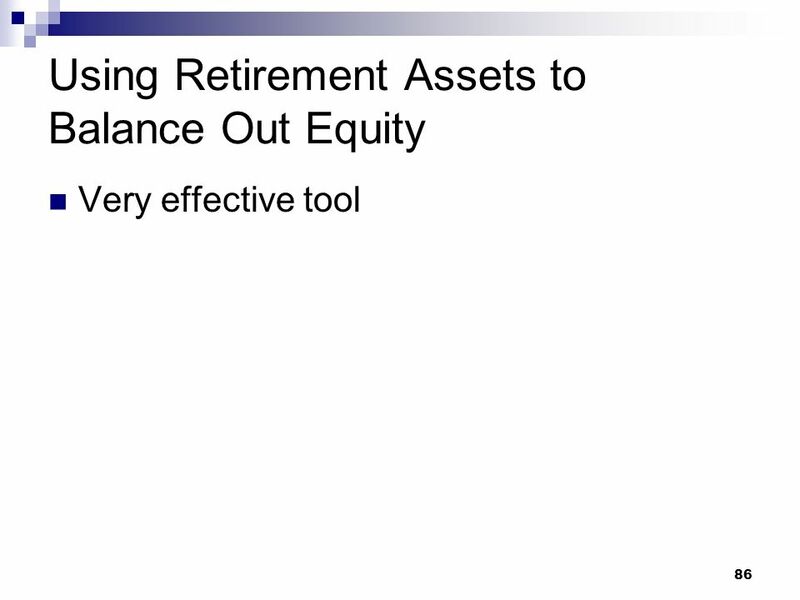 In determining the client’s retirement savings need, use appropriate assumptions for investment rate of return, inflation rate, years till retirement and years during retirement. 4. 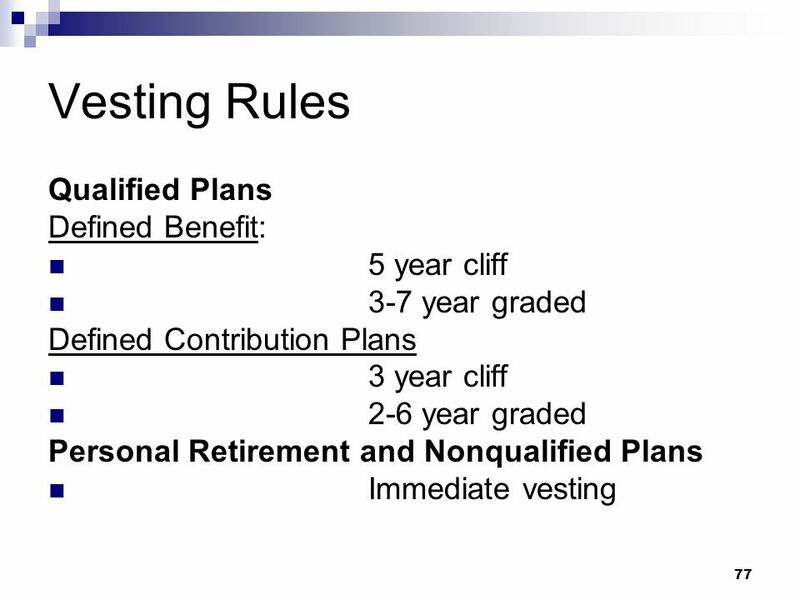 Retirement plan funds should be maintained in tax-deferred accounts to maximize the benefits of tax deferral. Urge the client to consider alternate sources of funds needed during the pre-retirement period, so that retirement plan balances will not be eroded. 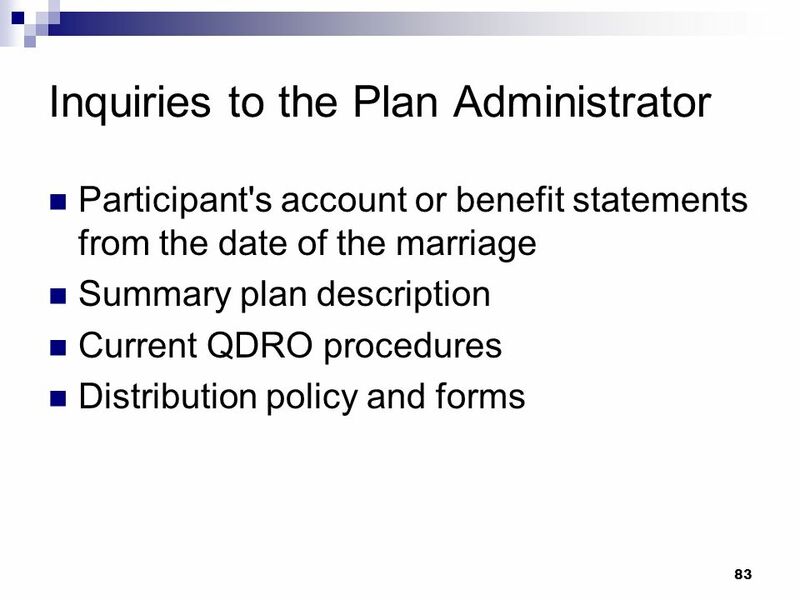 5.	Review beneficiary designations on all retirement plan accounts to ensure that they are consistent with the client’s goals. 6. Keep retirement planning in view as short-term decisions are being made regarding the use of income and assets. 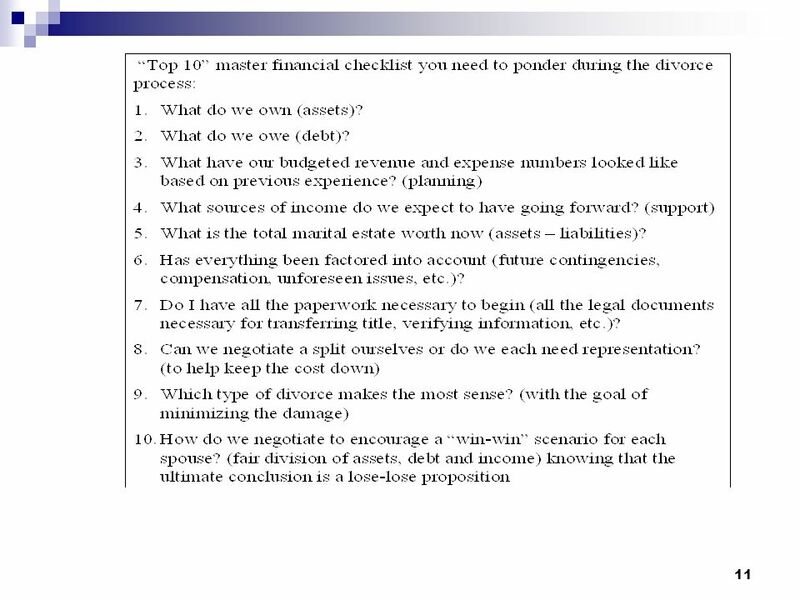 7.	Review the client’s retirement projections periodically; revise the analysis periodically, and in the event of material changes in the client’s situation (change of employment, divorce/marriage, death of spouse) 8. 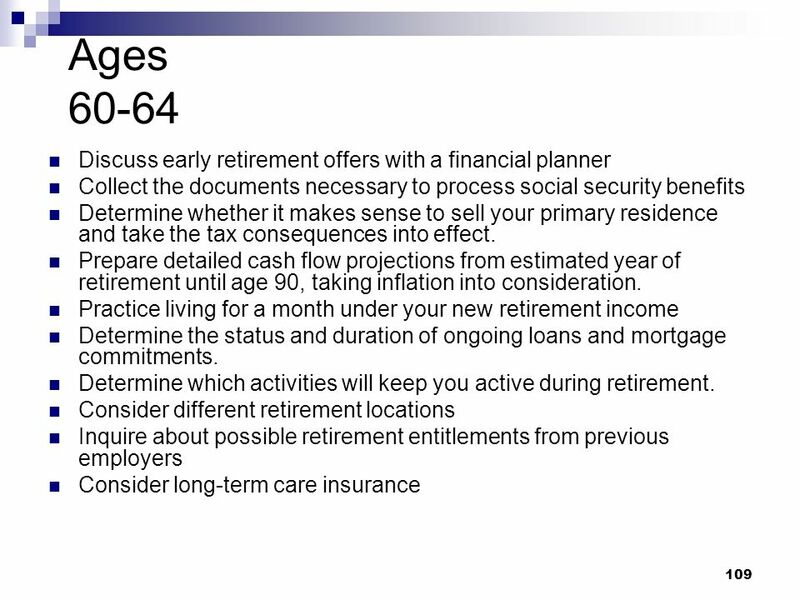 As the client approaches retirement, plan on incorporating the stretch (multi-general) IRA to enable the retirement funds to grow tax deferred as long as possible. 9. 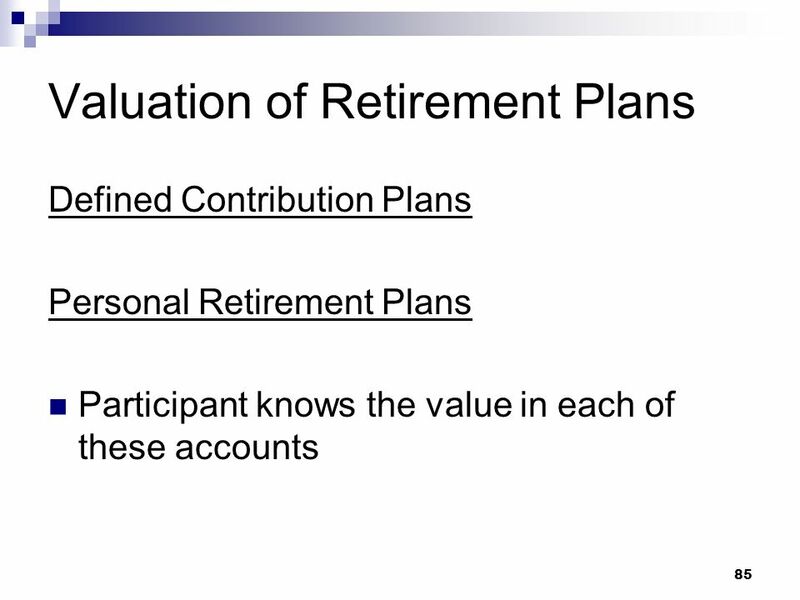 Fully analyze any projections made by other professionals when projecting a pension maximization or other recommendation. 10. 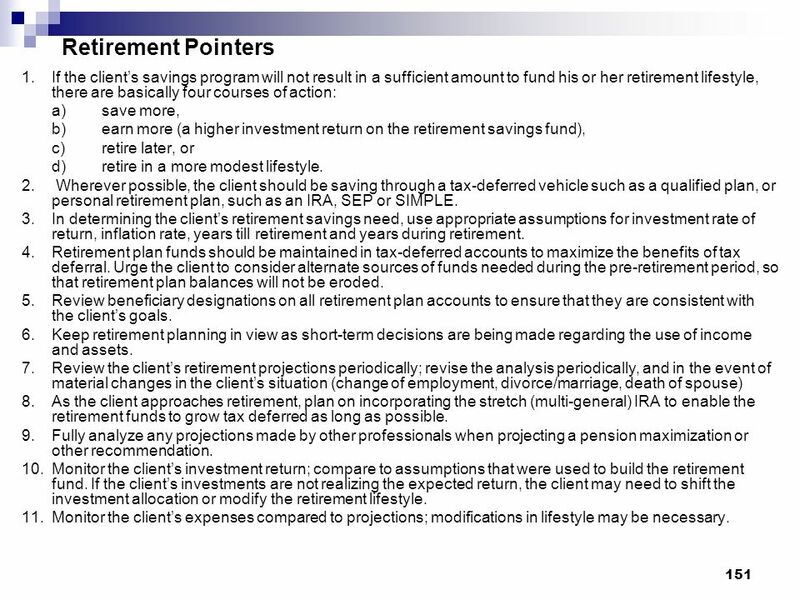 Monitor the client’s investment return; compare to assumptions that were used to build the retirement fund. If the client’s investments are not realizing the expected return, the client may need to shift the investment allocation or modify the retirement lifestyle. 11. 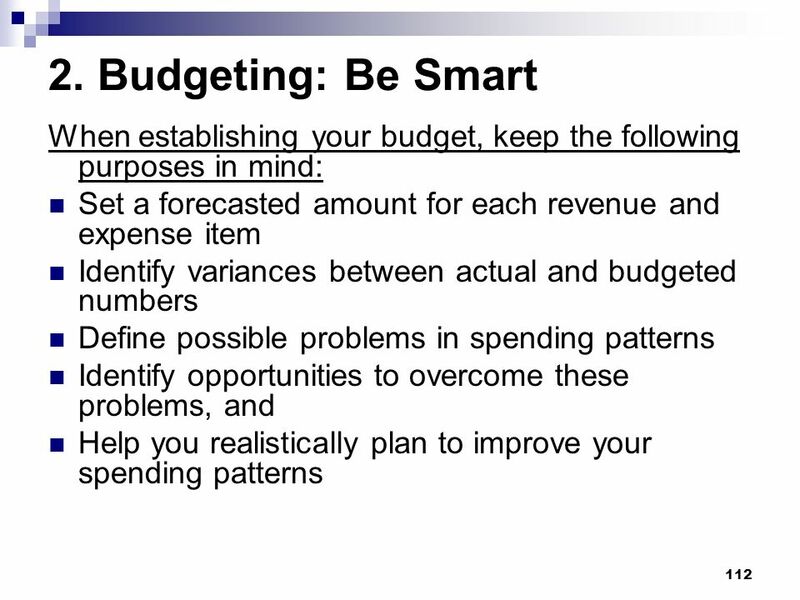 Monitor the client’s expenses compared to projections; modifications in lifestyle may be necessary. 1. In considering any gift or estate strategy, analyze the basis aspects of any particular property being planned for use in the strategy. 2. 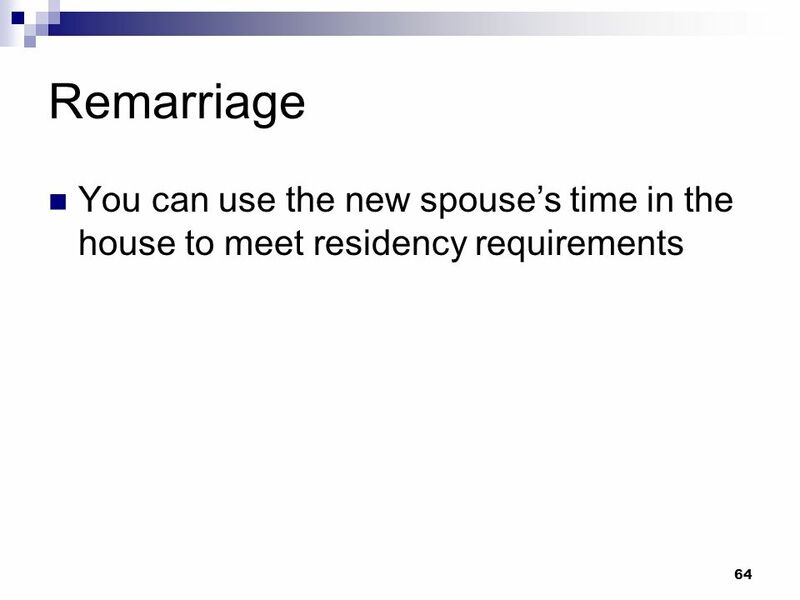 Where spousal transfers are involved, always check the citizenship of the transferee spouse. 3. Where necessary, be willing to pay a small tax to achieve an important personal objective. 4. Recommend a will even in situations where the plan in place will avoid probate completely. 5. 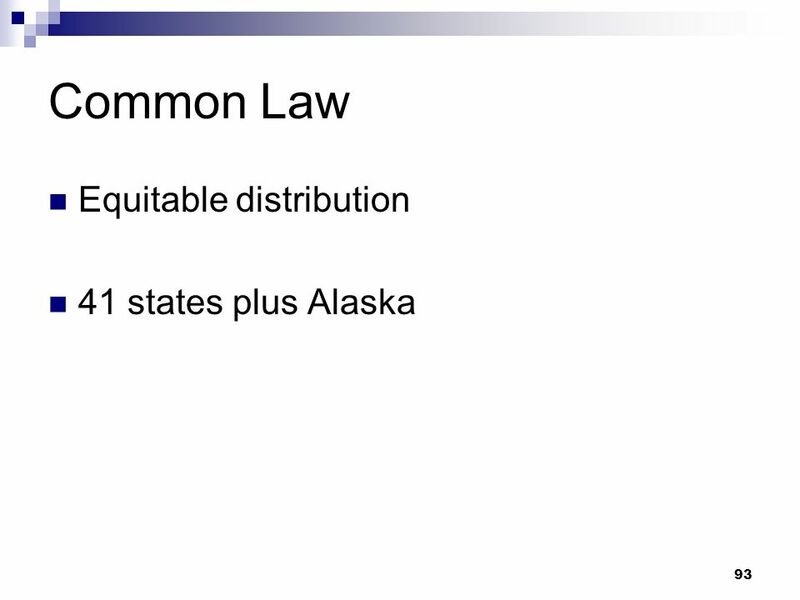 Encourage the use of a durable power of attorney and the medical proxies available under state law. 6. 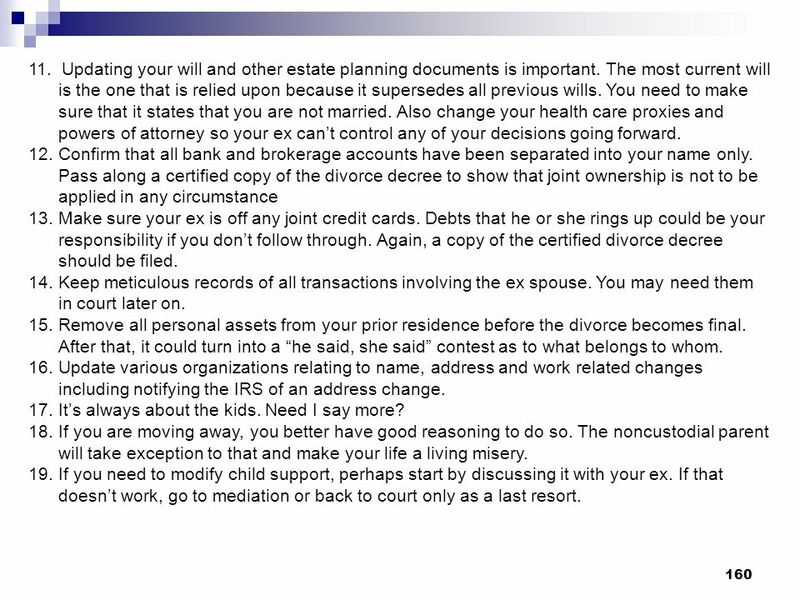 Strongly recommend filing a will and other estate documents for safekeeping with the appropriate court. 7. Among retirees consider all charitable giving techniques that would enhance current income. 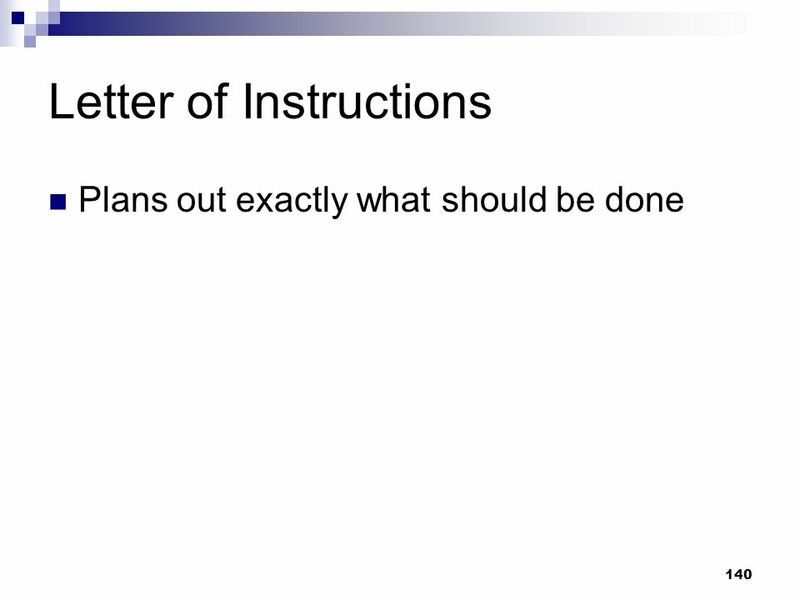 8.	Review all indications of domicile and try to consolidate domicile as much as possible. 9. 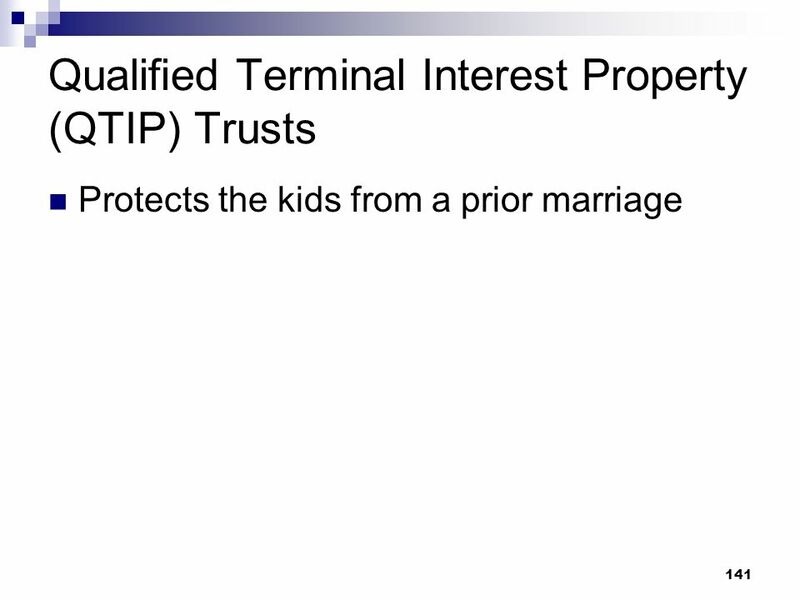 Avoid presenting clients with probate and revocable trusts as an either-or proposition. 10. 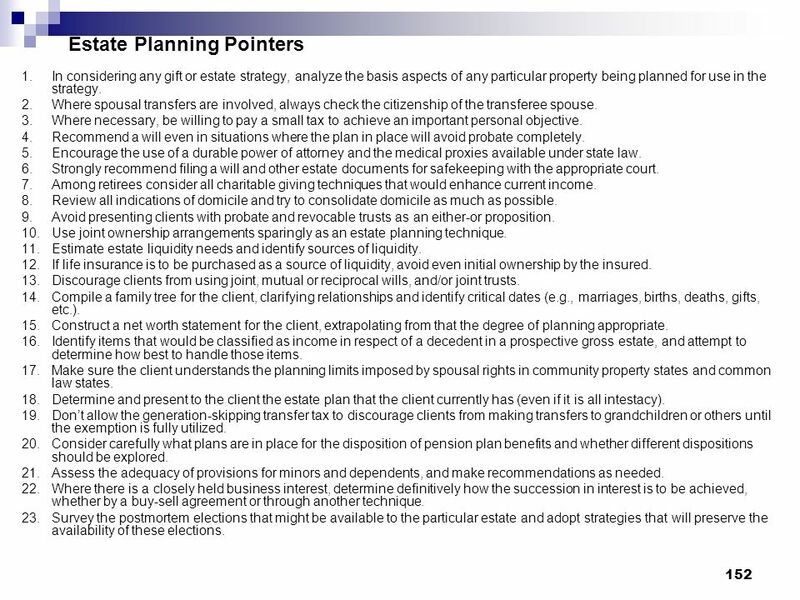 Use joint ownership arrangements sparingly as an estate planning technique. 11. 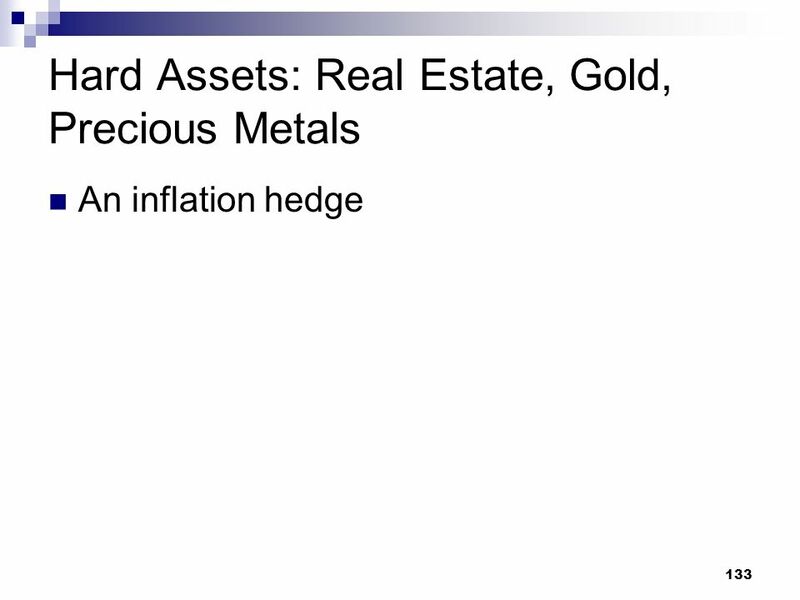 Estimate estate liquidity needs and identify sources of liquidity. 12. If life insurance is to be purchased as a source of liquidity, avoid even initial ownership by the insured. 13. Discourage clients from using joint, mutual or reciprocal wills, and/or joint trusts. 14. Compile a family tree for the client, clarifying relationships and identify critical dates (e.g., marriages, births, deaths, gifts, etc.). 15. 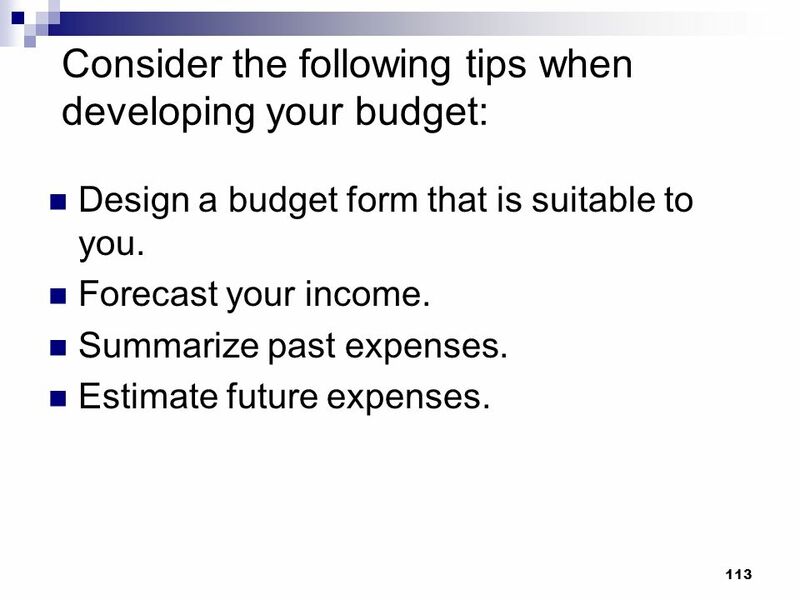 Construct a net worth statement for the client, extrapolating from that the degree of planning appropriate. 16. 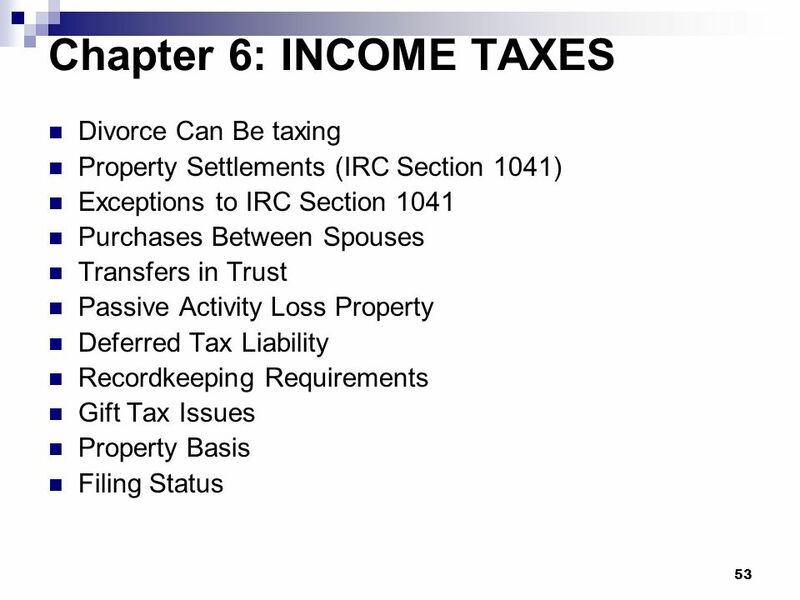 Identify items that would be classified as income in respect of a decedent in a prospective gross estate, and attempt to determine how best to handle those items. 17. 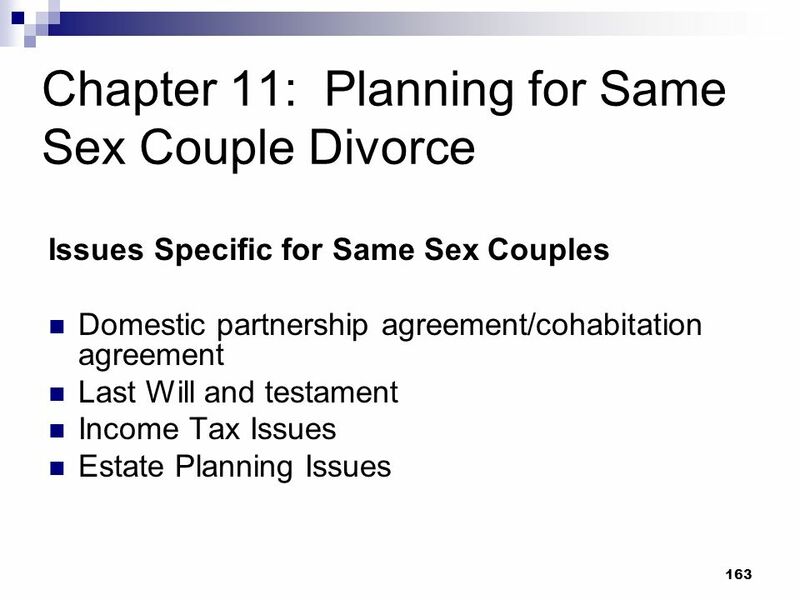 Make sure the client understands the planning limits imposed by spousal rights in community property states and common law states. 18. 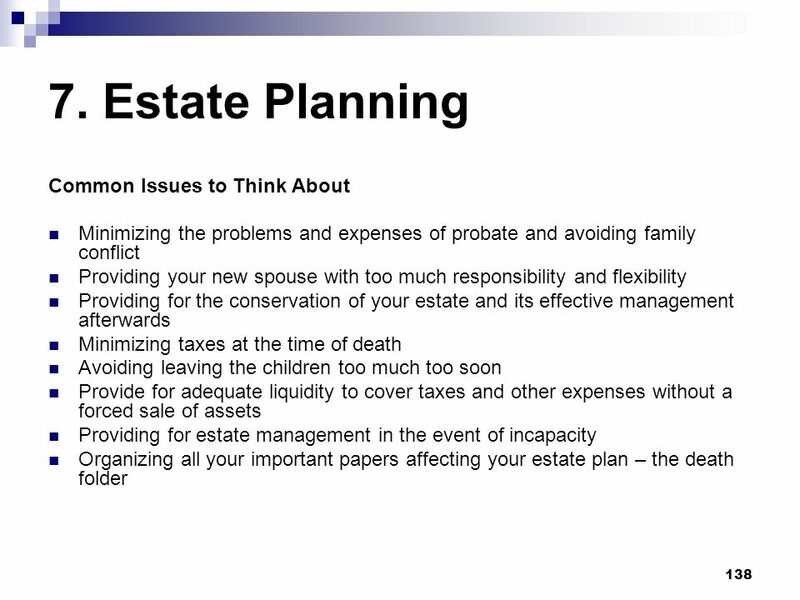 Determine and present to the client the estate plan that the client currently has (even if it is all intestacy). 19. Don’t allow the generation-skipping transfer tax to discourage clients from making transfers to grandchildren or others until the exemption is fully utilized. 20. 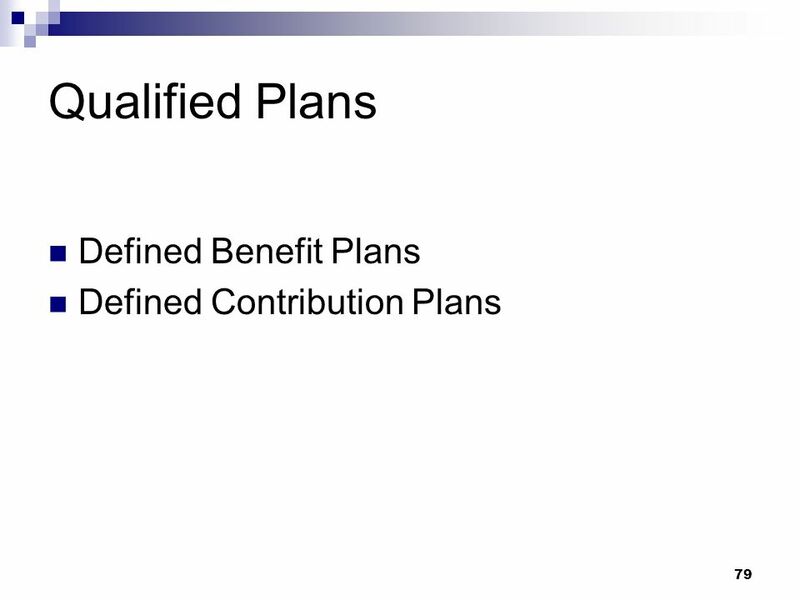 Consider carefully what plans are in place for the disposition of pension plan benefits and whether different dispositions should be explored. 21. Assess the adequacy of provisions for minors and dependents, and make recommendations as needed. 22. 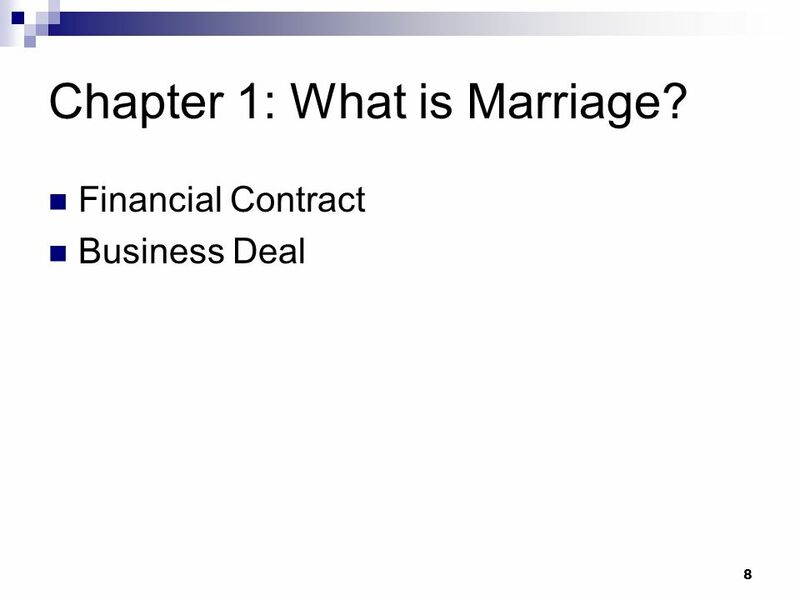 Where there is a closely held business interest, determine definitively how the succession in interest is to be achieved, whether by a buy-sell agreement or through another technique. 23. Survey the postmortem elections that might be available to the particular estate and adopt strategies that will preserve the availability of these elections. 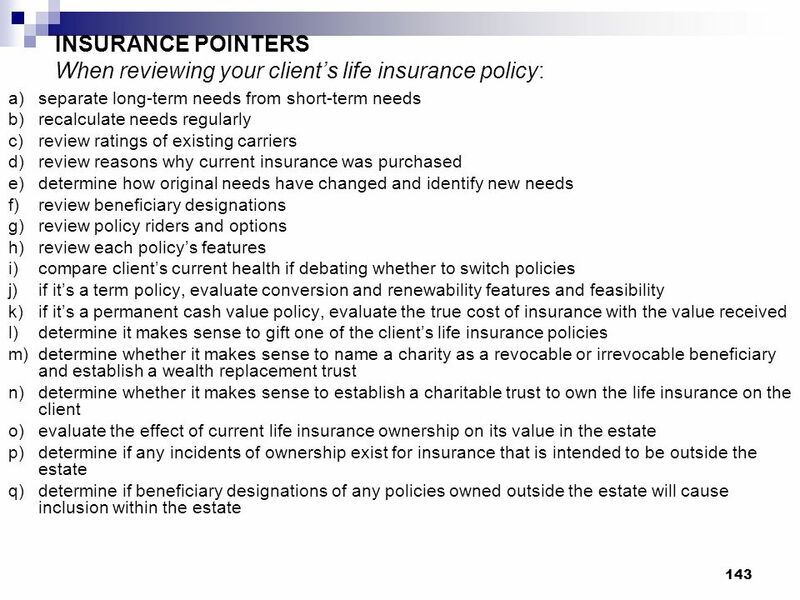 The following items should be included in a will: Statement that the document is a will. Statement revoking all previous wills. Your full name and location of principal residence. Specific transfers of property to the named beneficiaries. 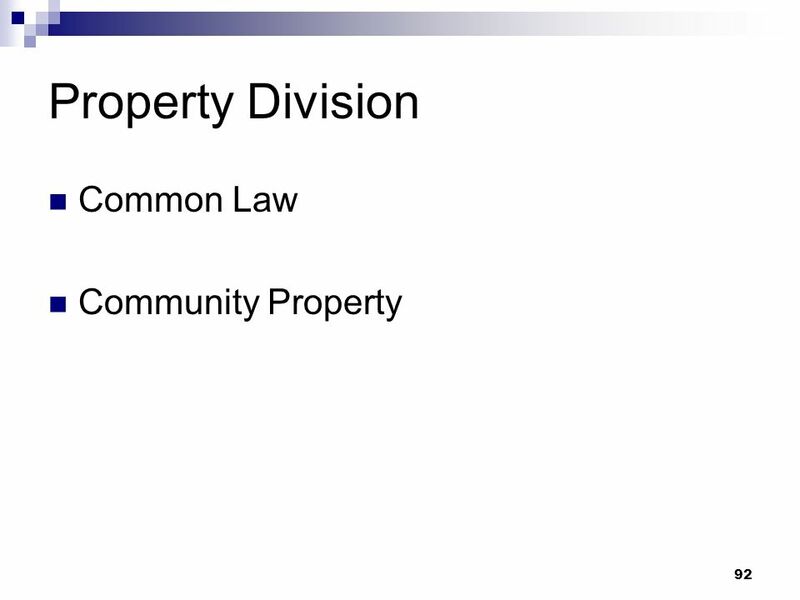 Instructions for dividing the balance of the property. Identify trusts, including the names of selected trustees and successor trustees. Names of guardians and alternate guardians for minor children or special needs relatives. Designation of what monies are to be used to pay death taxes. Names of the executor and back-up executor. Signature and date. The will should be signed in the presence of all of the witnesses. Did You Know? 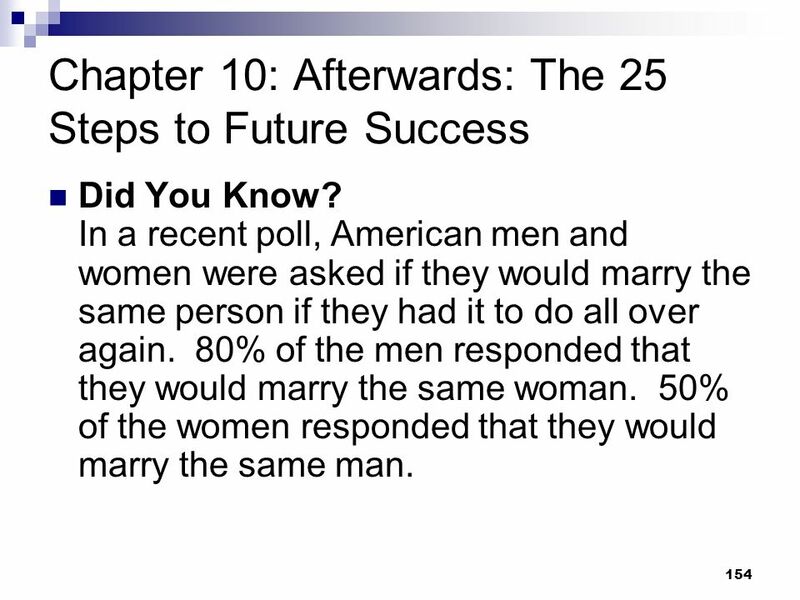 In a recent poll, American men and women were asked if they would marry the same person if they had it to do all over again. 80% of the men responded that they would marry the same woman. 50% of the women responded that they would marry the same man. 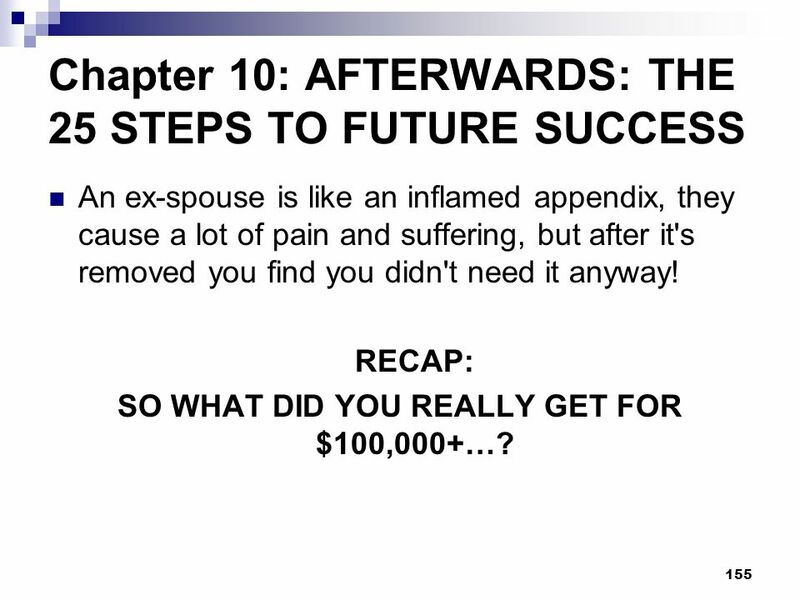 An ex-spouse is like an inflamed appendix, they cause a lot of pain and suffering, but after it's removed you find you didn't need it anyway! RECAP: SO WHAT DID YOU REALLY GET FOR $100,000+…? When it’s time to recap the events, you will have learned much from the process. It would have been easier, cheaper and healthier to work out the differences and the divorce during the process with minimal input from the lawyers. Chapter two of your life states that you’ve been through the worst already and now it’s your time to take care of yourself going forward. Remember, if you don’t no one else will, and there’s a lot of people counting on you. Read the divorce decree carefully. If you don’t agree with the conclusions, you need to correct it ASAP. Once the ink dries, it’s too late. Obtain certified copies of the divorce decree because there are many documents and many instances where it is a necessity. Most entities you’ll need to deal with won’t accept unofficial legal copies. Change the deed on real estate to your own name so you can apply for financing to buy your spouse out of his or her share of the housing interest. No tax liability is included in this transaction. Transfer the car titles to the spouse who ends up with the car. Make sure you have all documentation for paperwork regarding paid off loans or other liens. 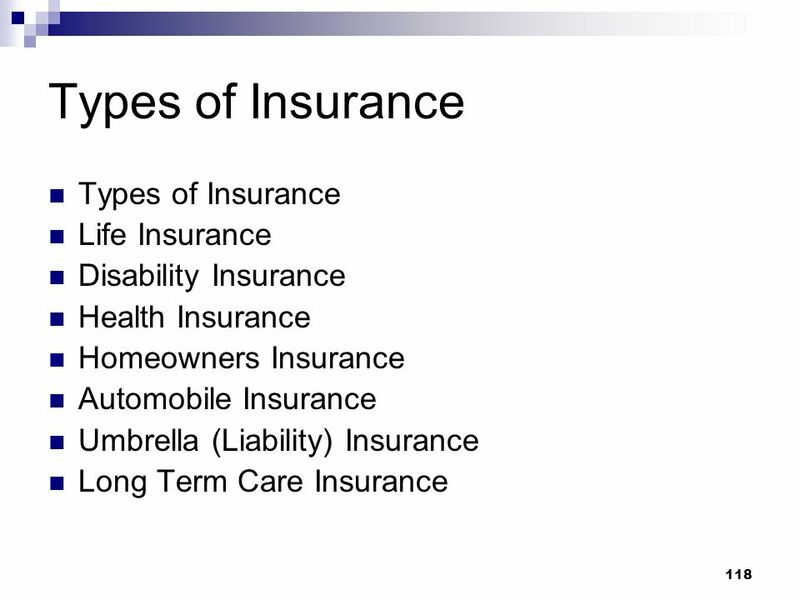 Update all your insurance policy beneficiary designations. Remember, insurance passes by contract of law and that will always supersede a will. If you don’t change them, then the person you want to get the benefits may not be legally entitled to them. 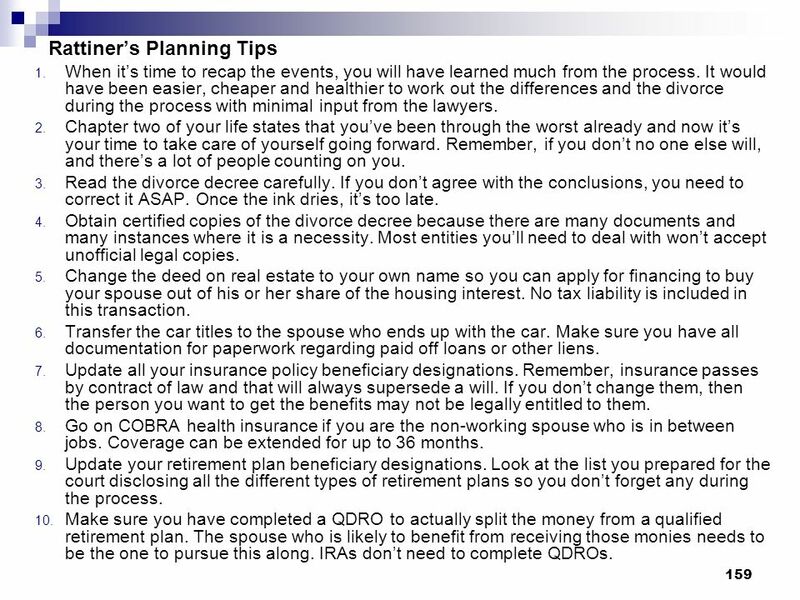 Go on COBRA health insurance if you are the non-working spouse who is in between jobs. Coverage can be extended for up to 36 months. 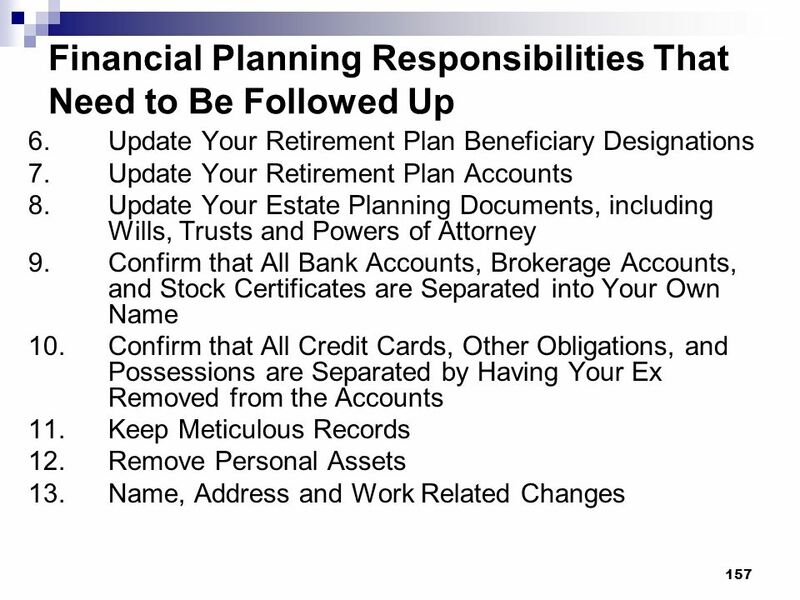 Update your retirement plan beneficiary designations. 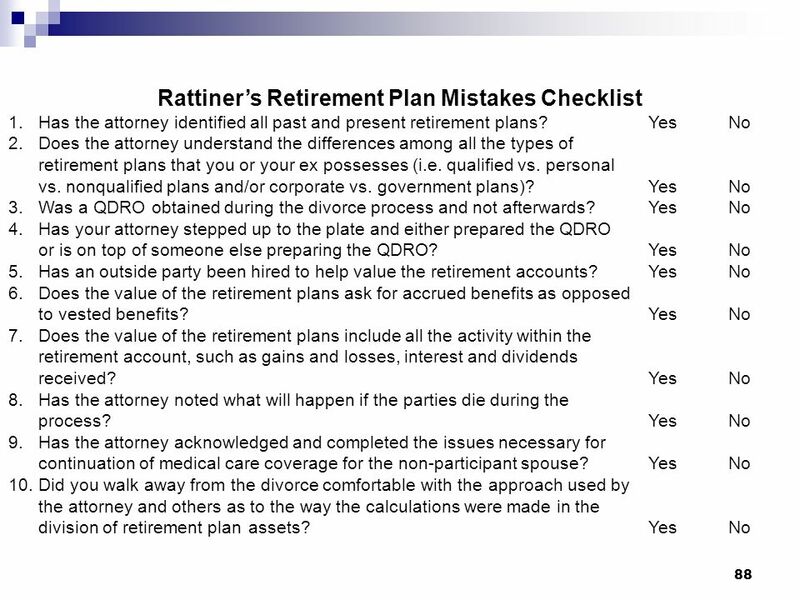 Look at the list you prepared for the court disclosing all the different types of retirement plans so you don’t forget any during the process. 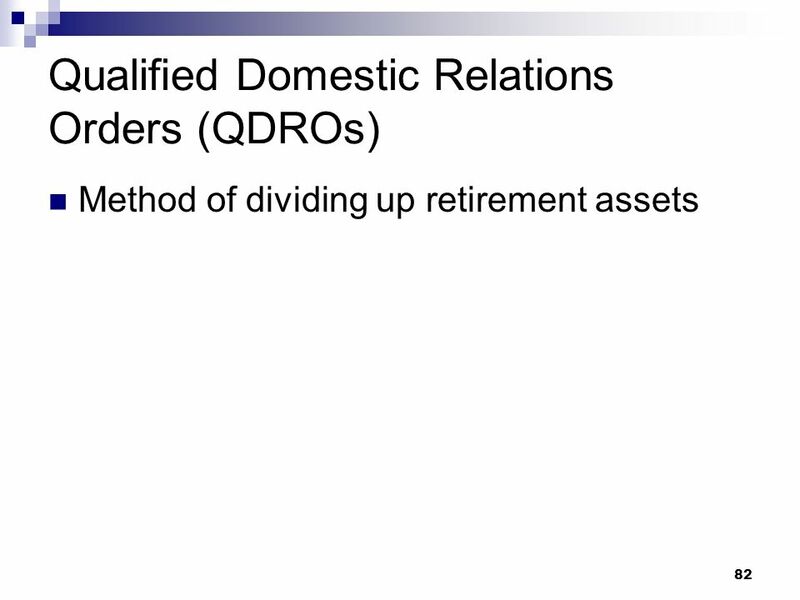 Make sure you have completed a QDRO to actually split the money from a qualified retirement plan. The spouse who is likely to benefit from receiving those monies needs to be the one to pursue this along. 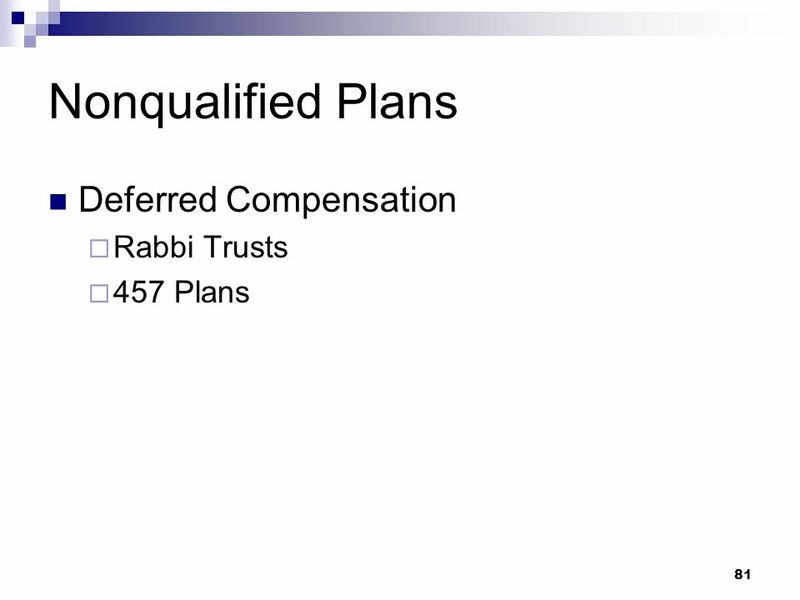 IRAs don’t need to complete QDROs. 160 11. 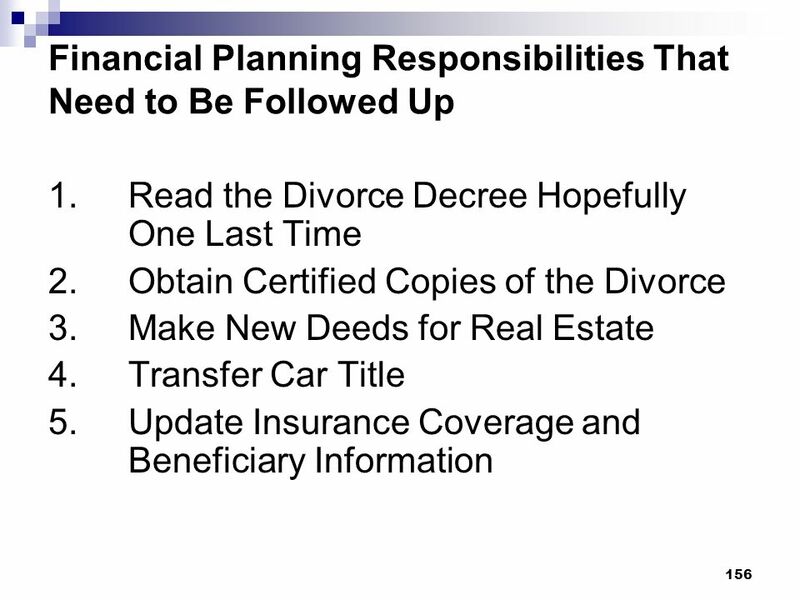 Updating your will and other estate planning documents is important. The most current will is the one that is relied upon because it supersedes all previous wills. You need to make sure that it states that you are not married. Also change your health care proxies and powers of attorney so your ex can’t control any of your decisions going forward. 12. Confirm that all bank and brokerage accounts have been separated into your name only. Pass along a certified copy of the divorce decree to show that joint ownership is not to be applied in any circumstance 13. 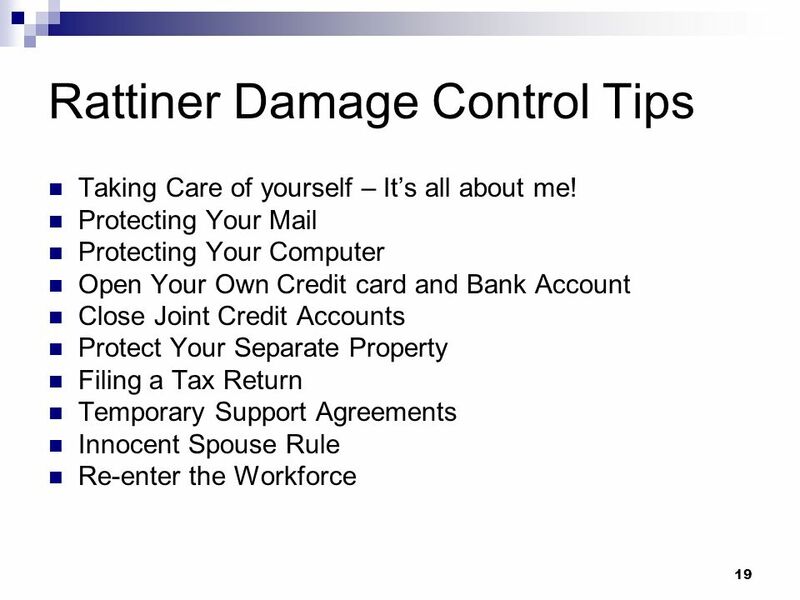 Make sure your ex is off any joint credit cards. 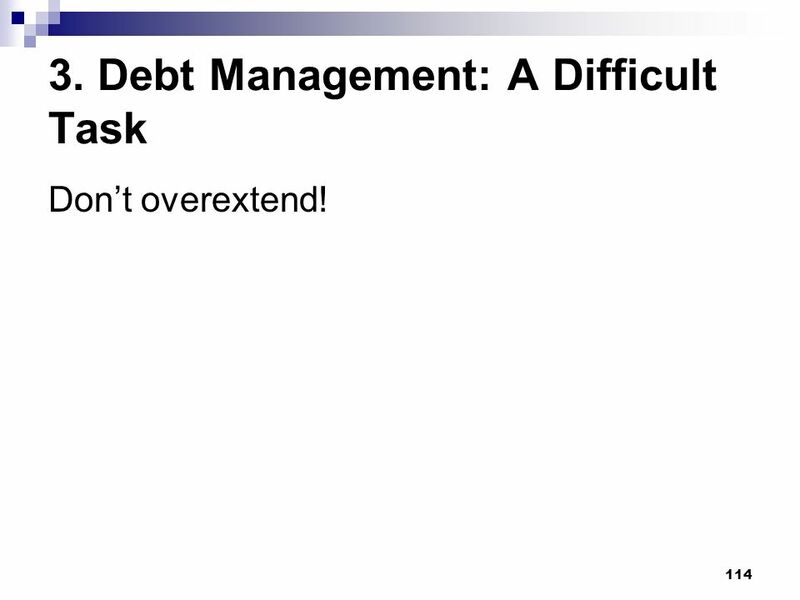 Debts that he or she rings up could be your responsibility if you don’t follow through. Again, a copy of the certified divorce decree should be filed. 14. 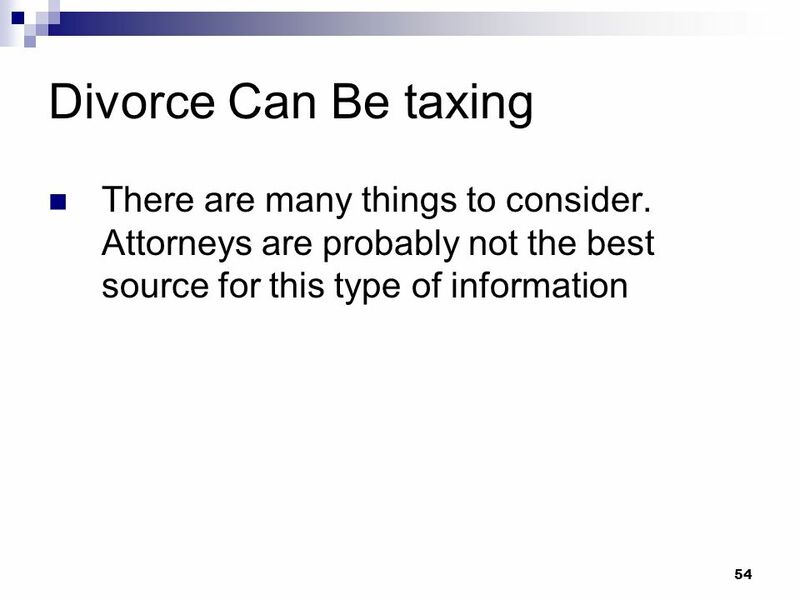 Keep meticulous records of all transactions involving the ex spouse. You may need them in court later on. 15. 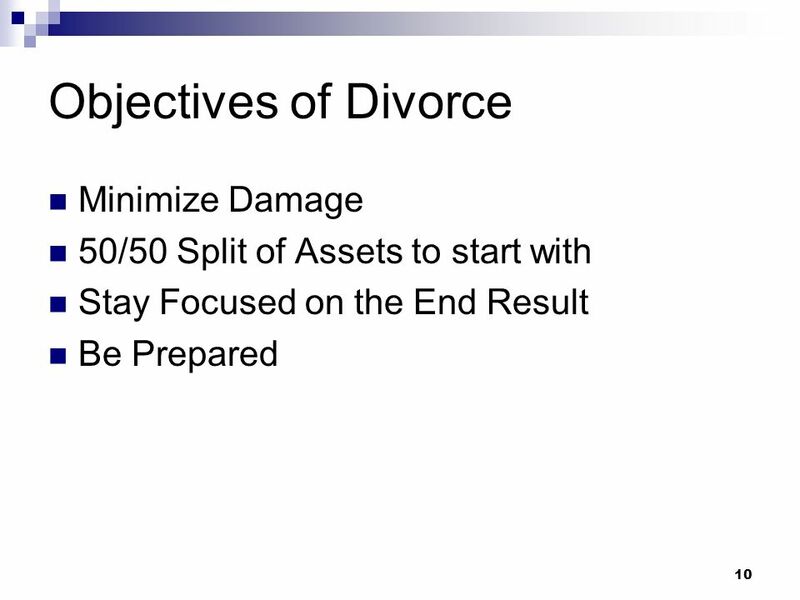 Remove all personal assets from your prior residence before the divorce becomes final. After that, it could turn into a “he said, she said” contest as to what belongs to whom. 16. Update various organizations relating to name, address and work related changes including notifying the IRS of an address change. 17. It’s always about the kids. Need I say more? 18. If you are moving away, you better have good reasoning to do so. The noncustodial parent will take exception to that and make your life a living misery. 19. 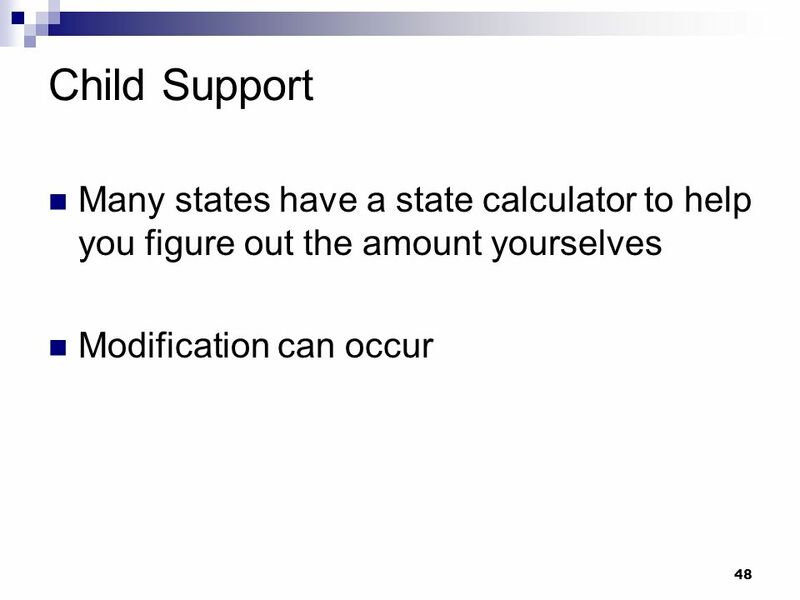 If you need to modify child support, perhaps start by discussing it with your ex. If that doesn’t work, go to mediation or back to court only as a last resort. 20. Your children may never ultimately accept the divorce. It is your role to help them through the process, no matter how long it takes, so they can gain closure on the issue. Be persistent. 21. 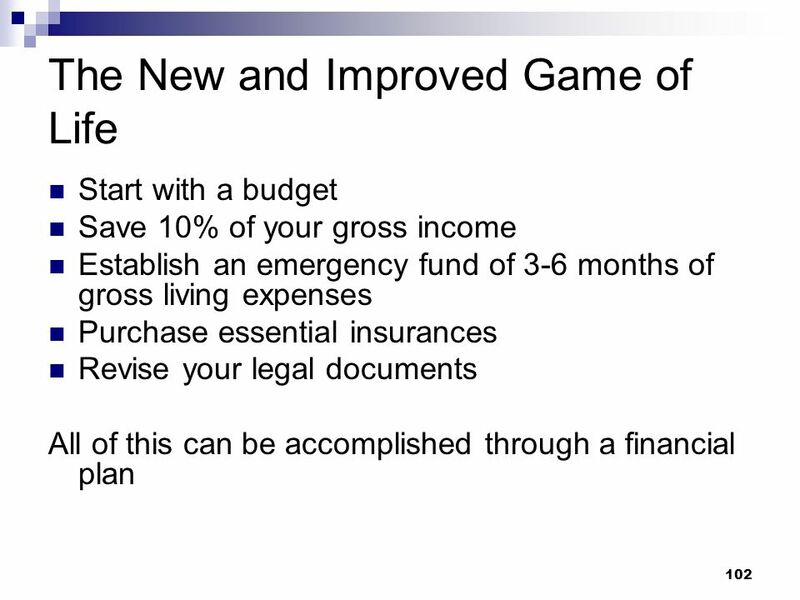 You can try to modify spousal support. Good luck. 22. After the divorce you need to be focusing on your new life. Dating is a starting point. How you work it in with your kids is the tricky issue. Don’t involve the kids early in the process. Only involve them when it becomes serious. One year is probably a good time frame before introducing he kids to your new love interest. 23. If you are living with this new person, have all your issues tied to writing to prevent any future misunderstandings either while alive or at death before marriage through the use of a cohabitation agreement. 24. Prenuptial agreements are a necessity. It sets the expectations from the beginning so everyone knows the deal ahead of time. You always must manage the other side’s expectations both before and after the process, if there is an afterwards. 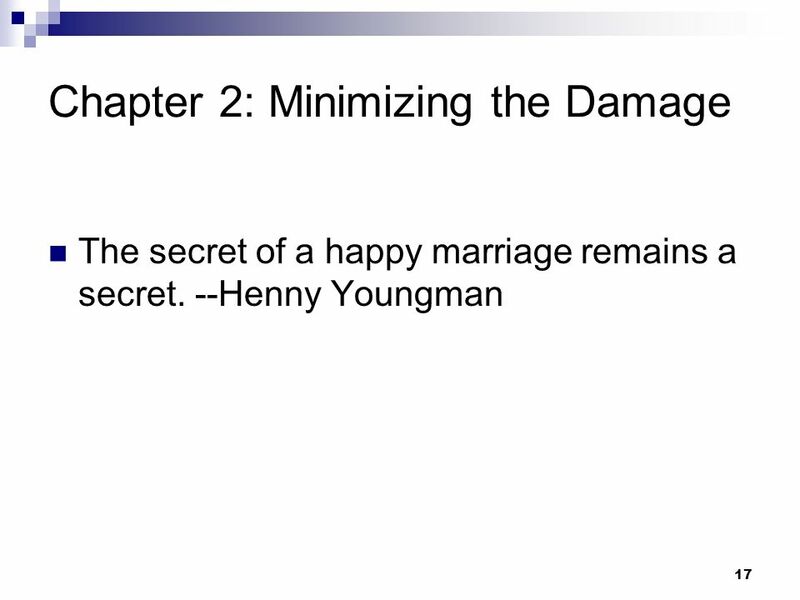 25.Remarriage is tricky business. Make sure your kids and even your ex is ready for it. Protect yourself before it happens. 26. The Brady Bunch may have been shown on TV in the 1970s but it exists more today than during any prior time period. Blending the families will be a constant challenge, so setting the ground rules in advance, managing expectations, and retaining important traditions and values will help go a long way. 27. 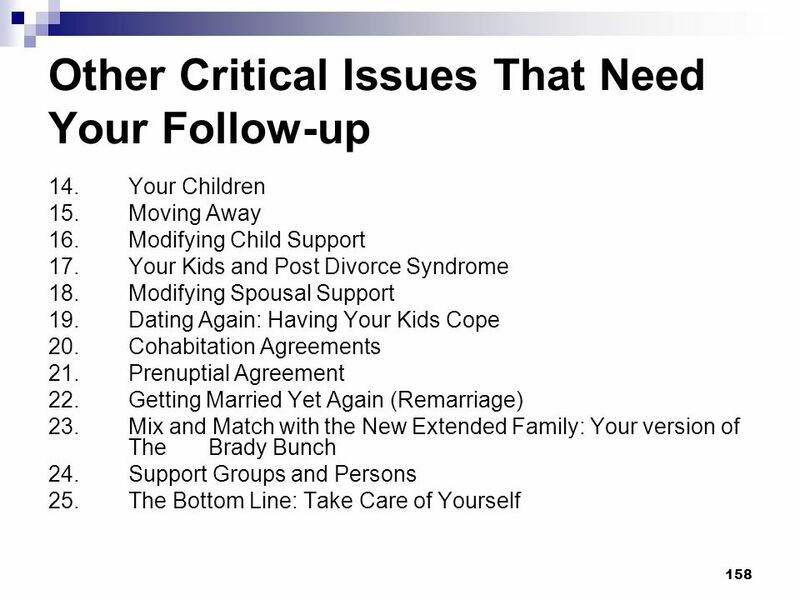 Support groups and individual counseling can help you get over the hump regarding the divorce and put you in a better place to succeed the next time around. 28. When push comes to shove, you need to protect yourself and take care of your main asset – you! Nothing else matters if you can’t walk away from this grueling process happy, healthy and focused. 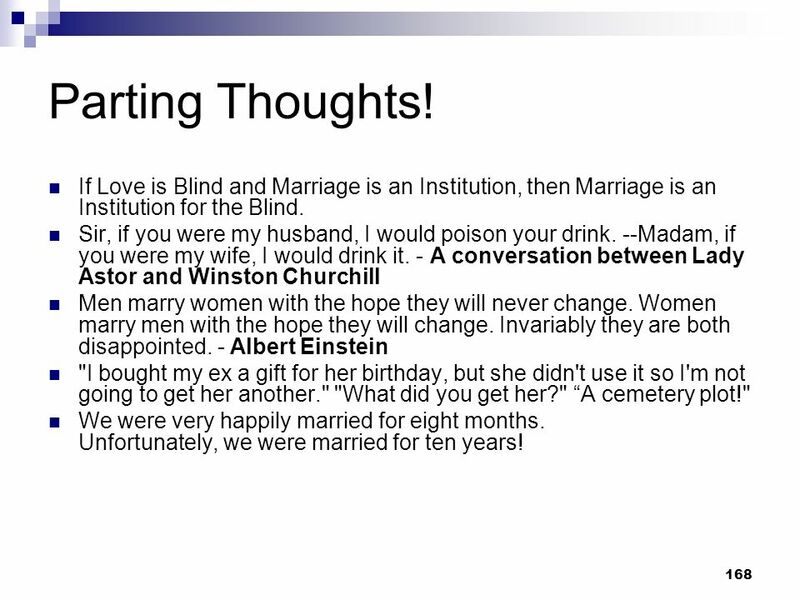 Love may be blind, but marriage is a real eye-opener! 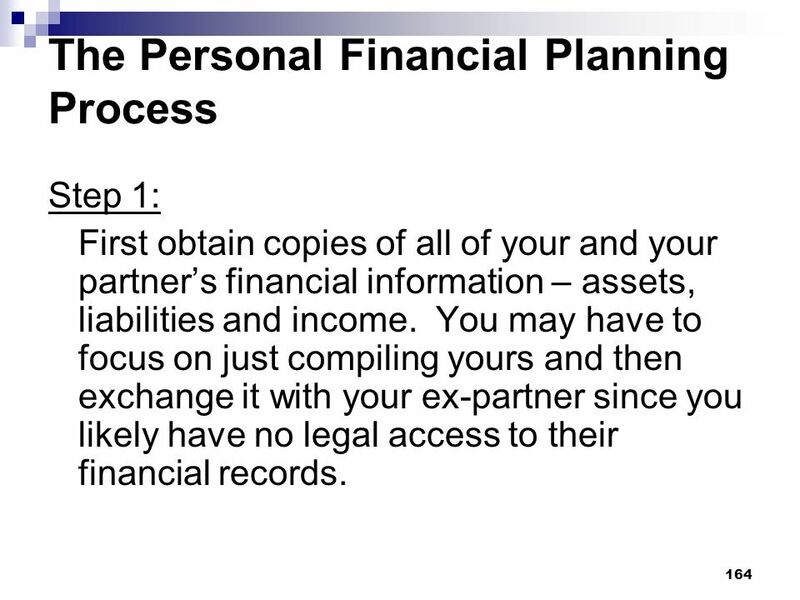 Step 1: First obtain copies of all of your and your partner’s financial information – assets, liabilities and income. 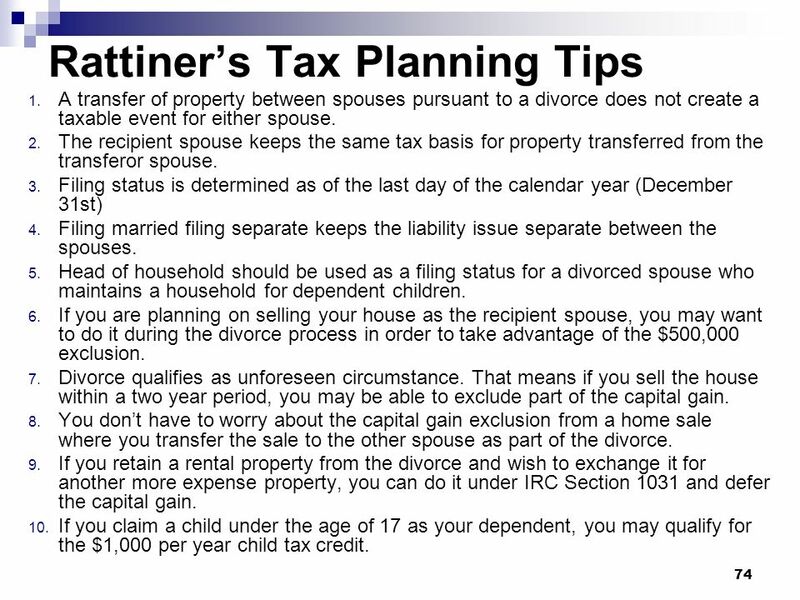 You may have to focus on just compiling yours and then exchange it with your ex-partner since you likely have no legal access to their financial records. 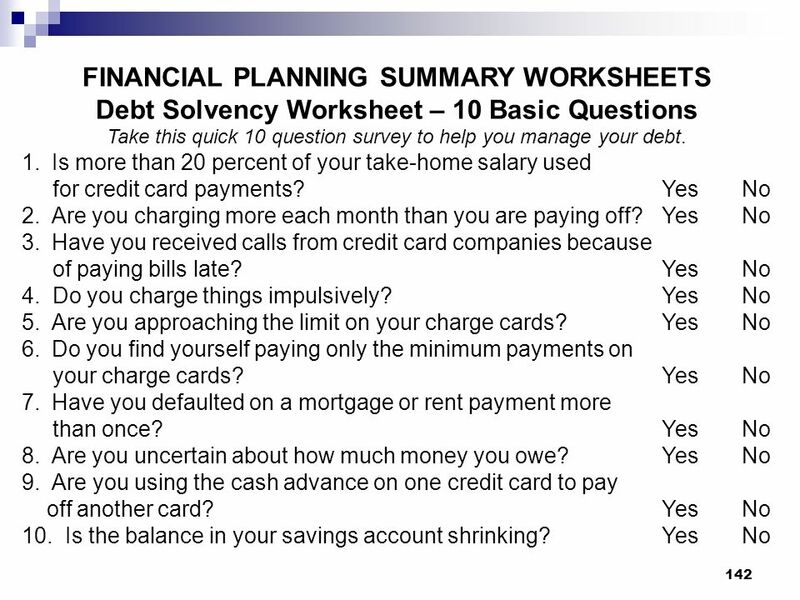 165 Step 2: Compile your financial information into a net worth statement. On the left-hand side of the page list all of your assets. 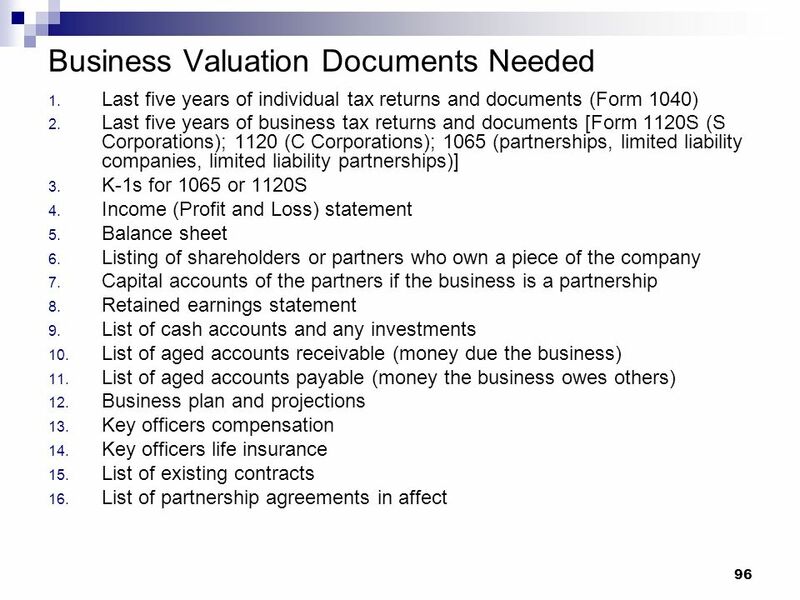 On the right-hand side of the page list all of your liabilities. These should be assets and liabilities held in your name alone, your ex-partner’s name alone and joint held. 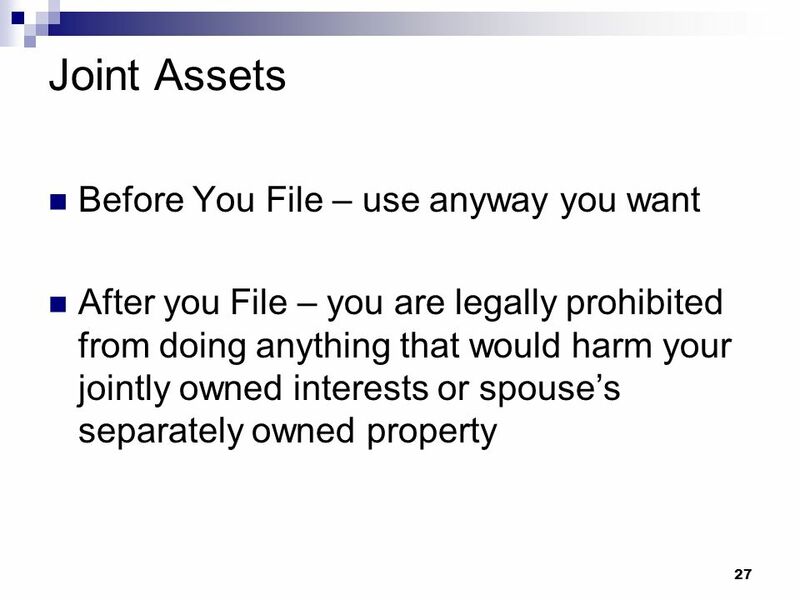 Indicate whether you came in to the relationship with this asset or liability. 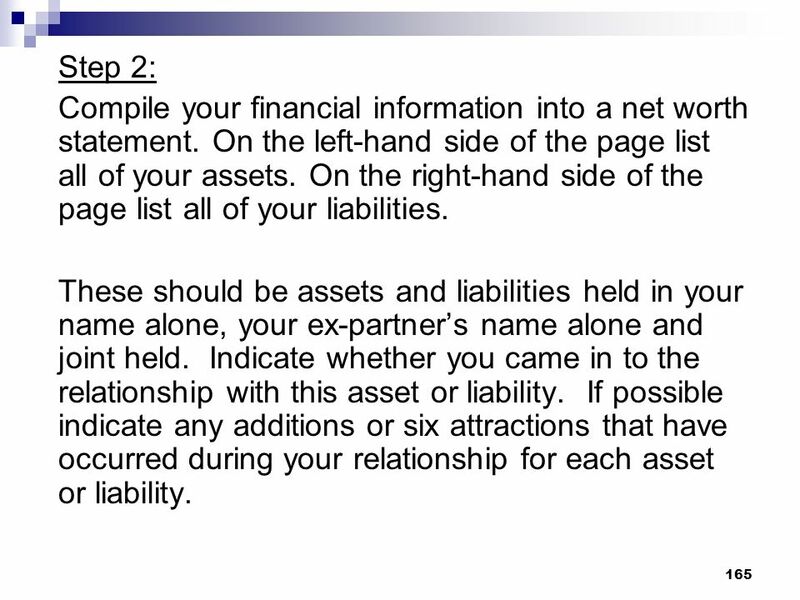 If possible indicate any additions or six attractions that have occurred during your relationship for each asset or liability. 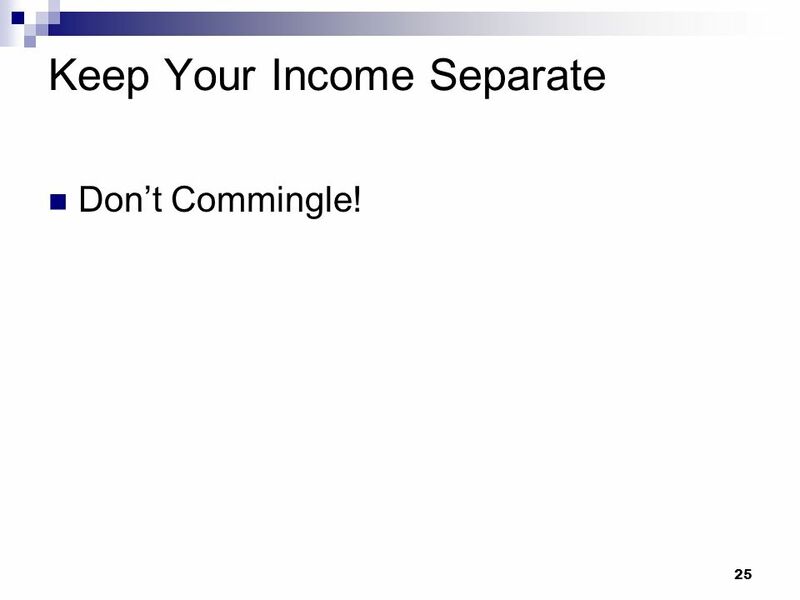 166 Step 3: Gather information regarding the income both you and your partner were making at the time of your long-term commitment. 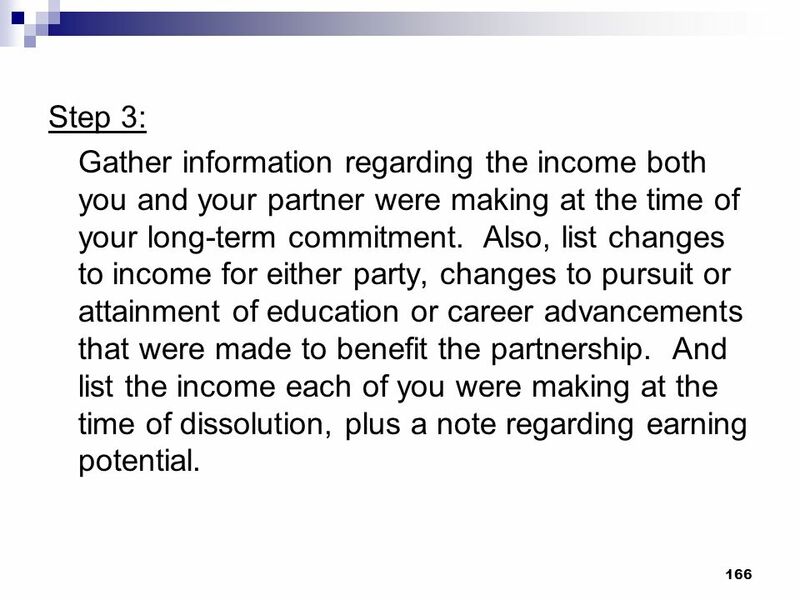 Also, list changes to income for either party, changes to pursuit or attainment of education or career advancements that were made to benefit the partnership. 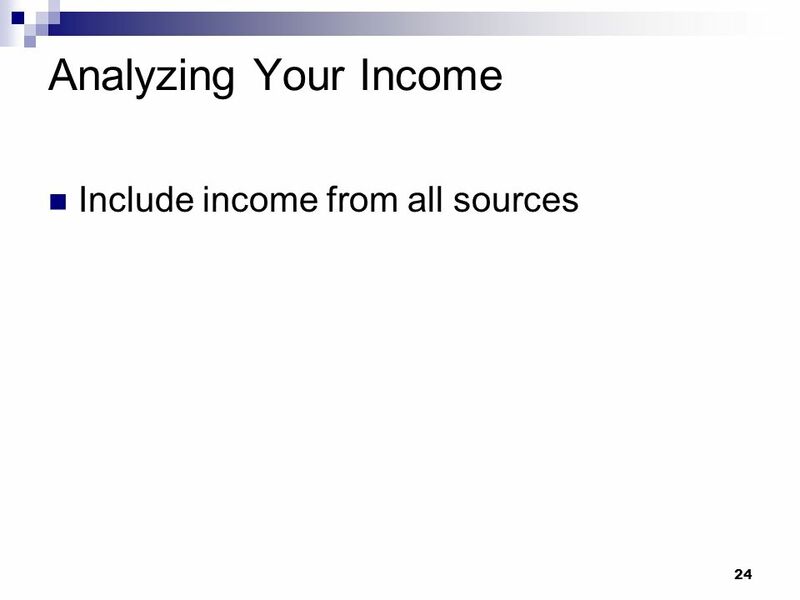 And list the income each of you were making at the time of dissolution, plus a note regarding earning potential. The best option is to stay married, when possible. If not, then you need to be smart, practical and shrewd about getting divorced. It’s an occurrence, that if not done right, can have devastating financial and emotional repercussions for the rest of your life! 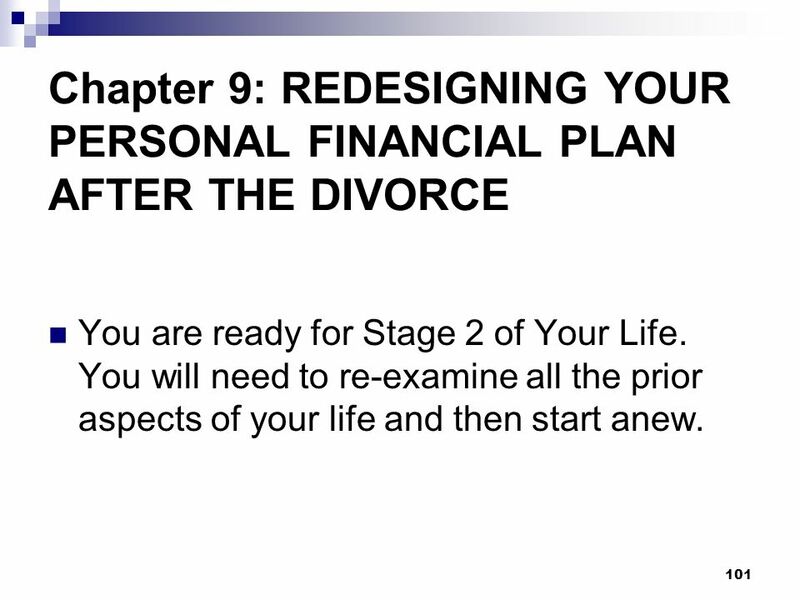 Your own personal financial planning for divorce can never be more important or have a bigger impact than now! All of the information shared today can be found in detail in my latest book published by John Wiley and Sons. 168 Parting Thoughts! If Love is Blind and Marriage is an Institution, then Marriage is an Institution for the Blind. Sir, if you were my husband, I would poison your drink. --Madam, if you were my wife, I would drink it. - A conversation between Lady Astor and Winston Churchill Men marry women with the hope they will never change. Women marry men with the hope they will change. Invariably they are both disappointed. - Albert Einstein "I bought my ex a gift for her birthday, but she didn't use it so I'm not going to get her another." "What did you get her?" “A cemetery plot!" We were very happily married for eight months. Unfortunately, we were married for ten years! 169 The Lesson! A cop tries to pull over a guy for speeding who tries to outrun him. Finally the guy gives up and pulls over. The now ticked-off cop walks up and yells at the guy, “Hey, what's the big idea?" The guy responds, Well officer, I have a very good reason for not stopping sooner. 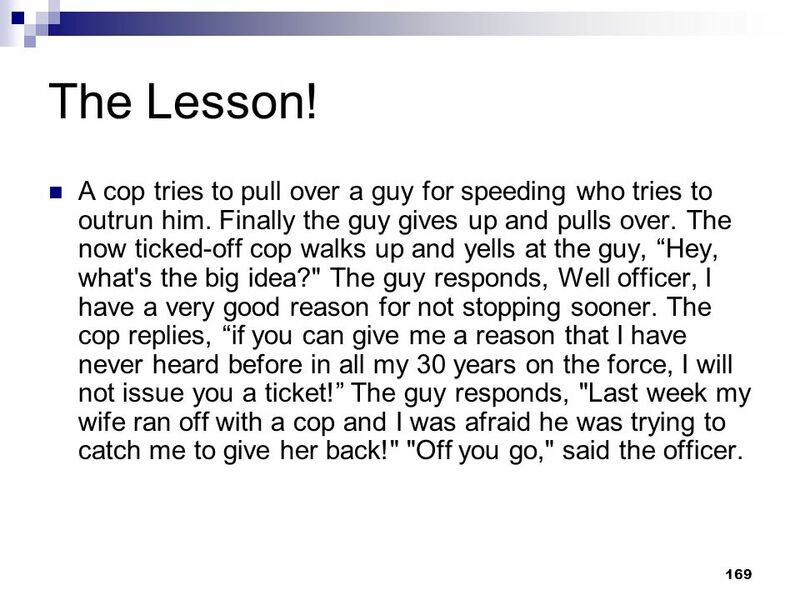 The cop replies, “if you can give me a reason that I have never heard before in all my 30 years on the force, I will not issue you a ticket!” The guy responds, "Last week my wife ran off with a cop and I was afraid he was trying to catch me to give her back!" "Off you go," said the officer. 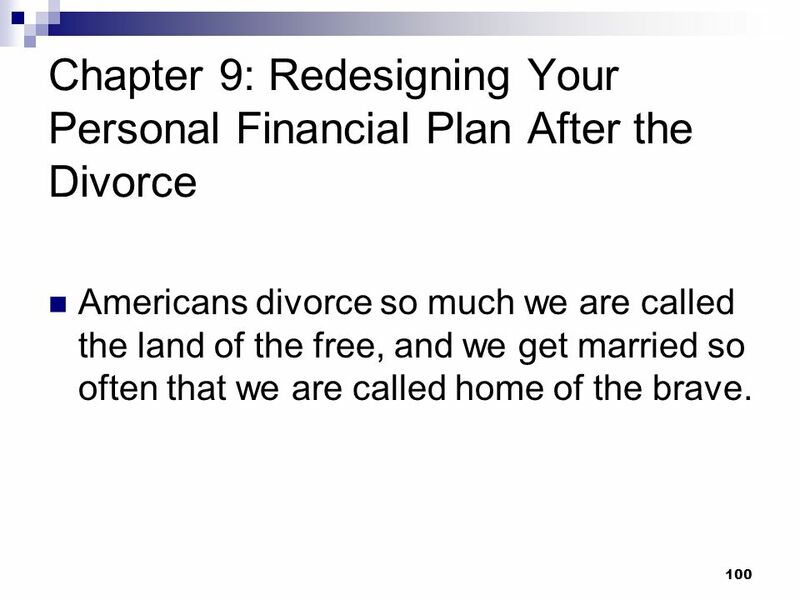 Download ppt "Personal Financial Planning for Divorce FPA MA-November 19, 2010"
/0503 Business & Legal Reports, Inc. BLRs Human Resources Training Presentations Explaining 401(k) to Employees 2005 UPDATES.